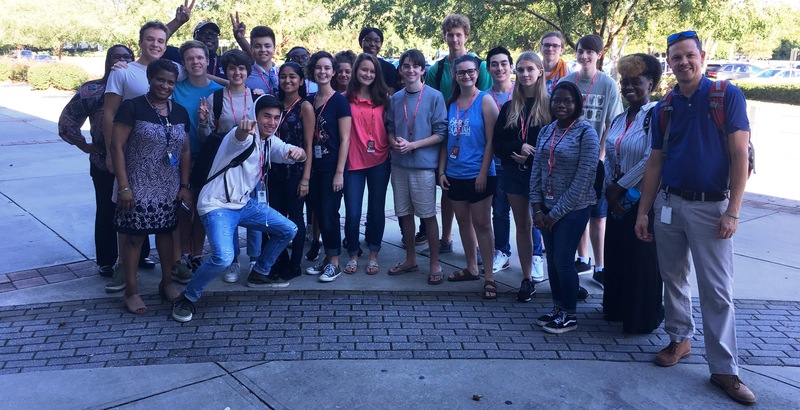 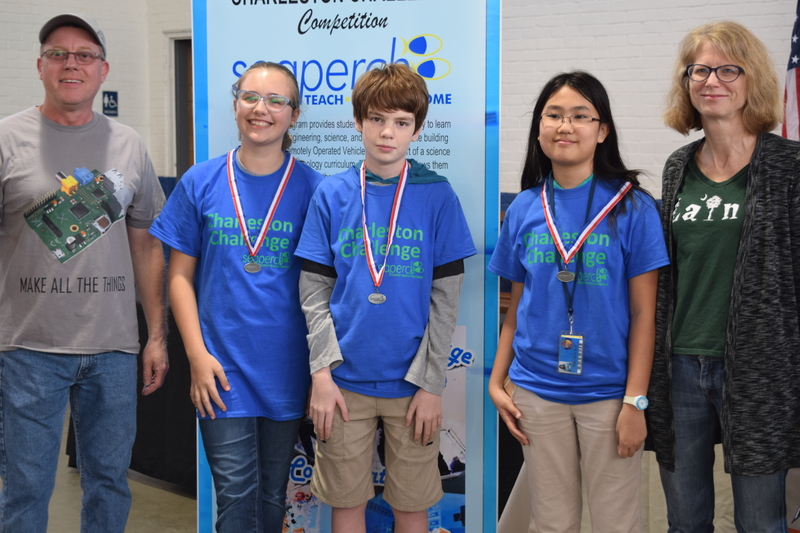 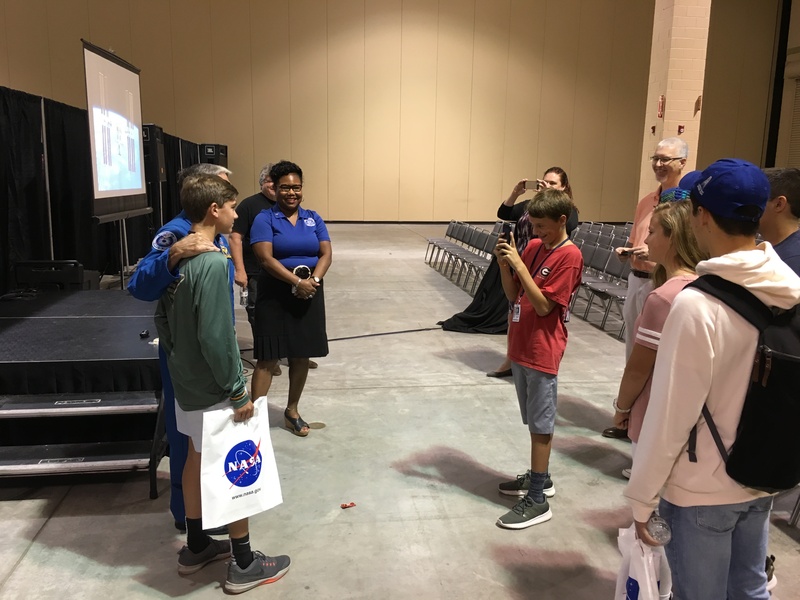 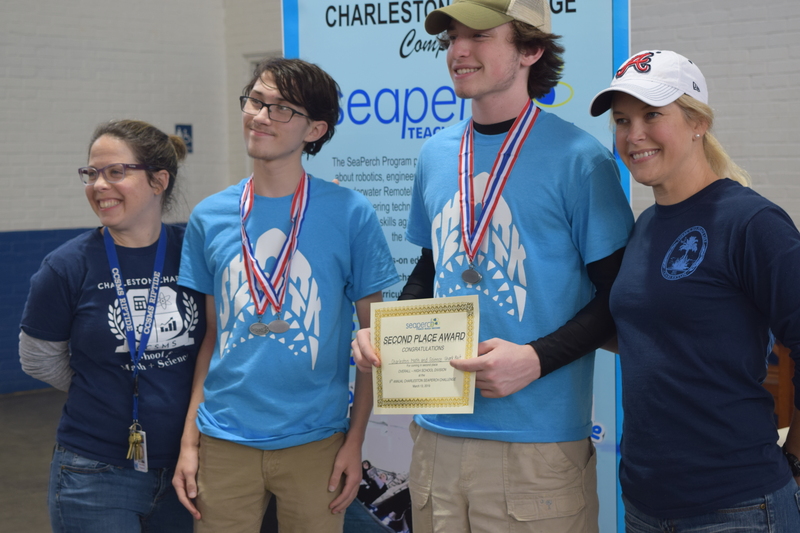 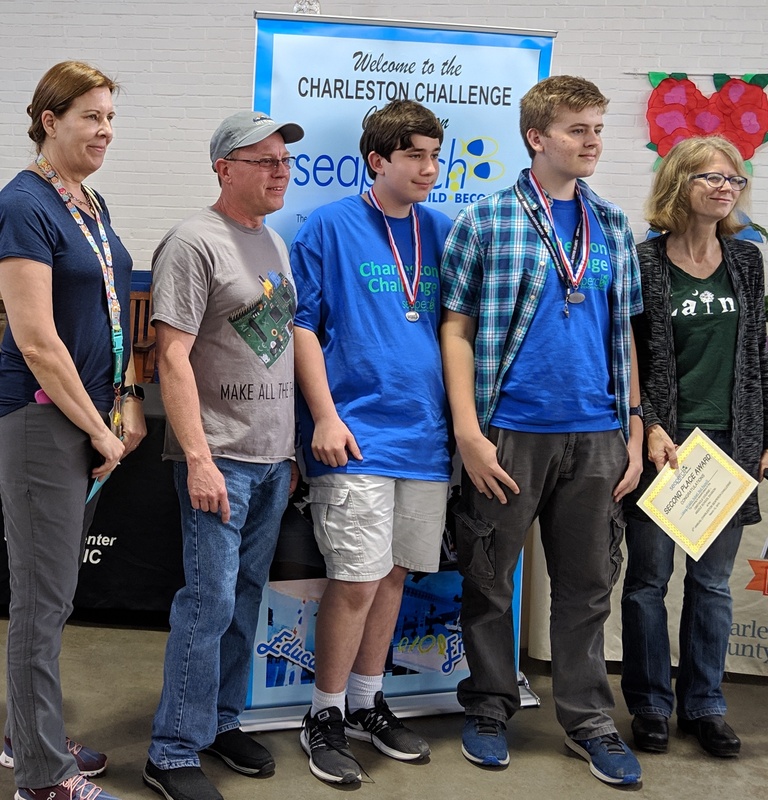 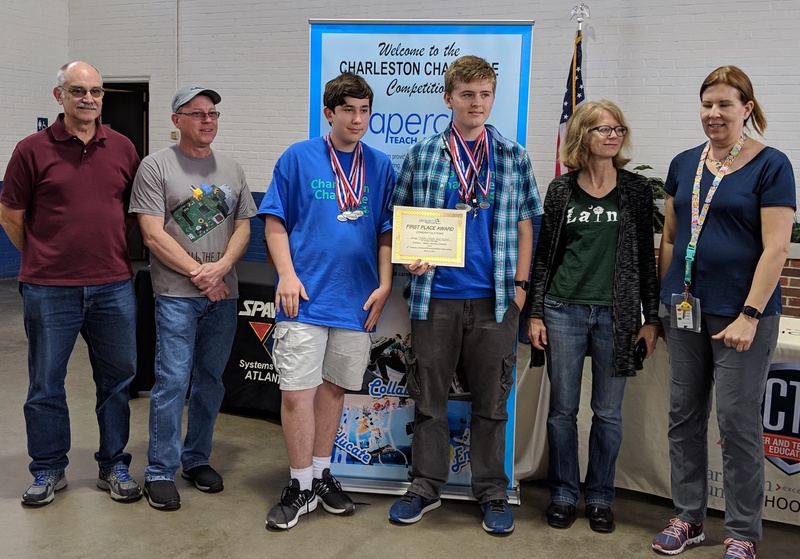 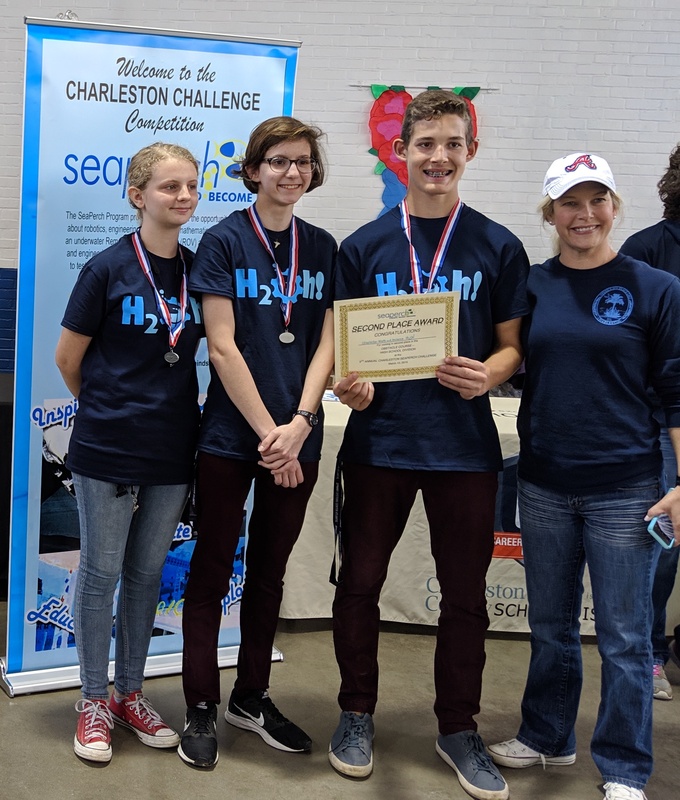 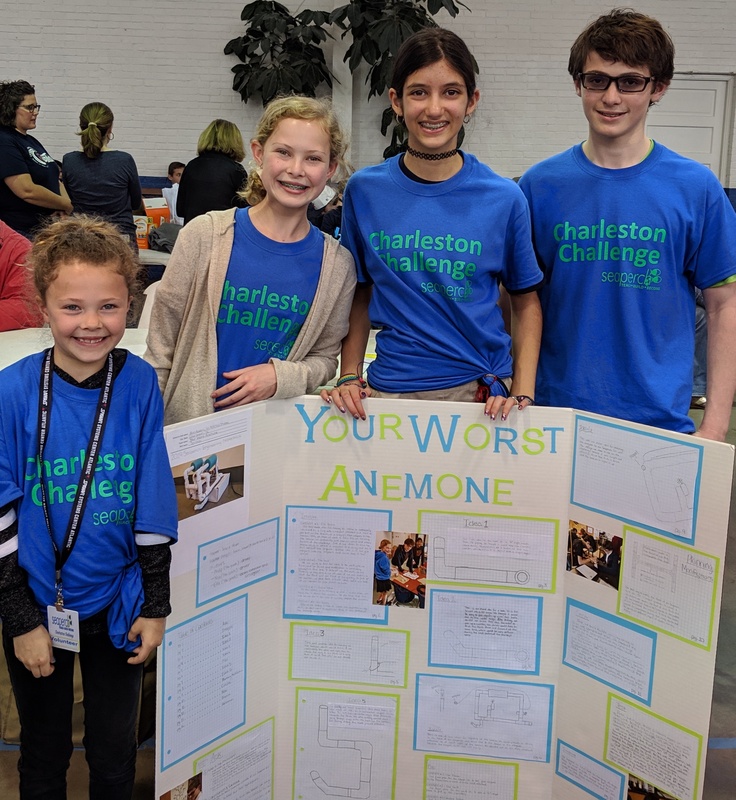 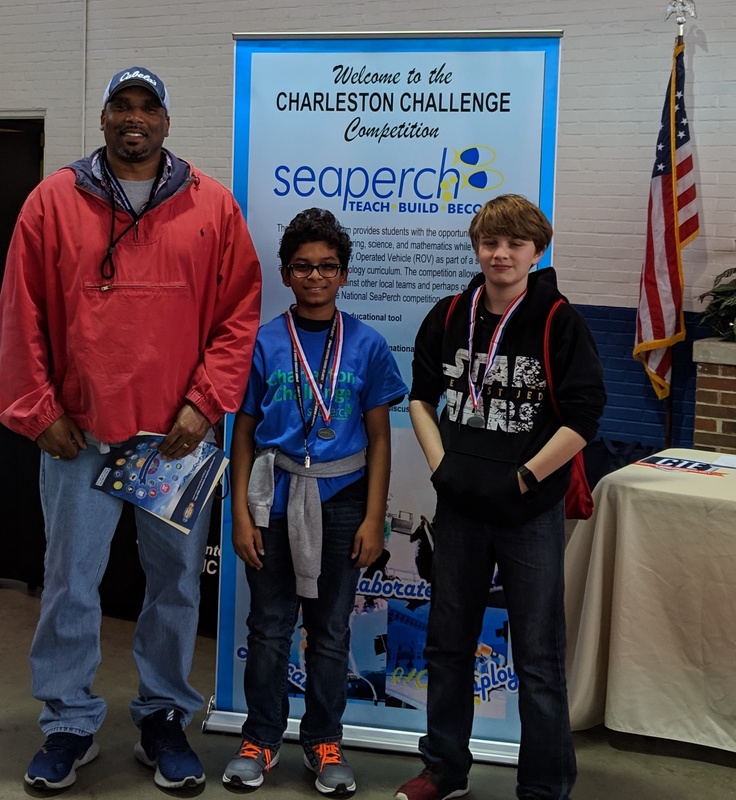 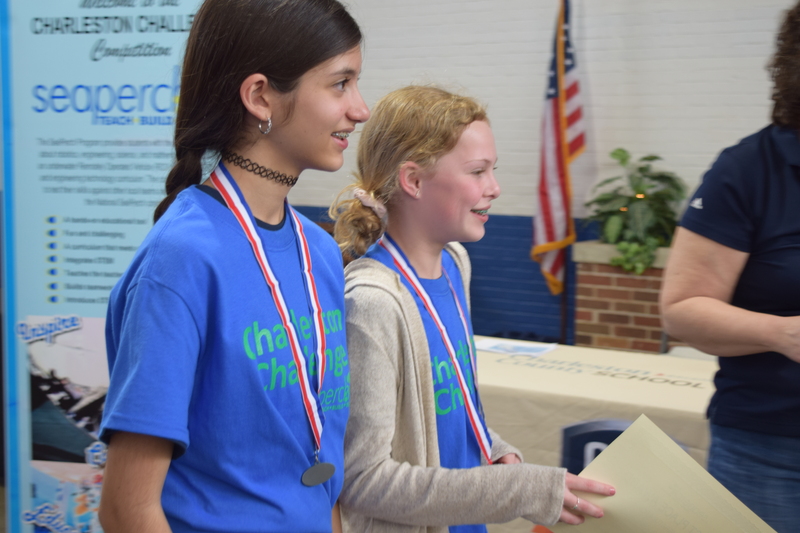 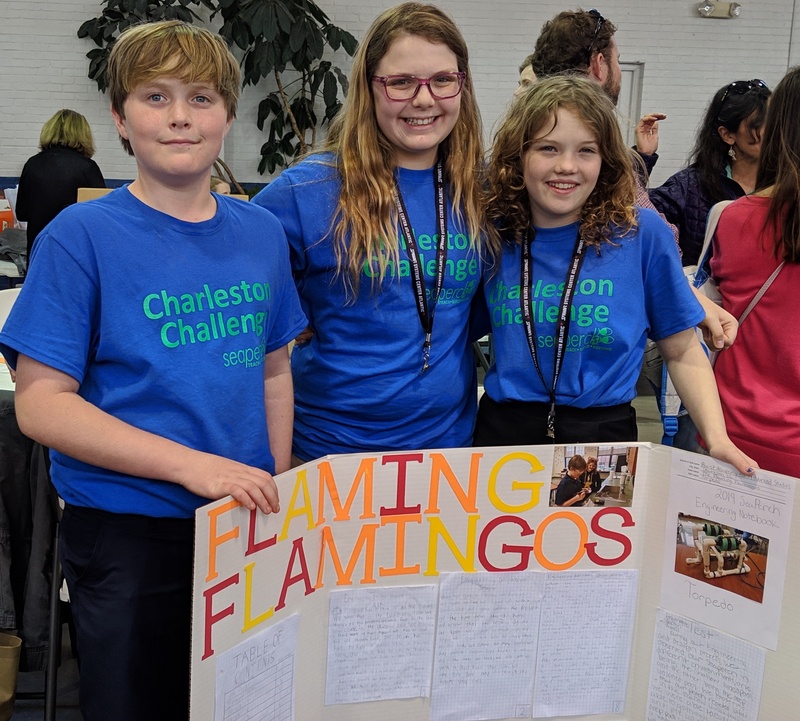 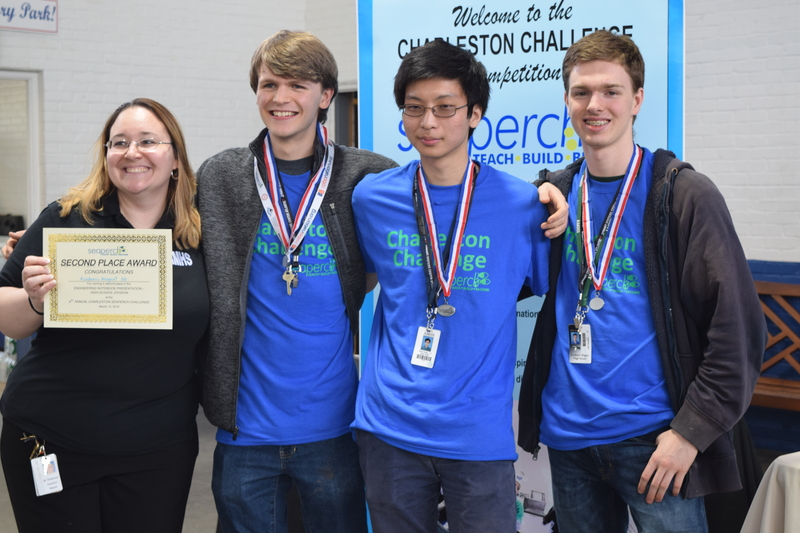 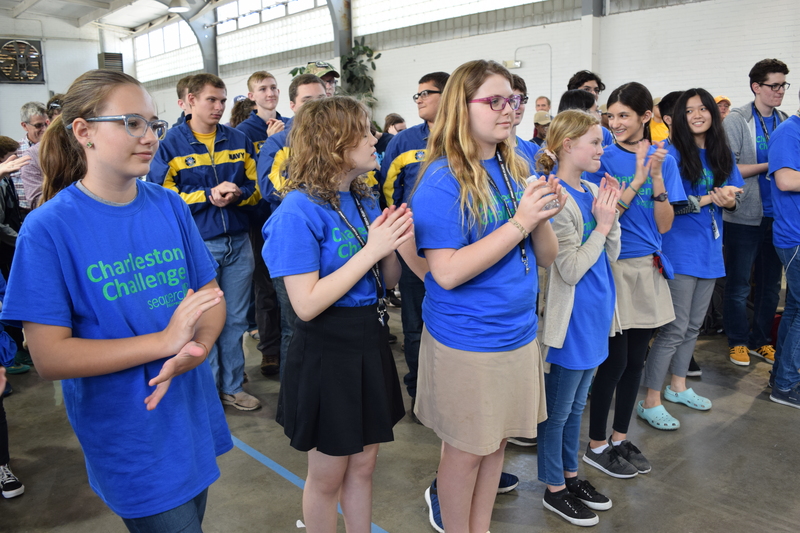 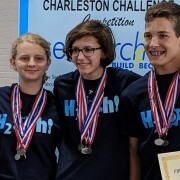 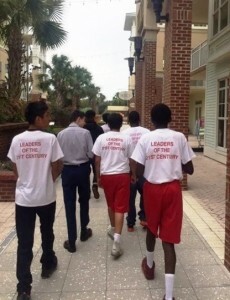 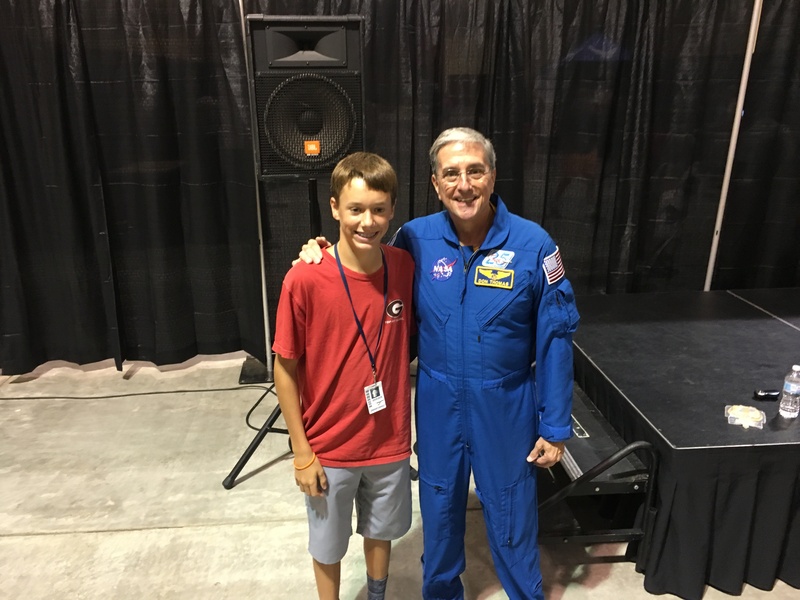 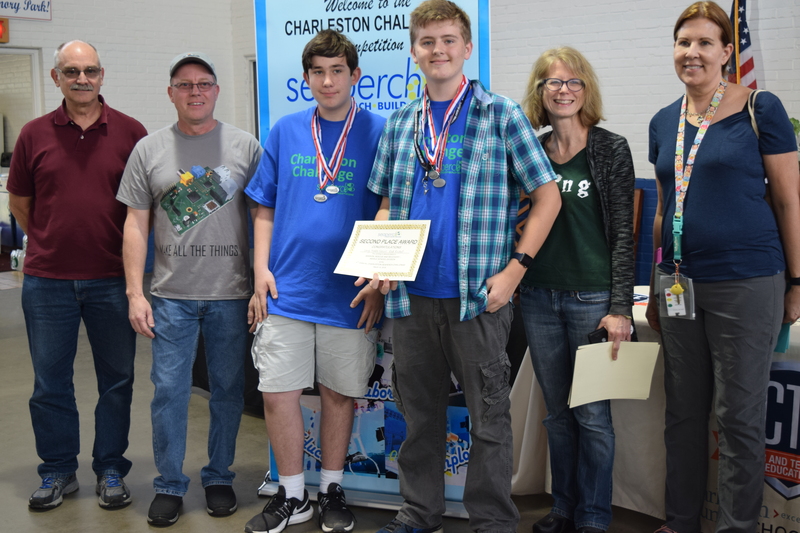 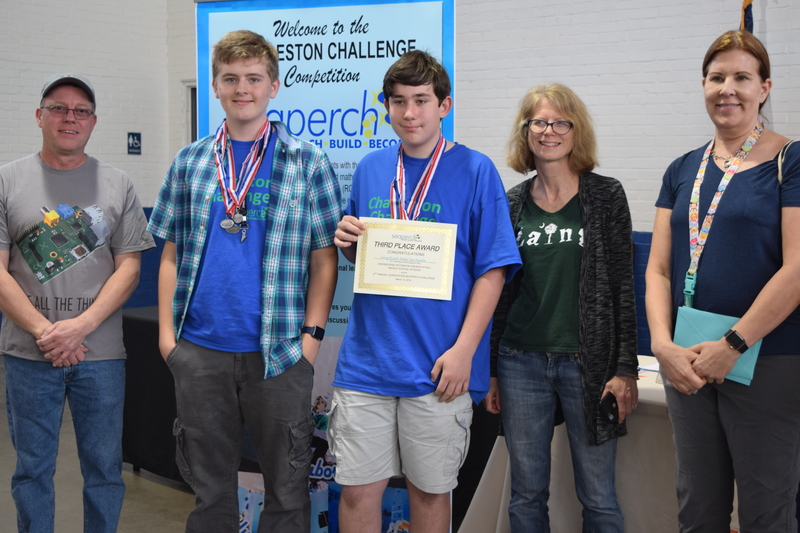 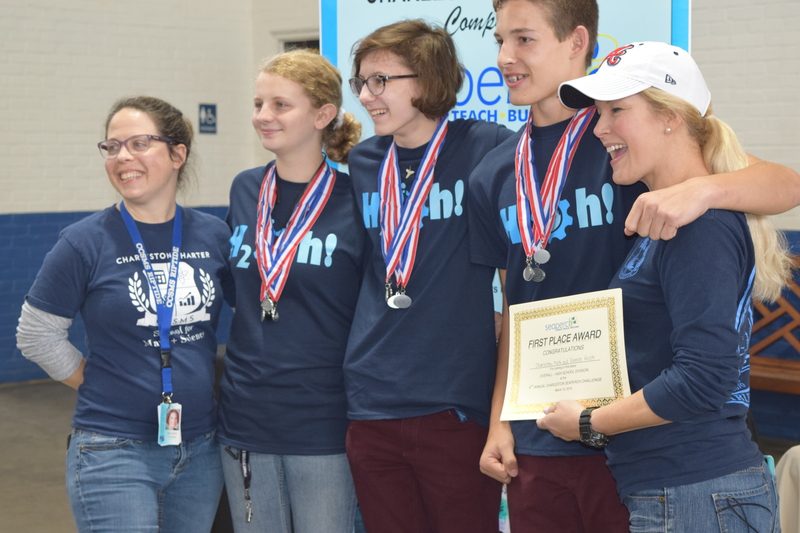 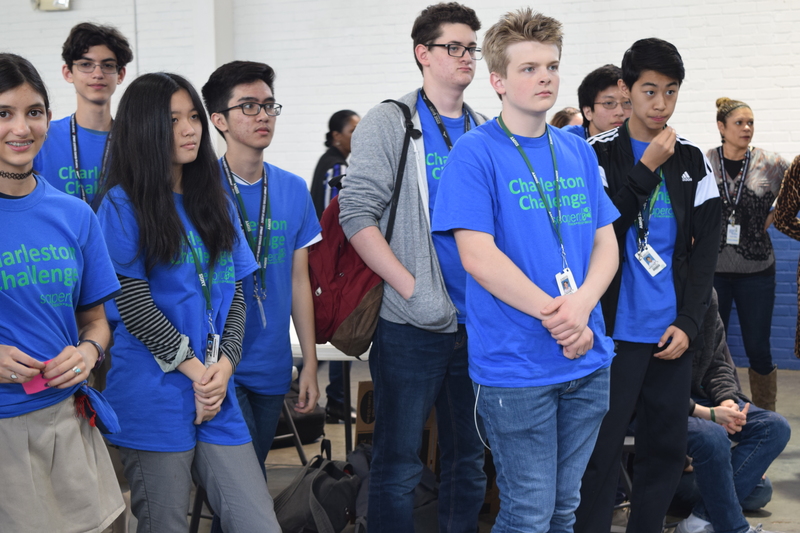 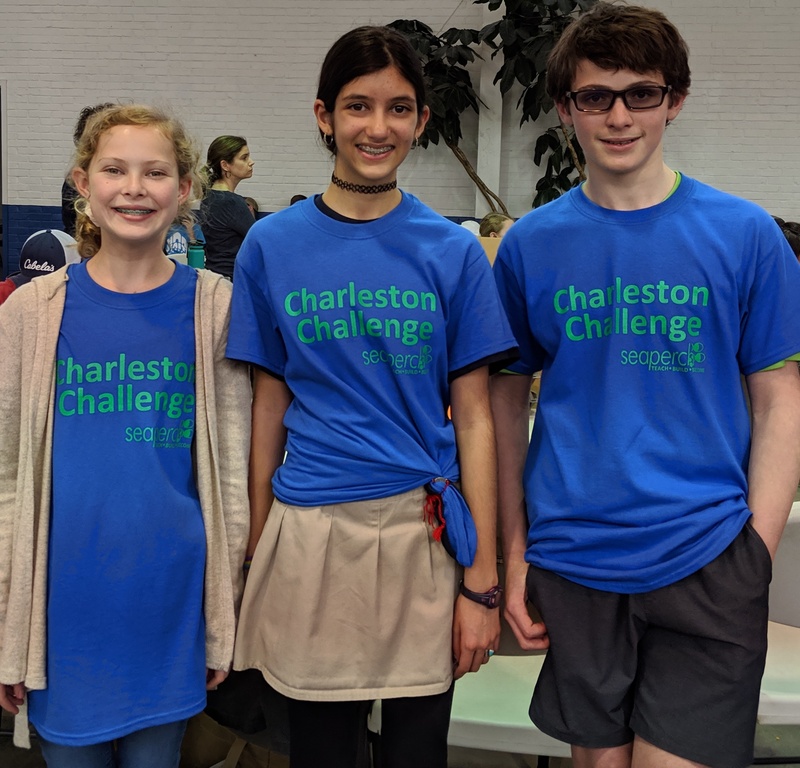 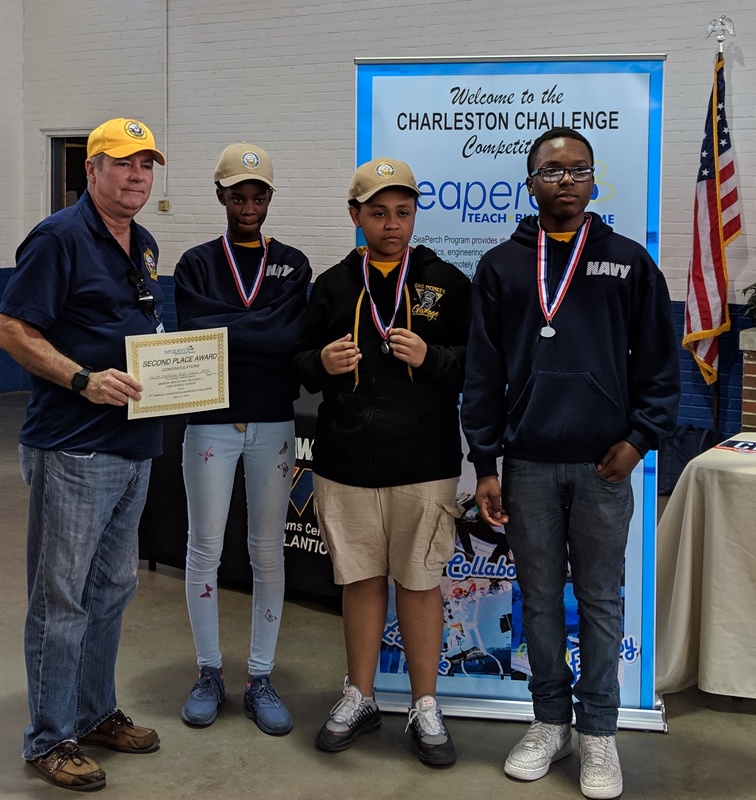 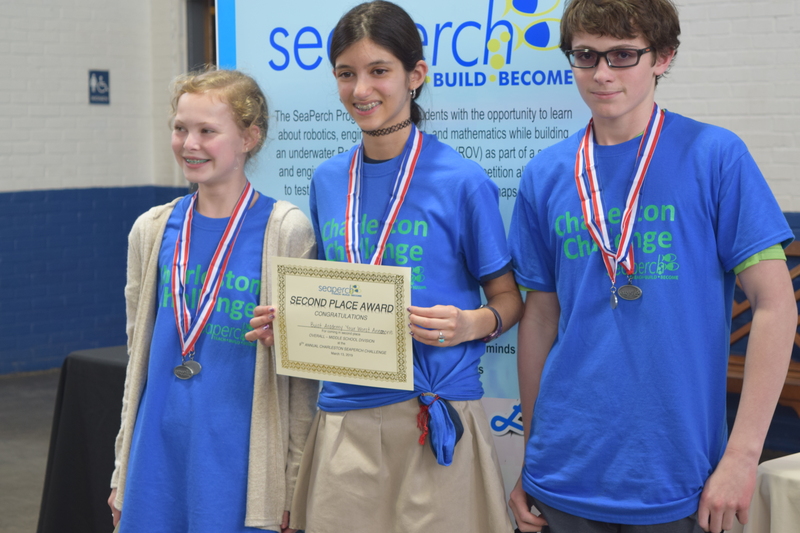 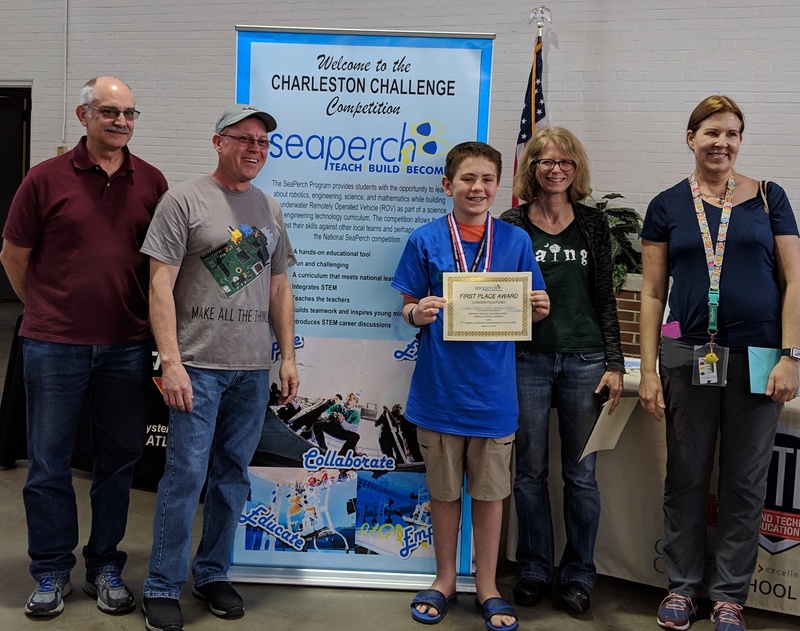 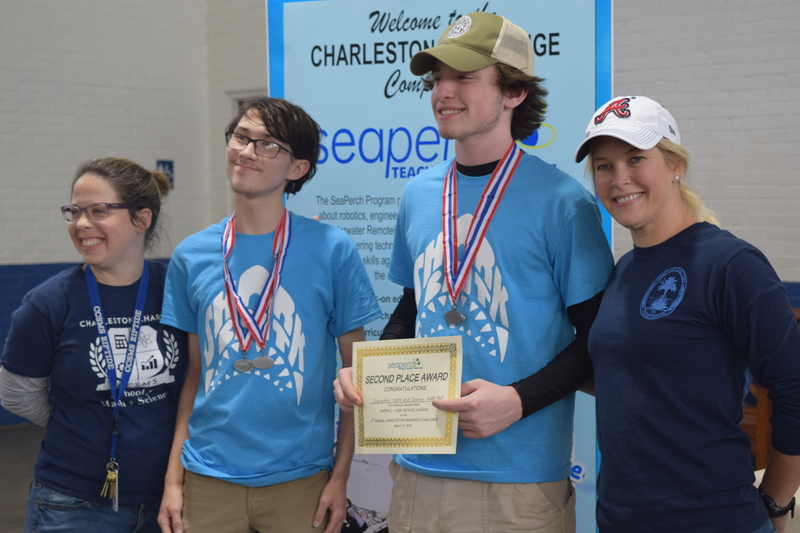 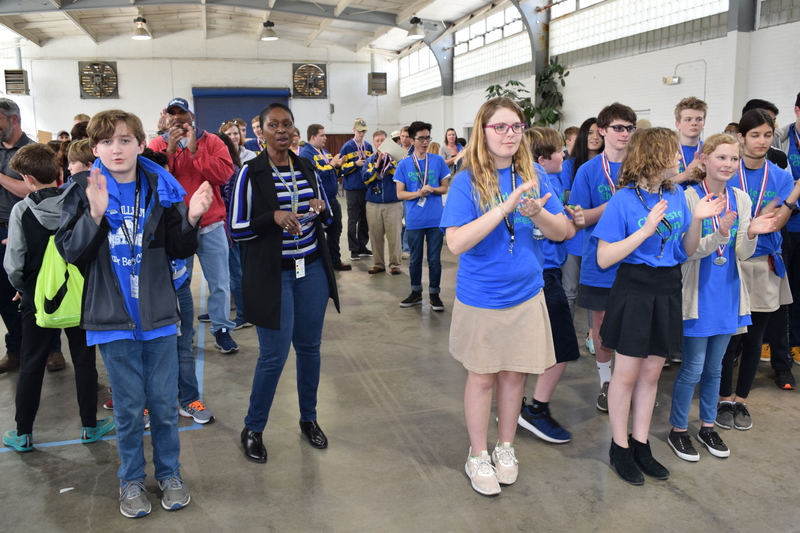 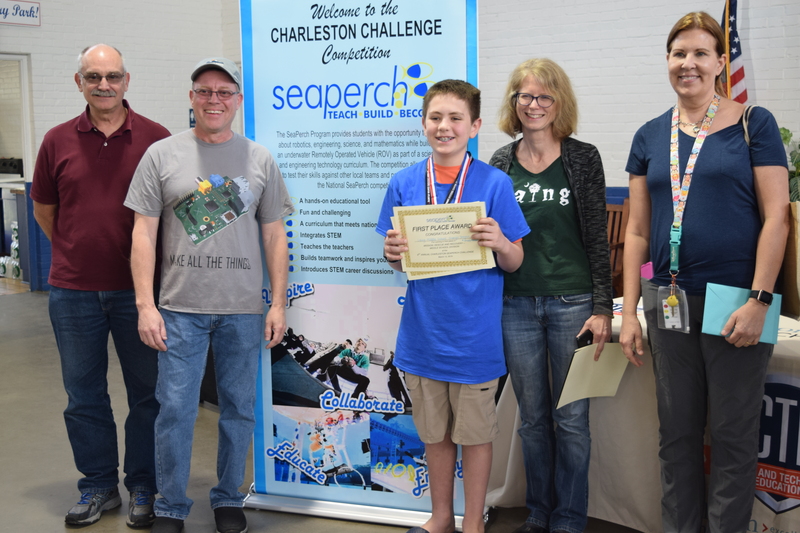 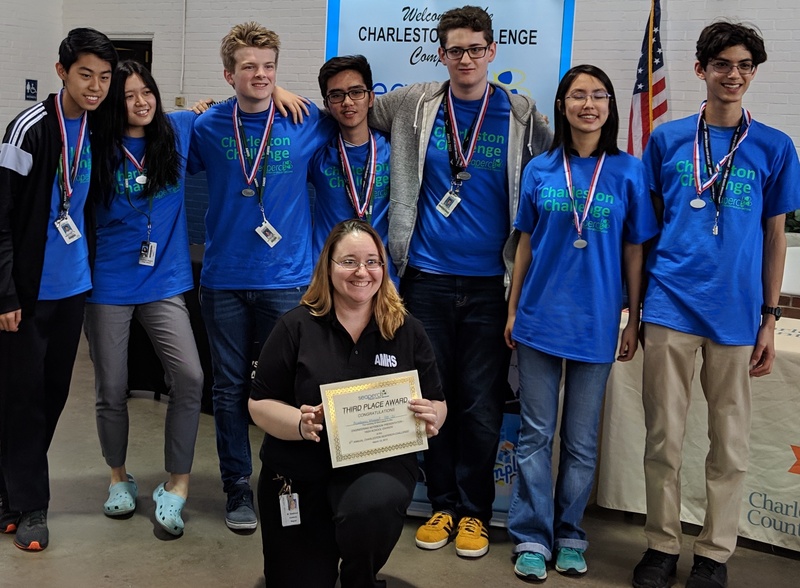 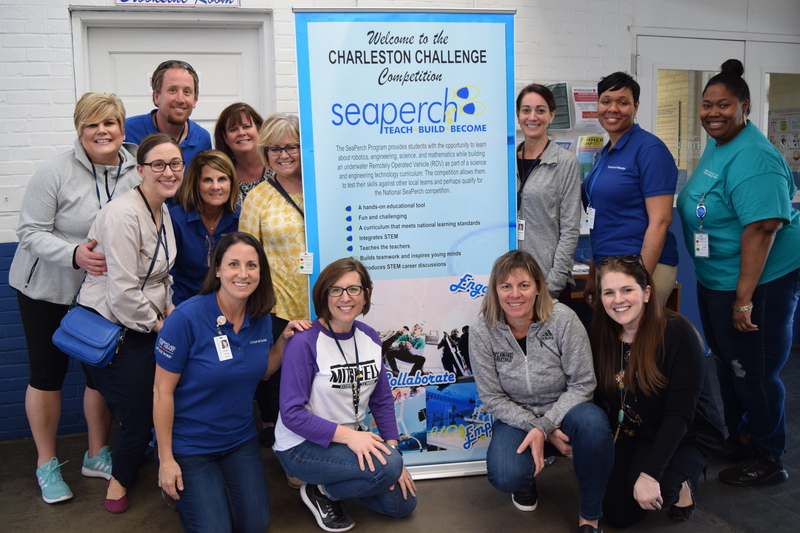 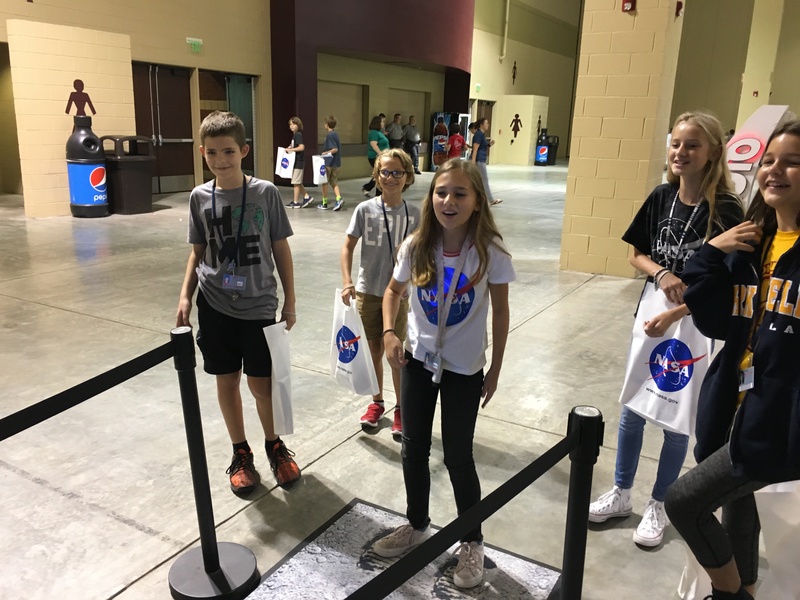 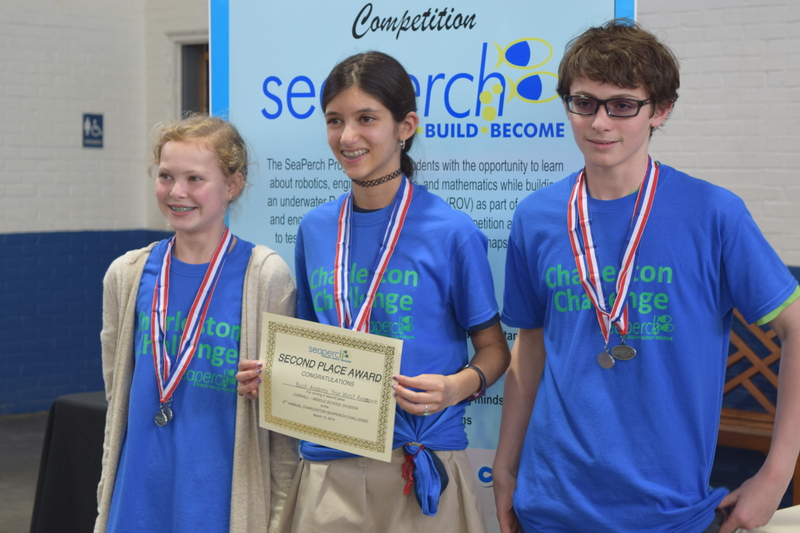 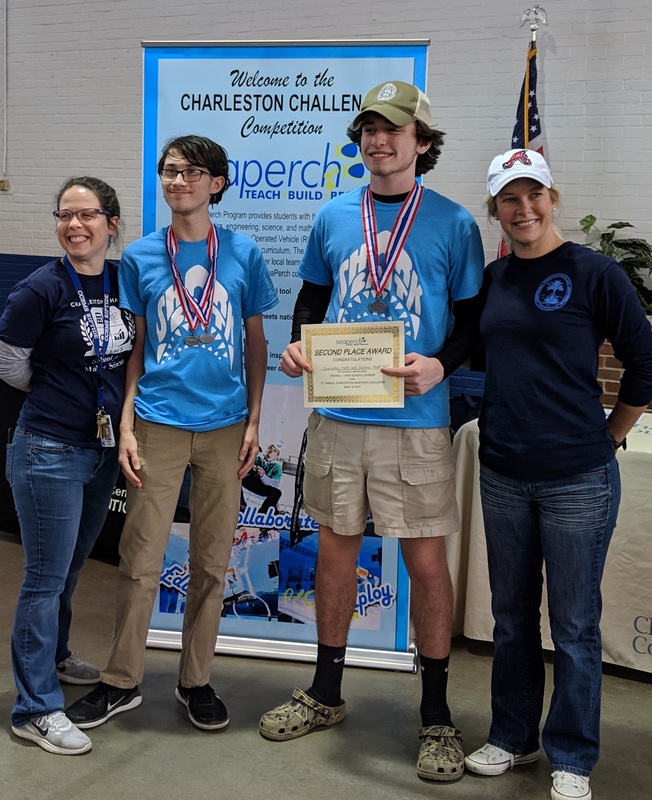 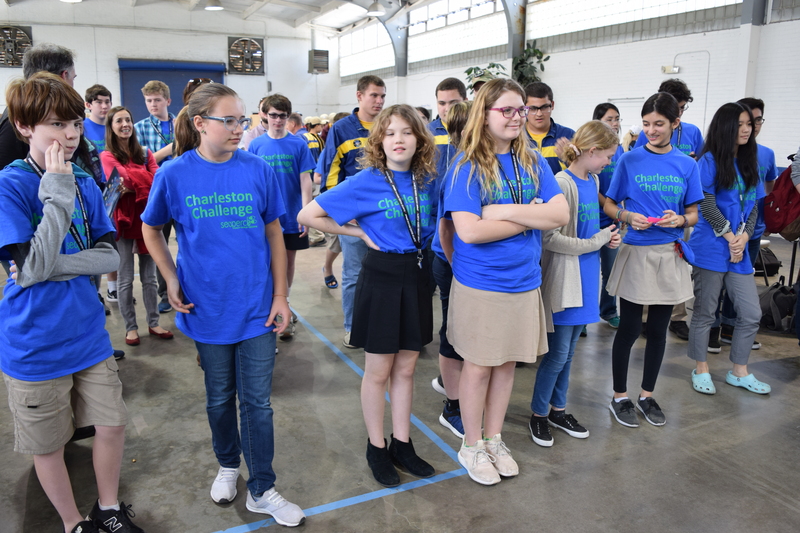 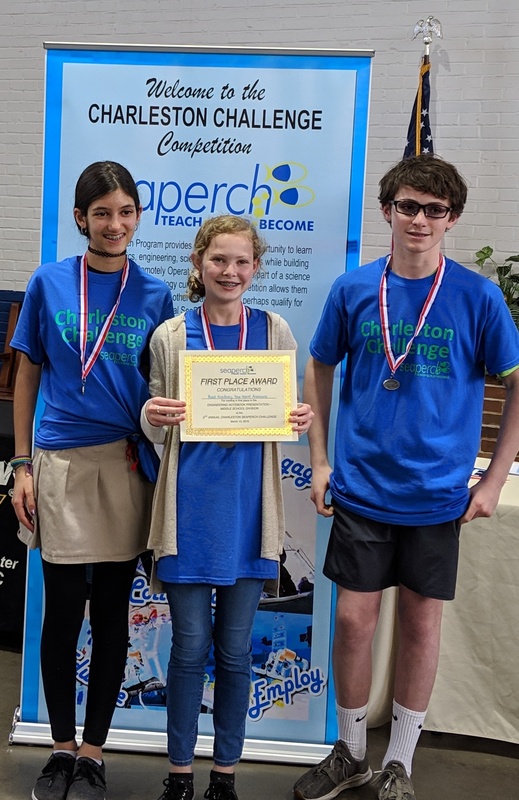 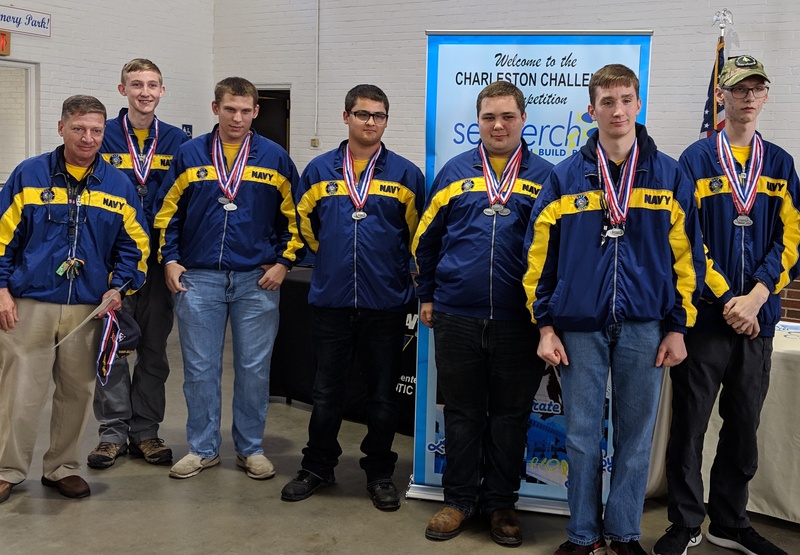 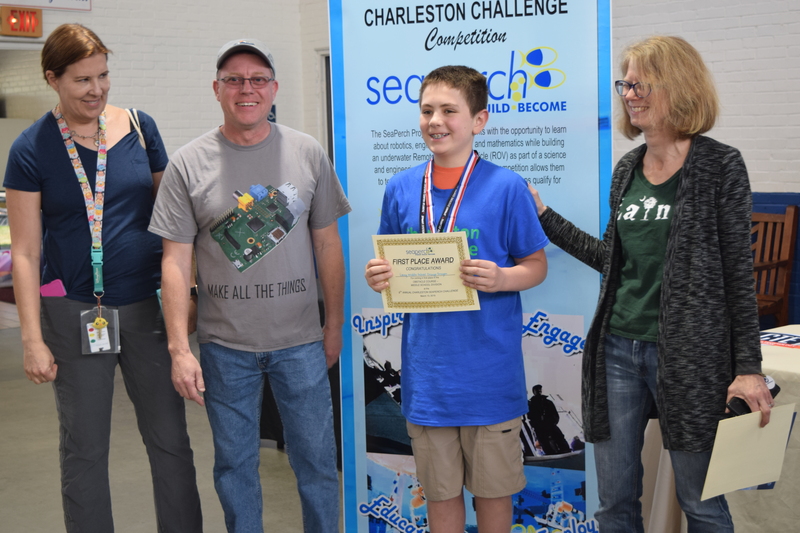 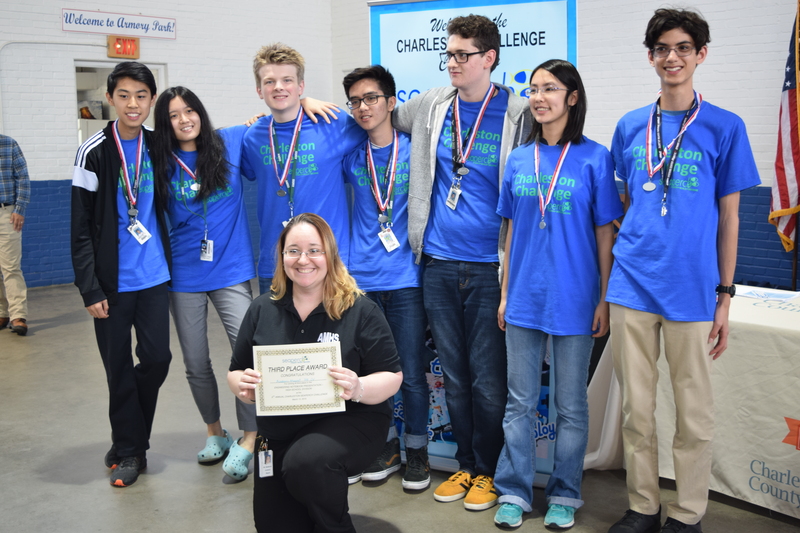 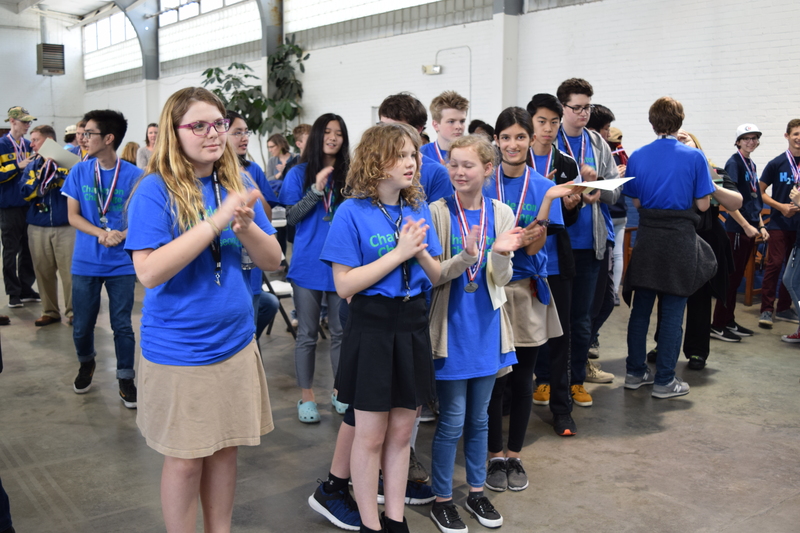 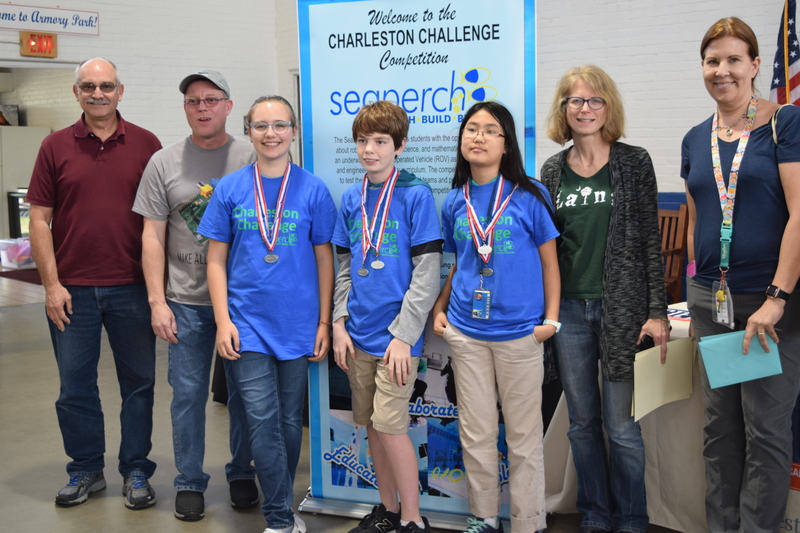 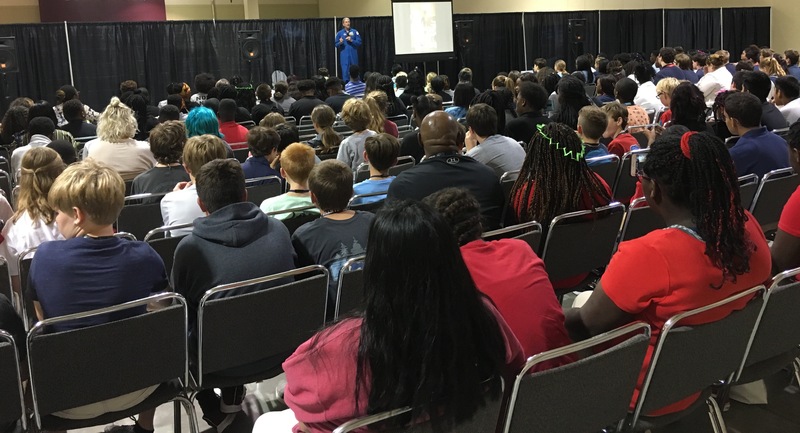 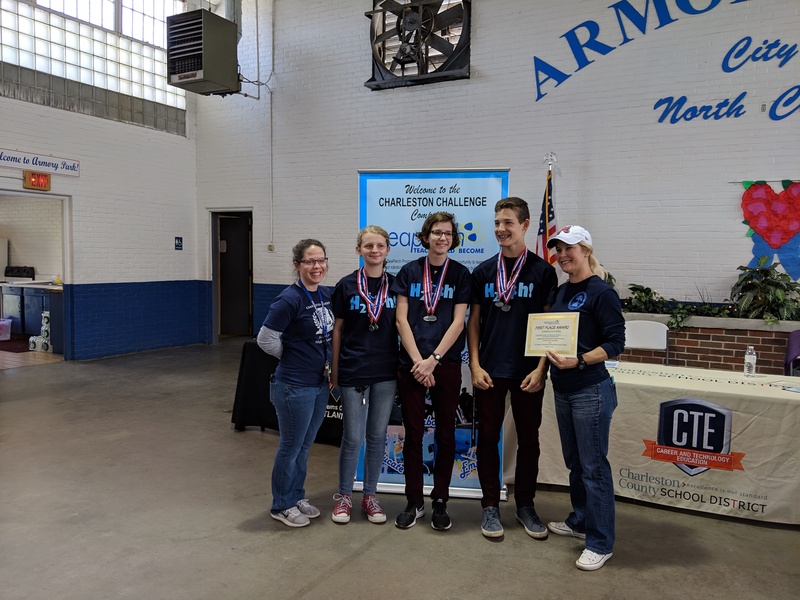 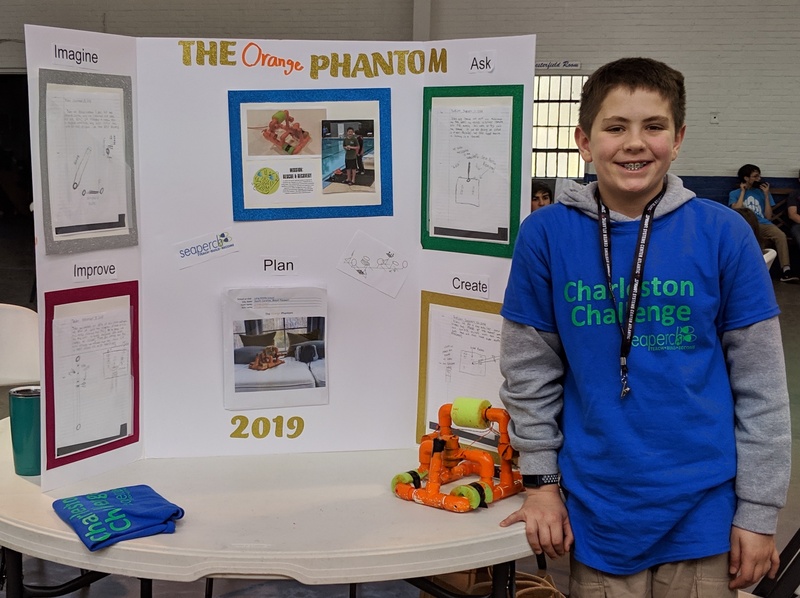 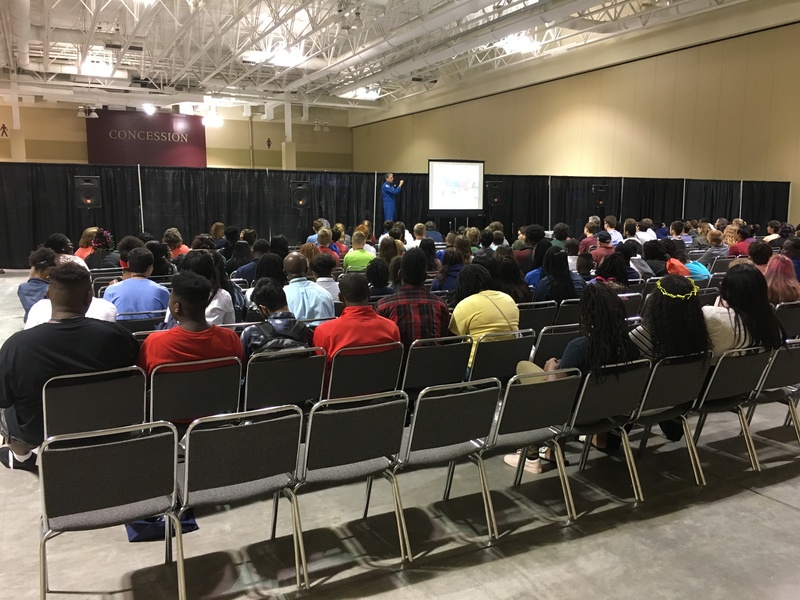 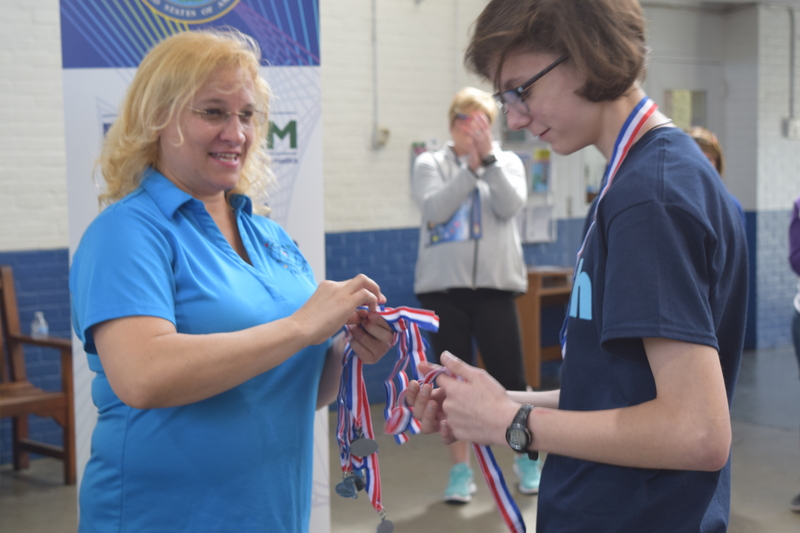 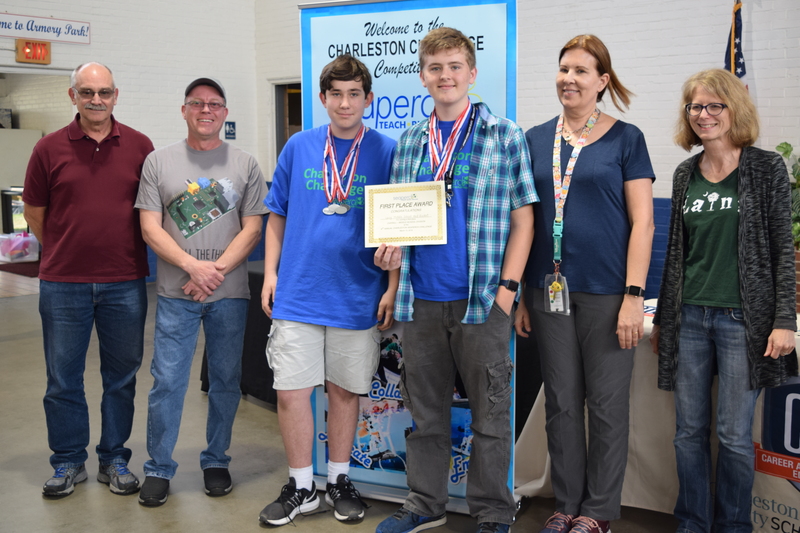 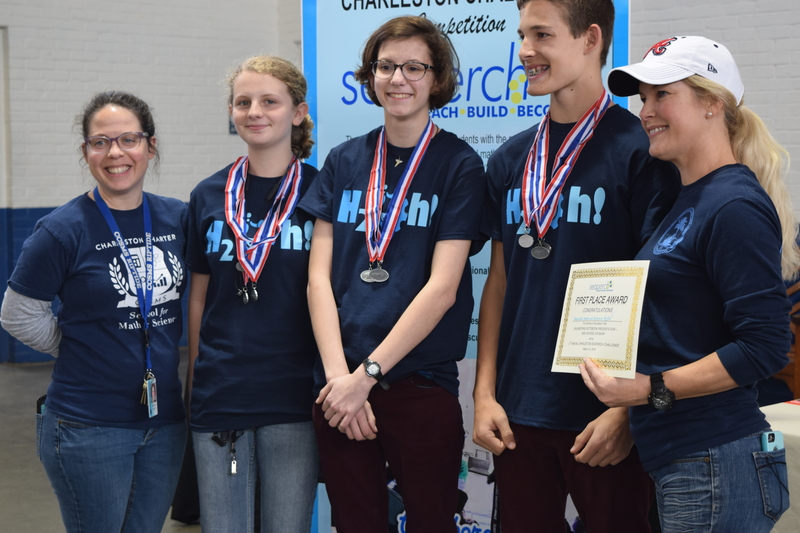 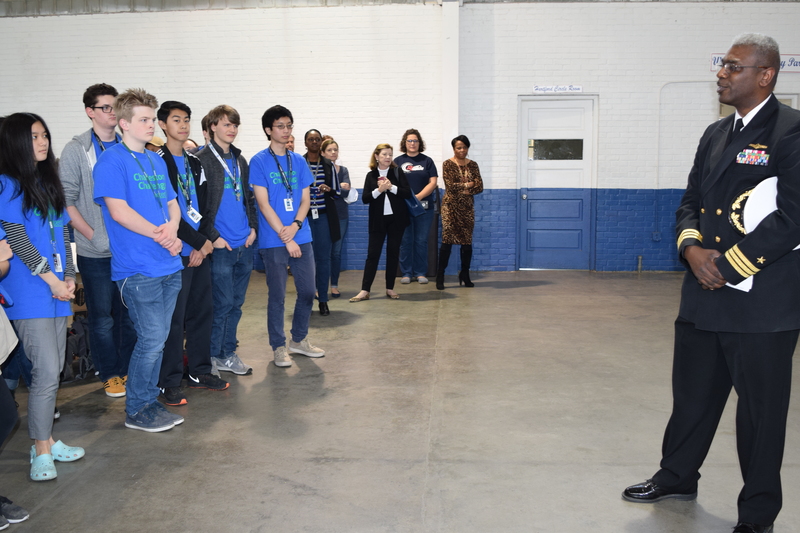 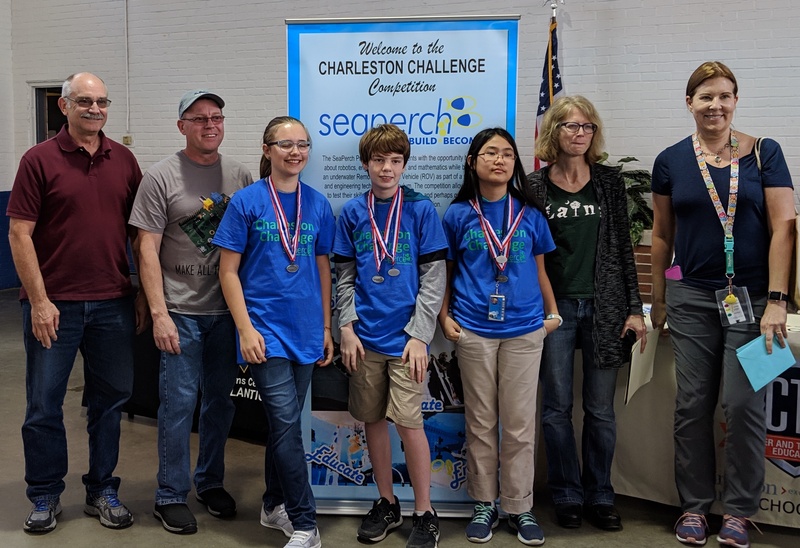 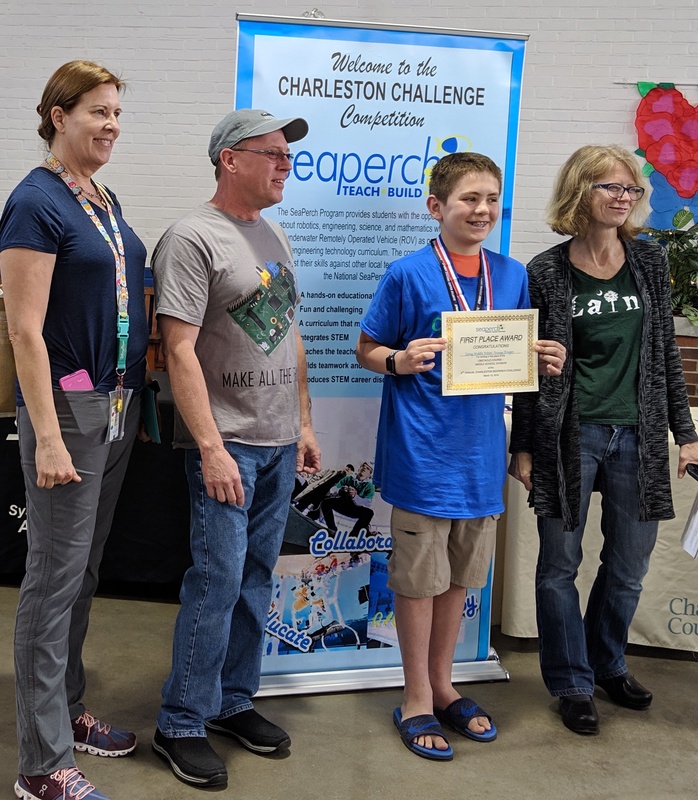 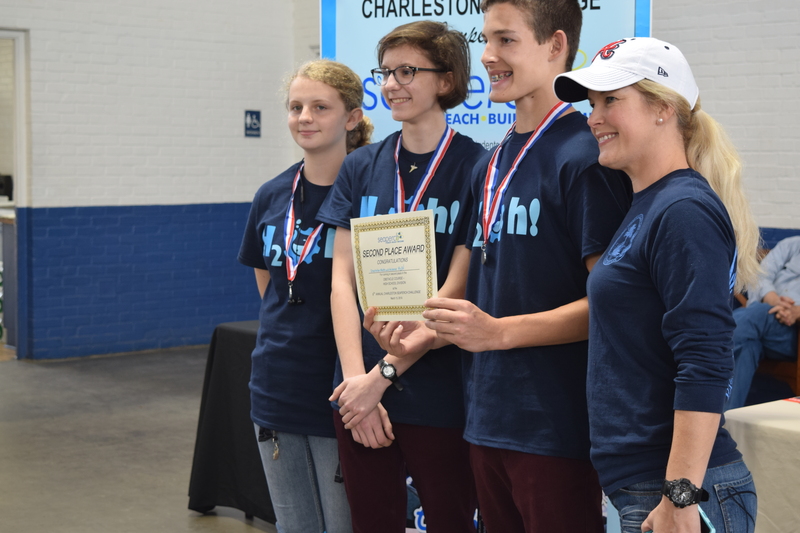 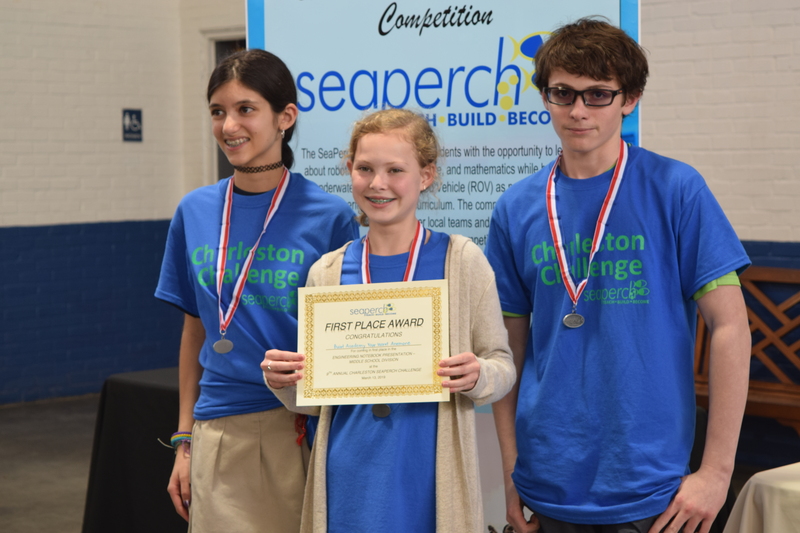 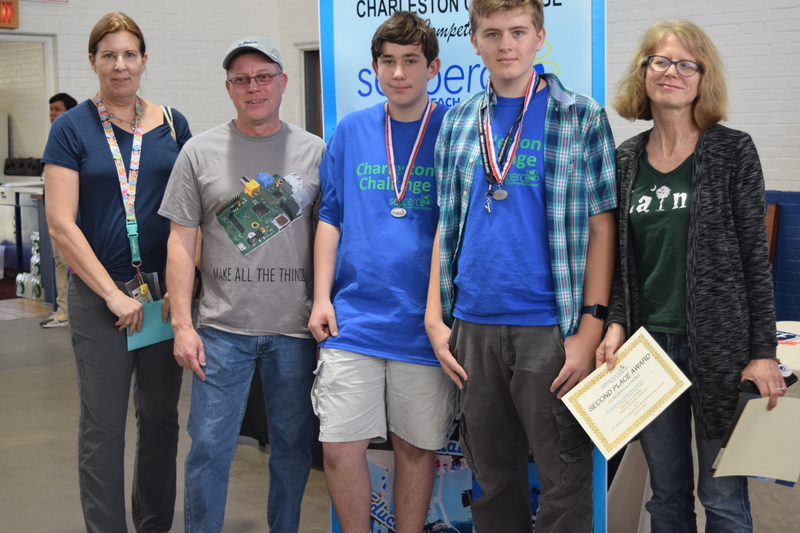 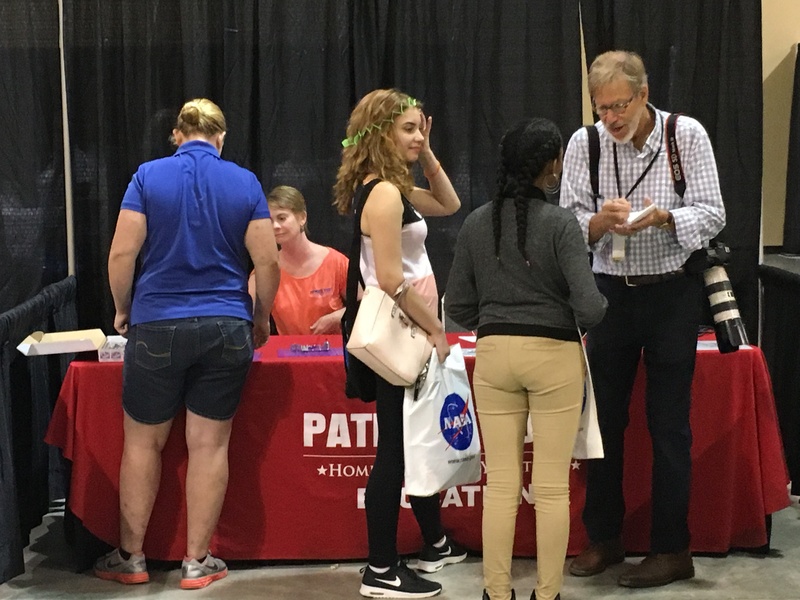 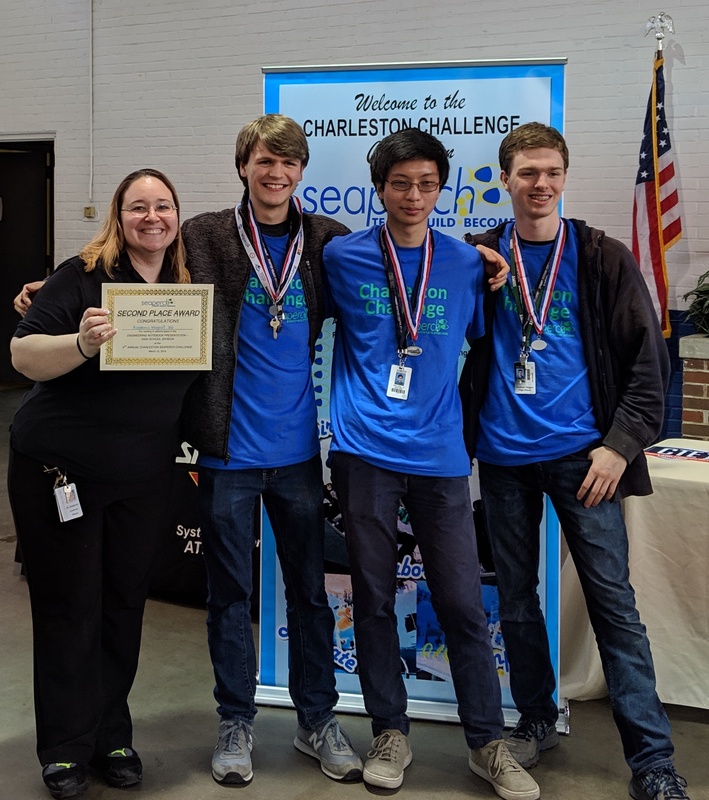 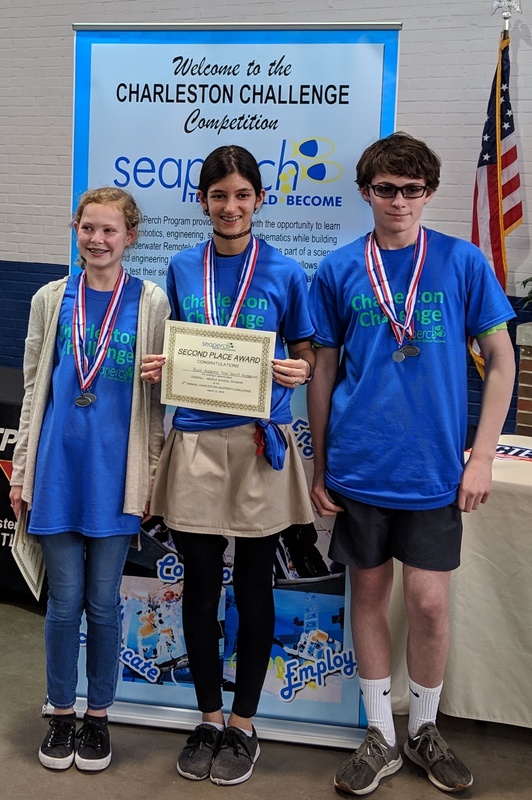 Teams from Charleston Charter School for Math and Science (CCSMS) and Laing Middle School beat out their peers in the 9th annual Charleston SeaPerch Regional Challenge to claim overall victories. 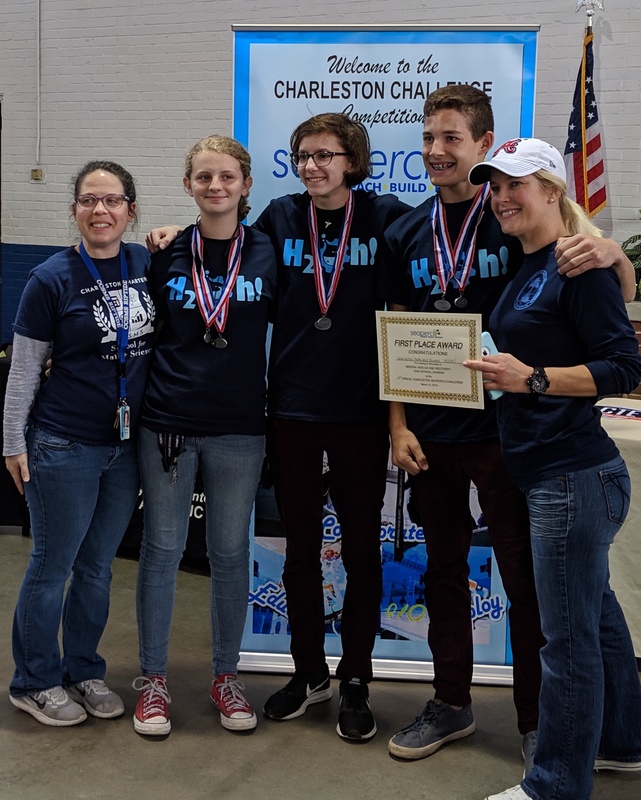 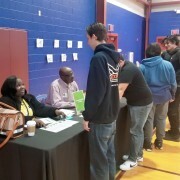 The Charleston Charter School for Math & Science Team H2Oh! 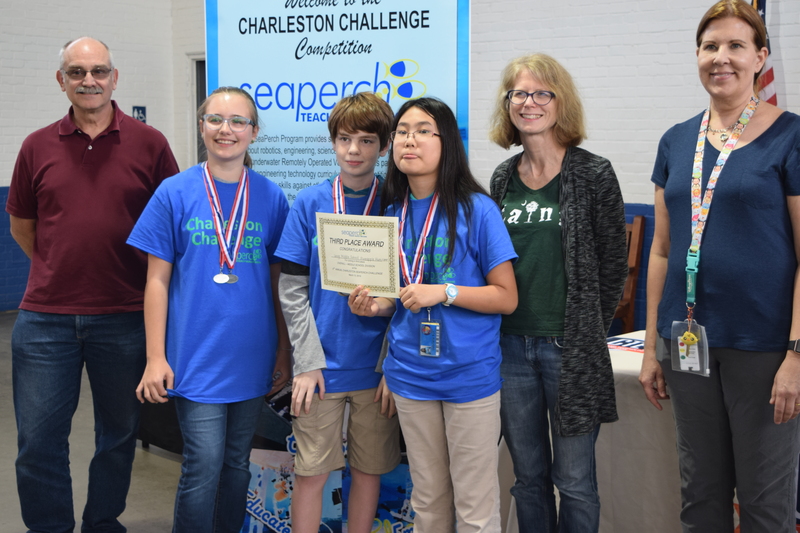 and the Laing MS Red Rockets are going to the International SeaPerch Challenge at the University of Maryland in College Park, MD June 1-2, 2019!! 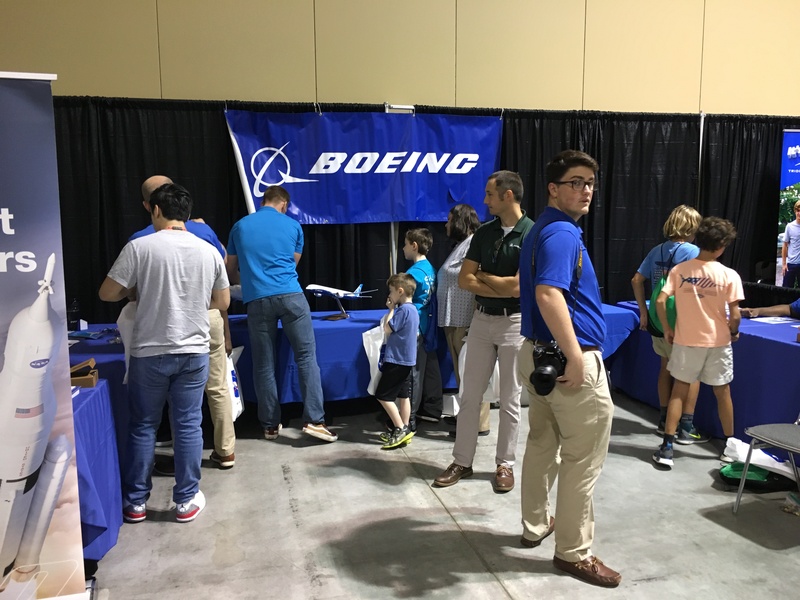 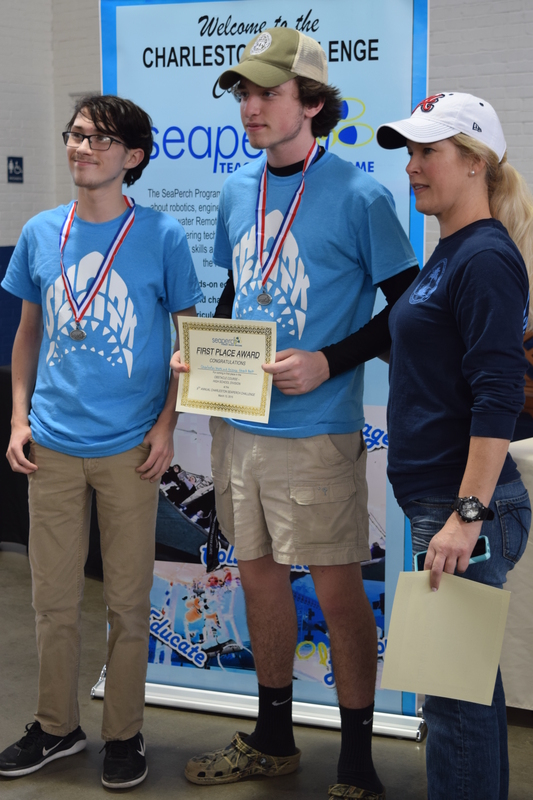 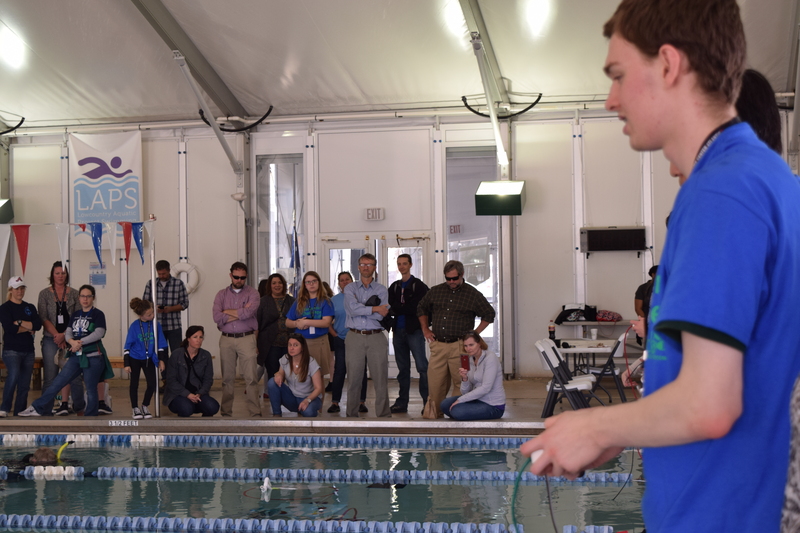 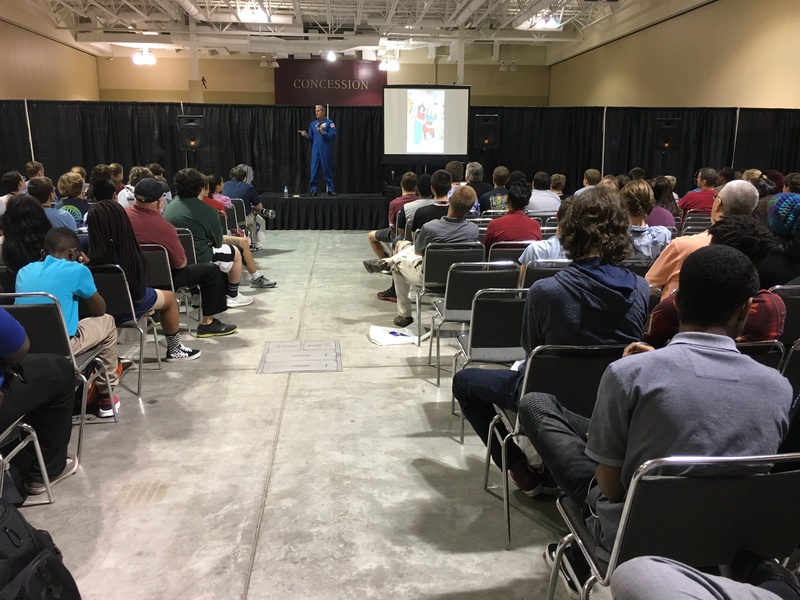 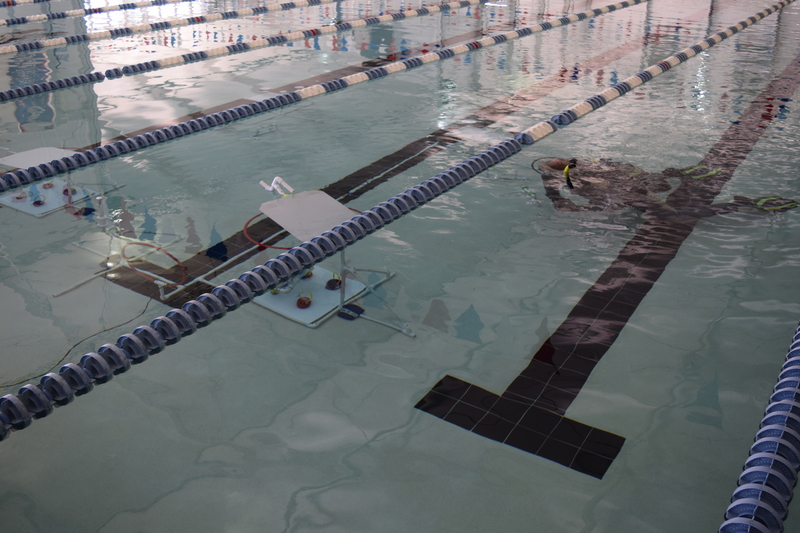 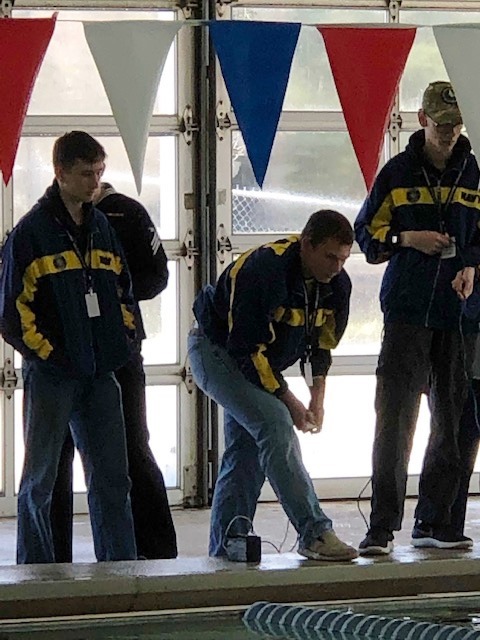 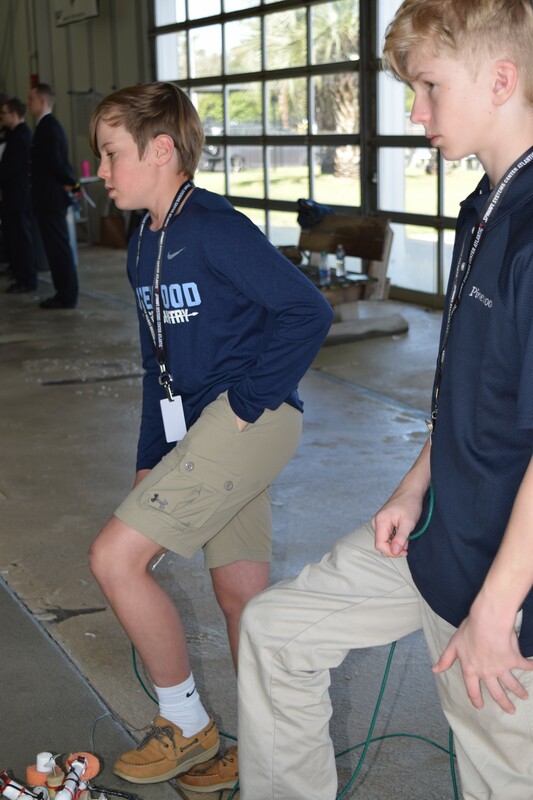 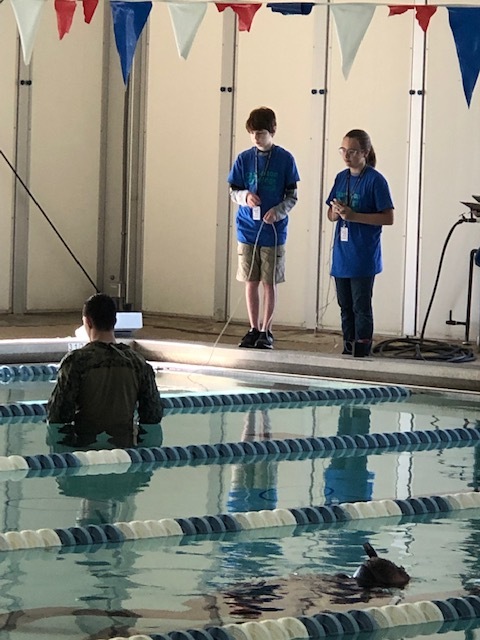 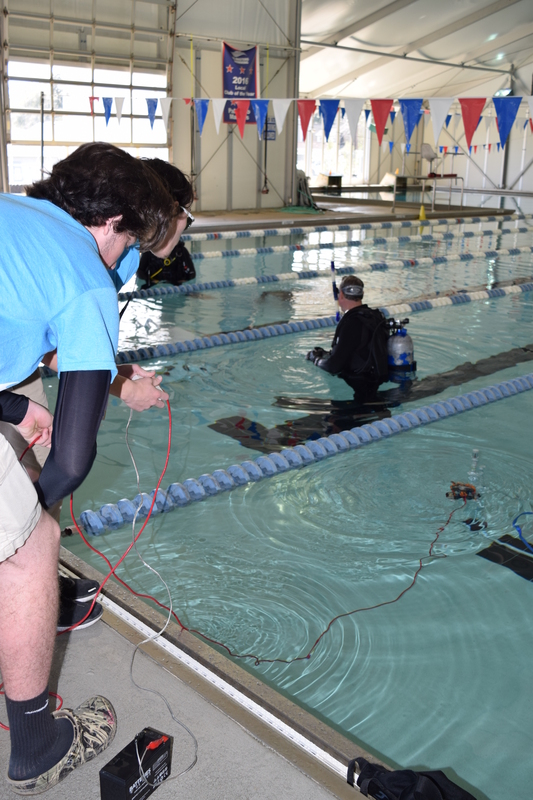 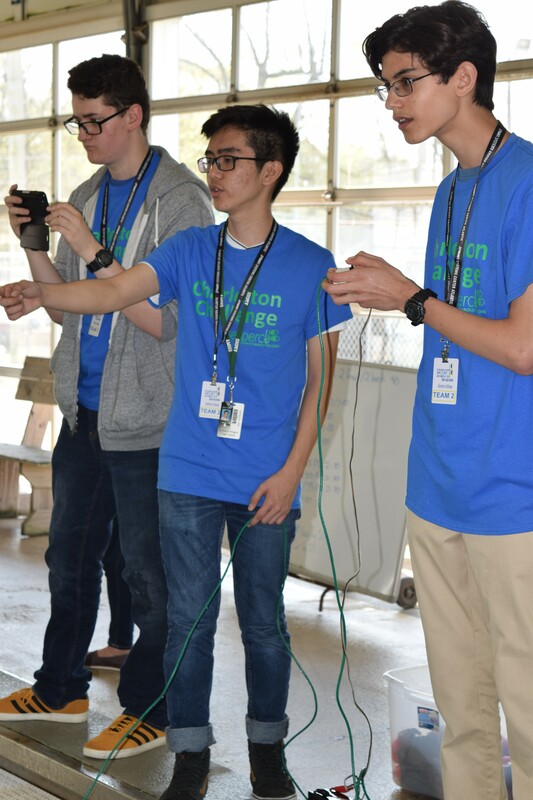 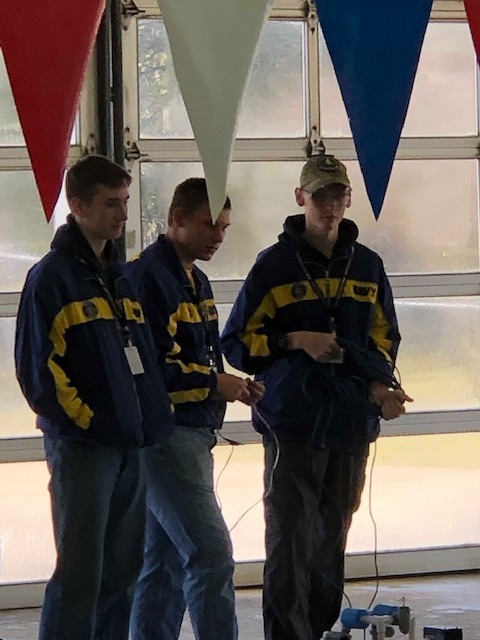 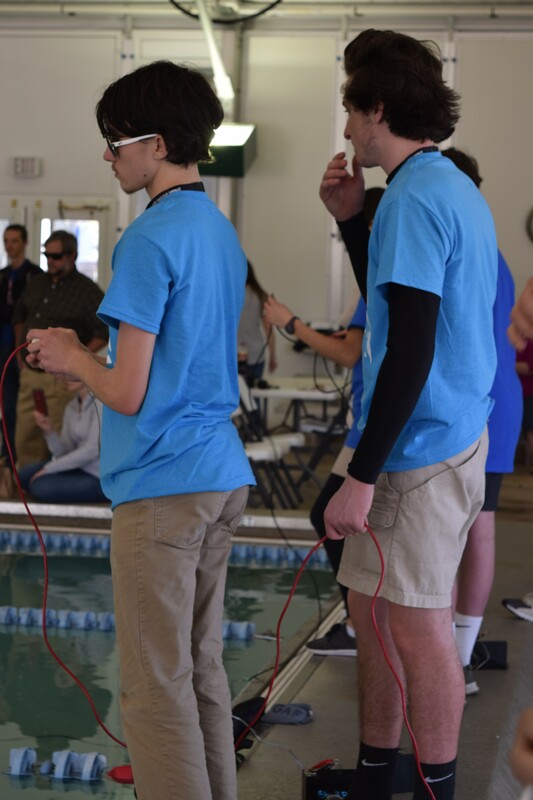 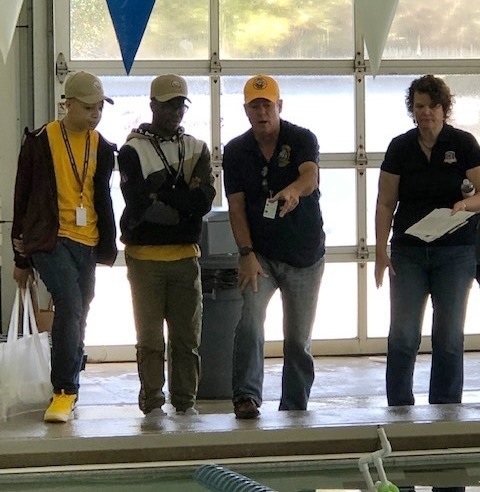 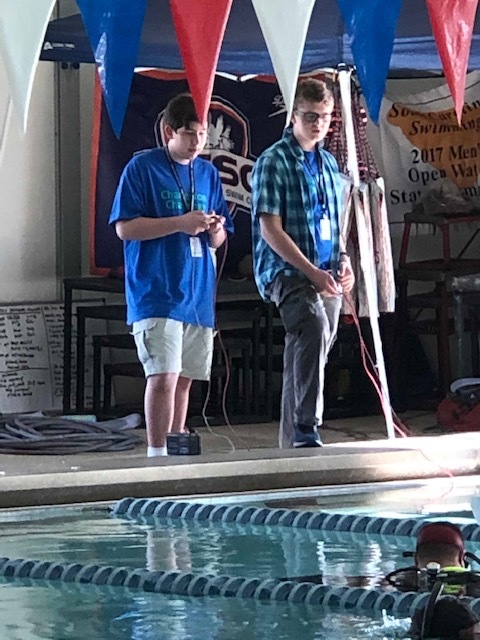 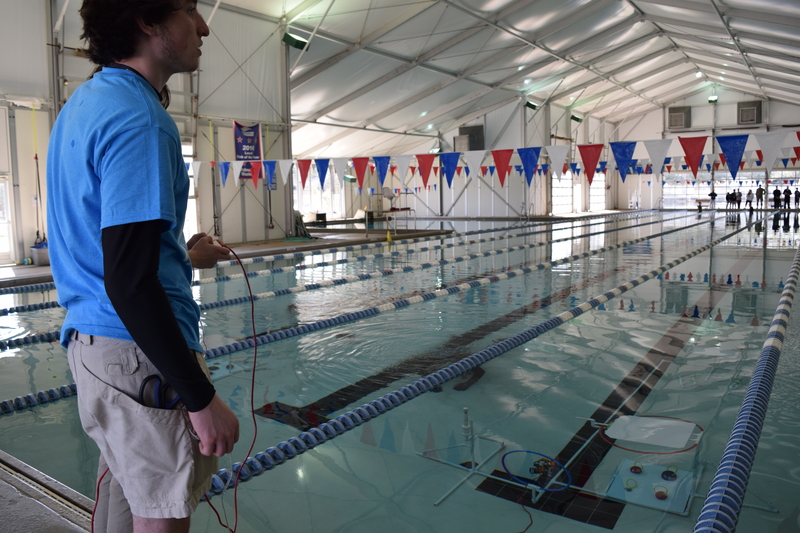 18 teams from 9 schools throughout Charleston County School District (CCSD) and the Trident region competed at the Danny Jones Pool in North Charleston using their underwater remotely operated vehicles (ROV) in two different events: a challenge course and an obstacle course. 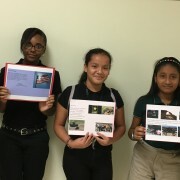 Teams also received scores on their Engineering Notebook presentations. 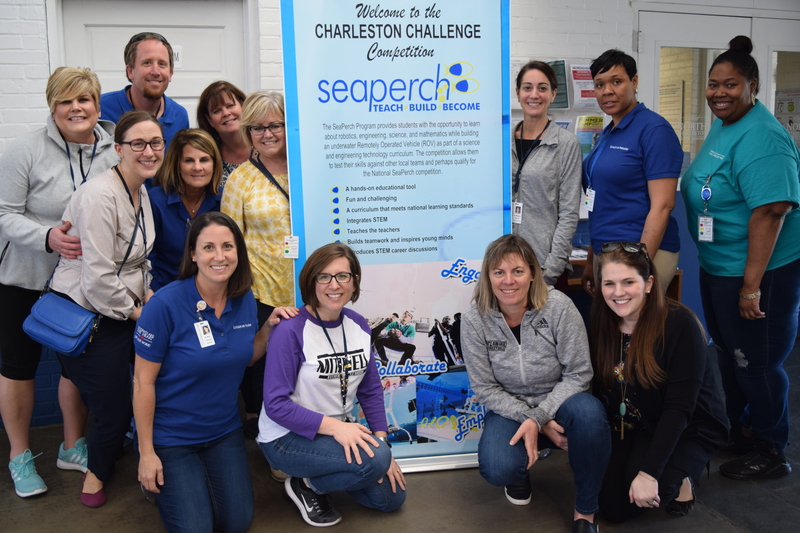 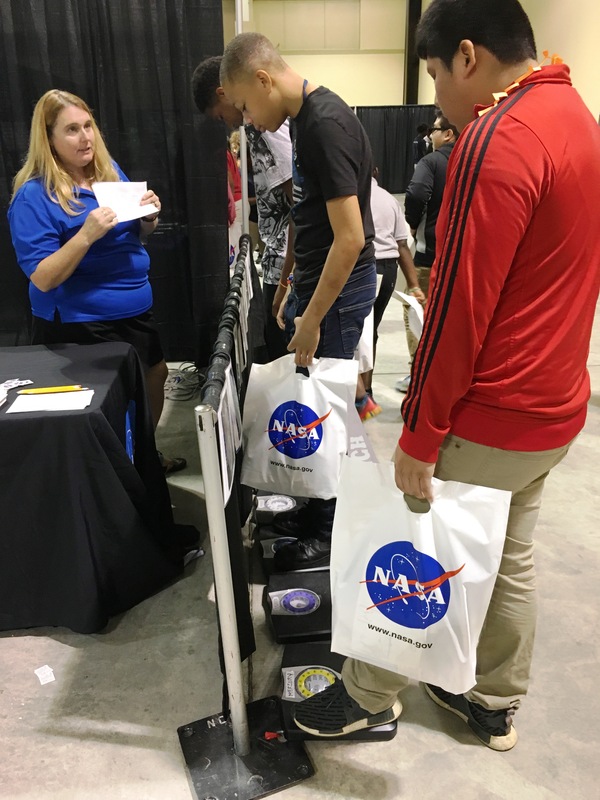 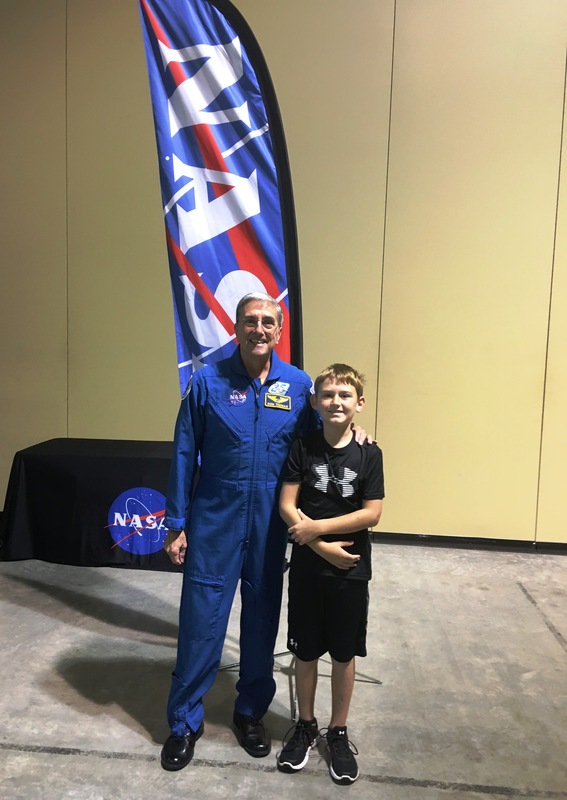 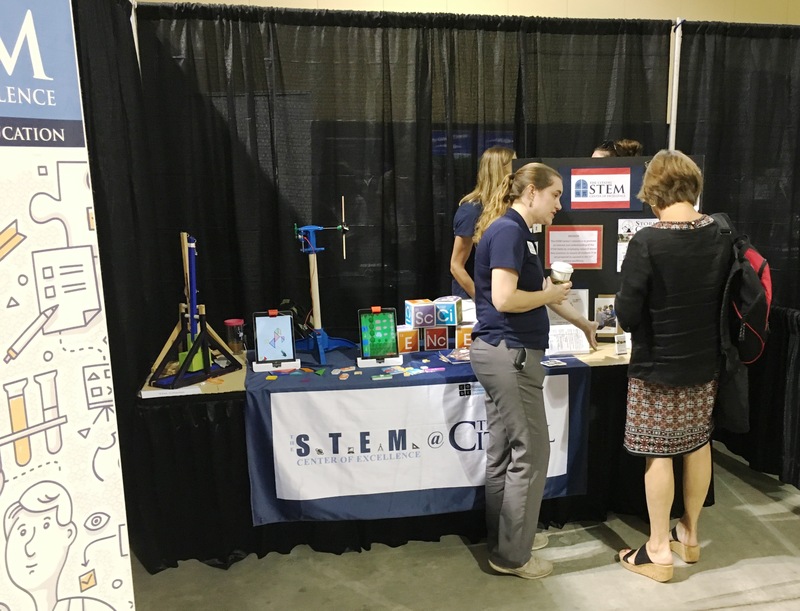 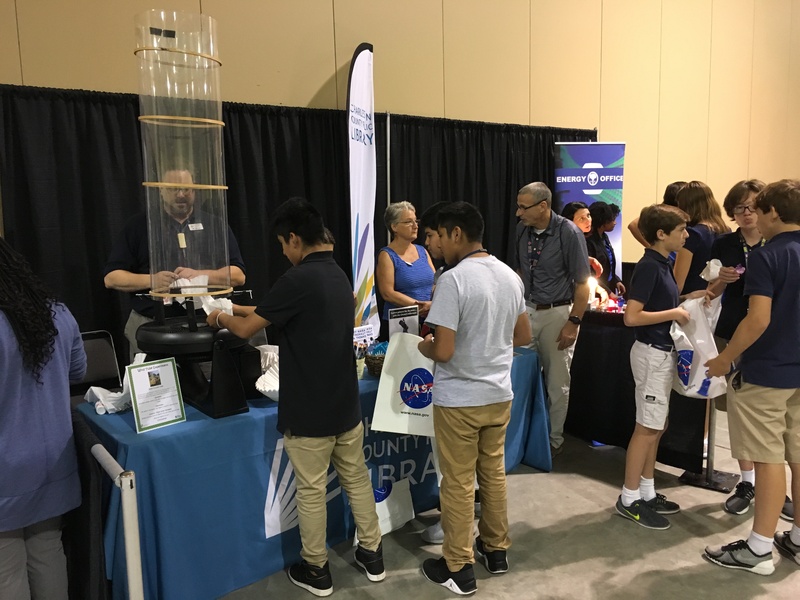 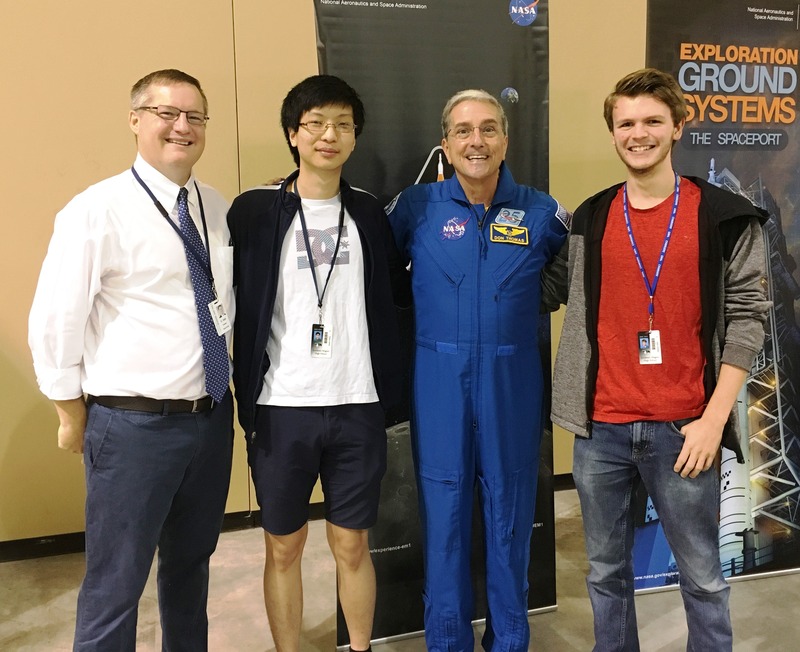 SeaPerch is an innovative underwater robotics program that equips teachers and students with the resources they need to build a ROV in an in-school or out-of-school setting. 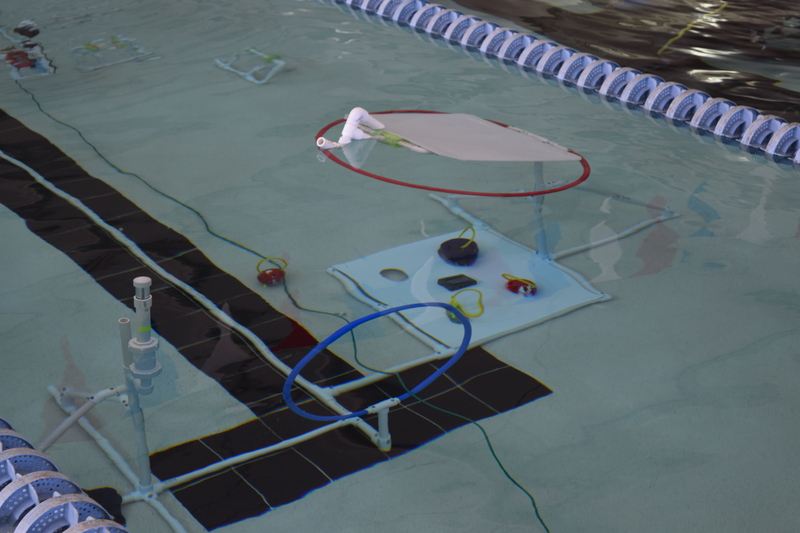 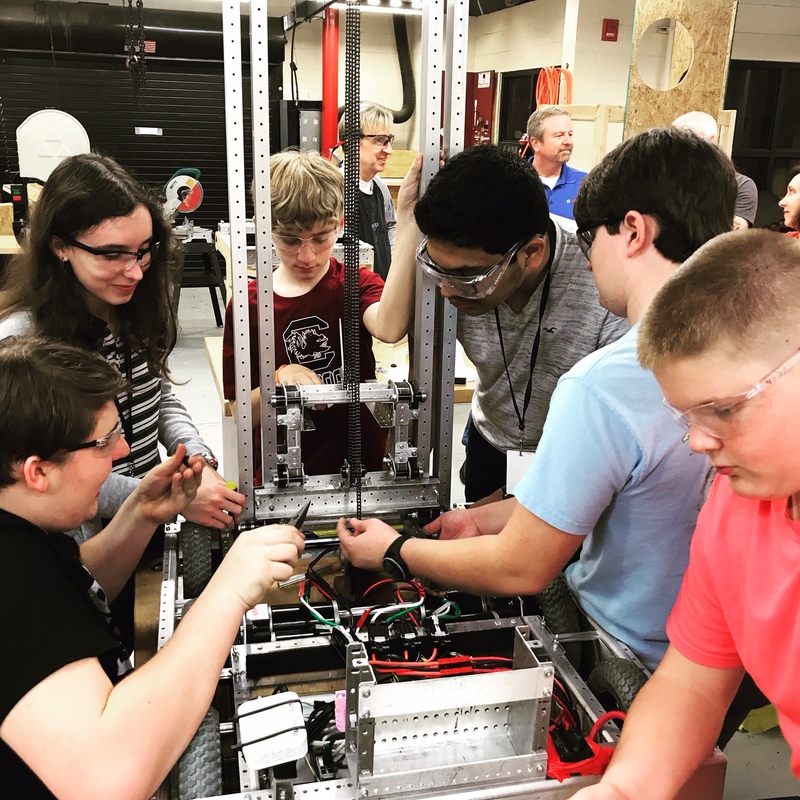 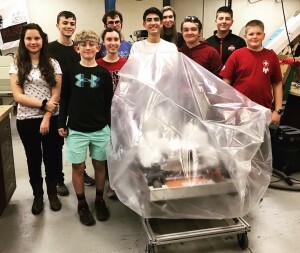 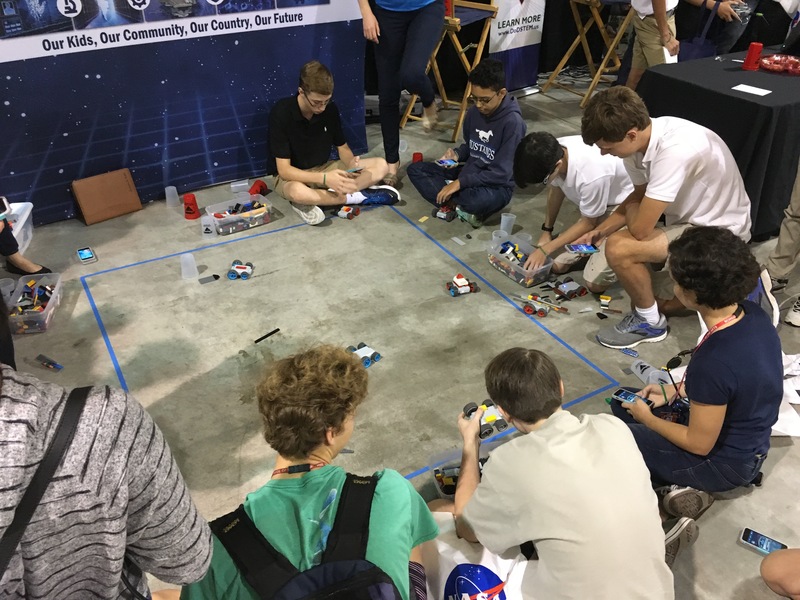 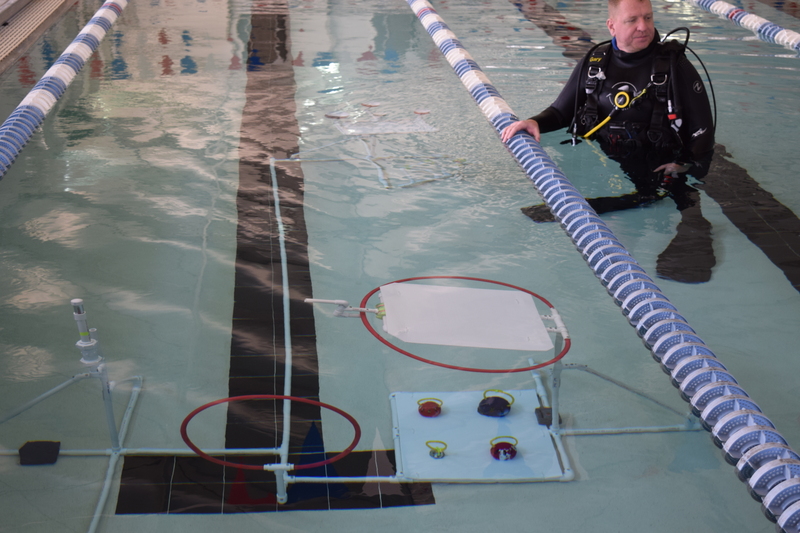 Students build the ROV from a kit comprised of low-cost, easily accessible parts, following a curriculum that teaches basic engineering and science concepts with a marine engineering theme. 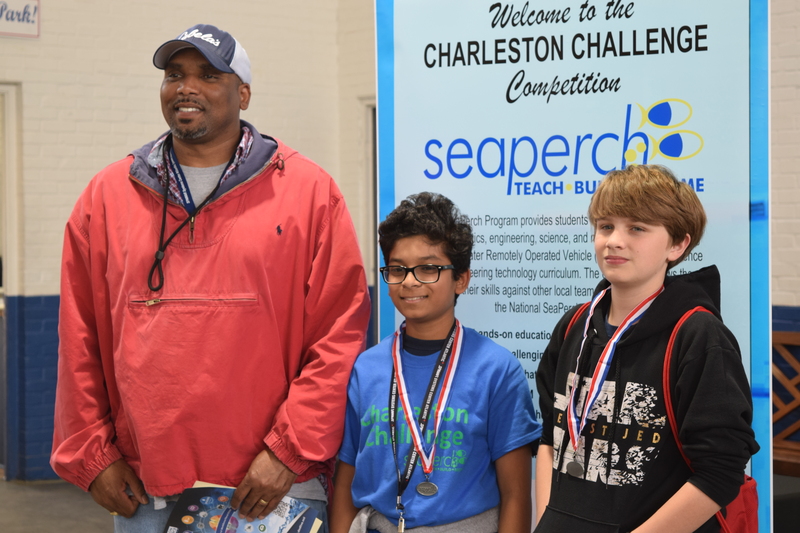 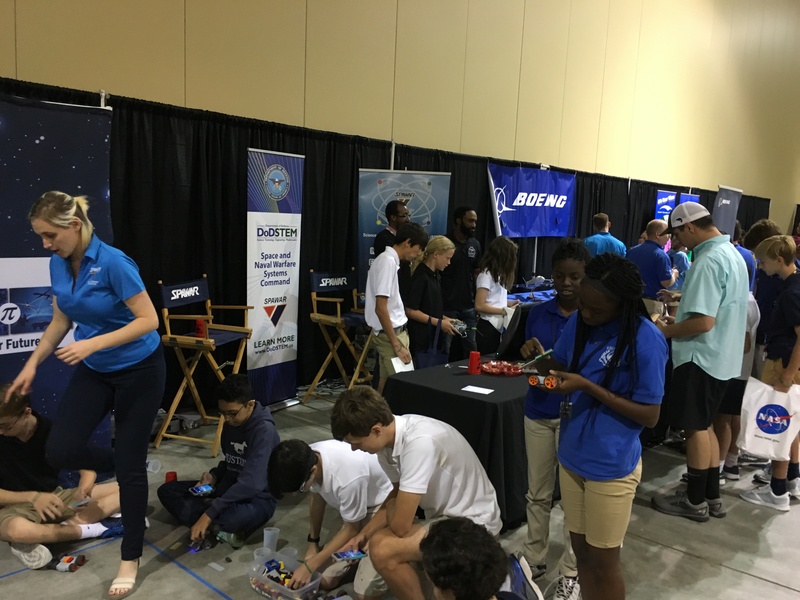 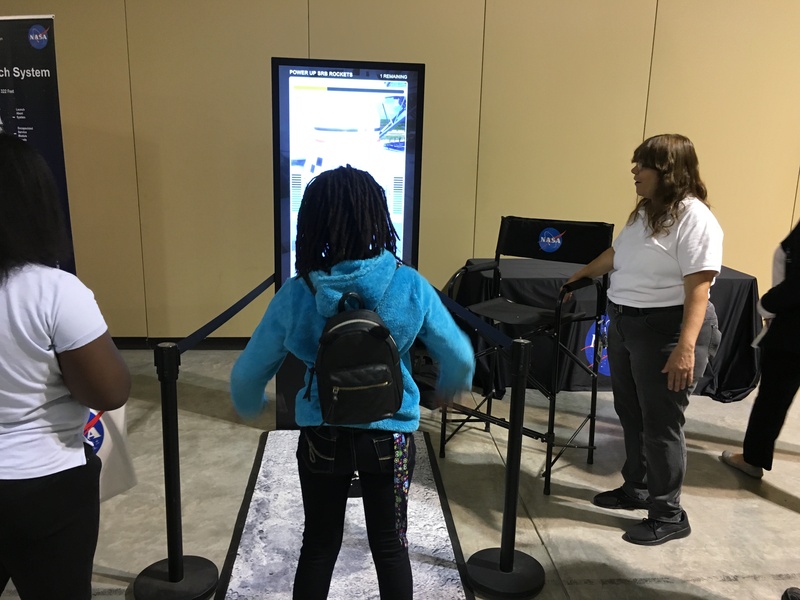 The SeaPerch Program provides students with the opportunity to learn about robotics, engineering, science, and mathematics while building an underwater ROV as part of a science and engineering technology curriculum. 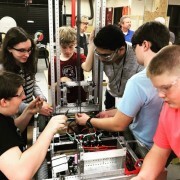 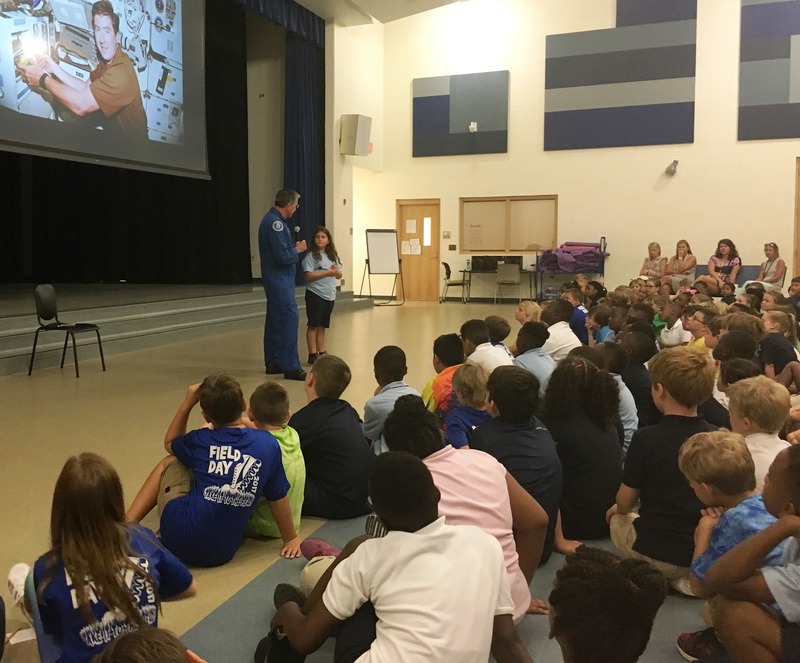 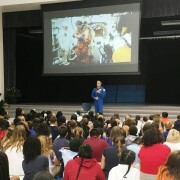 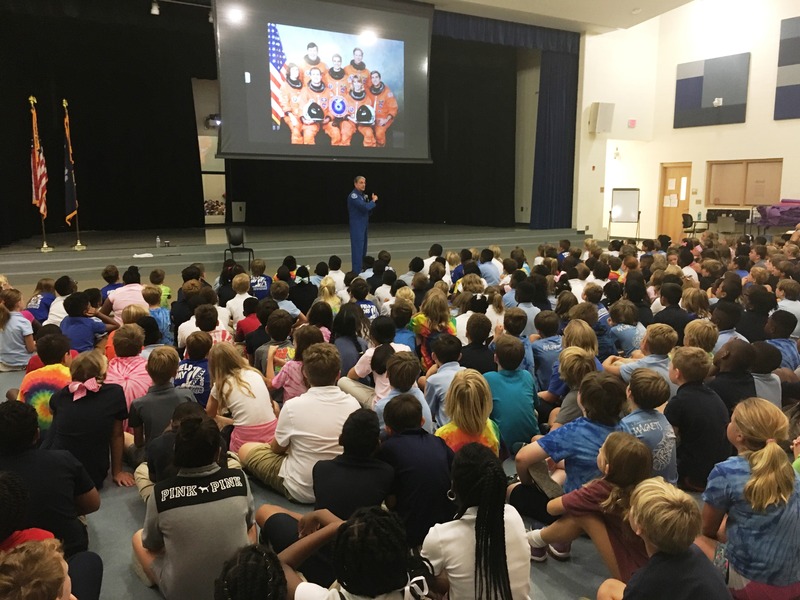 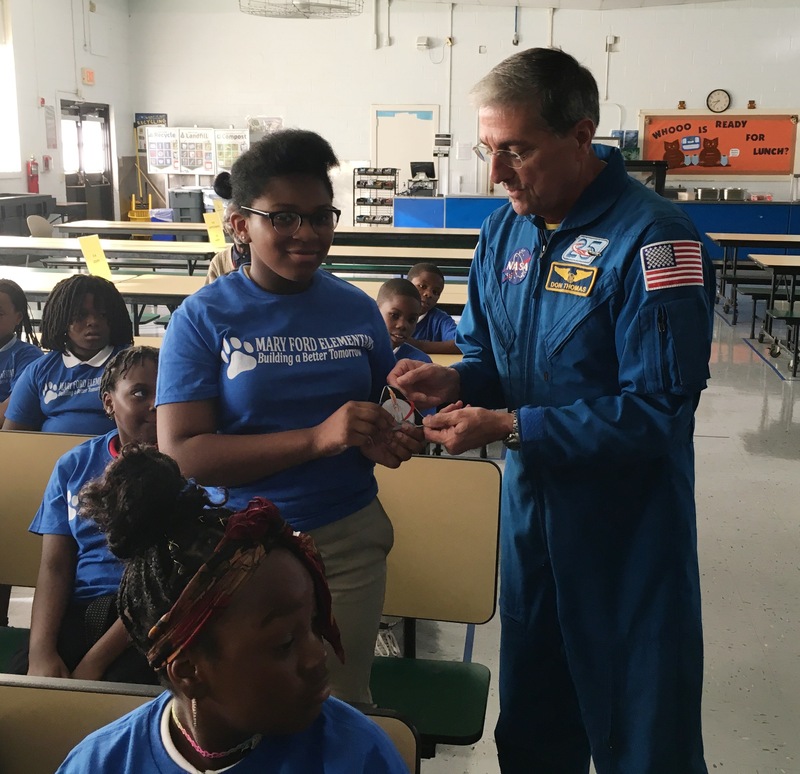 Throughout the project, students will learn engineering concepts, problem-solving, teamwork, and technical applications. 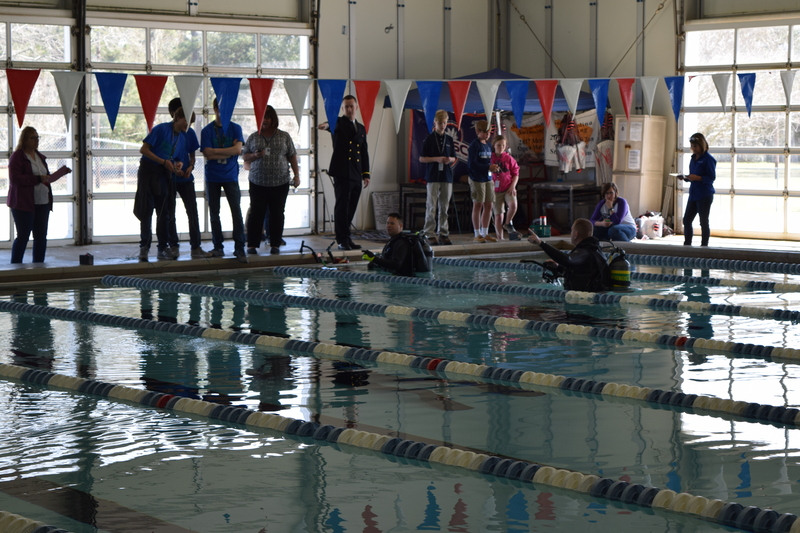 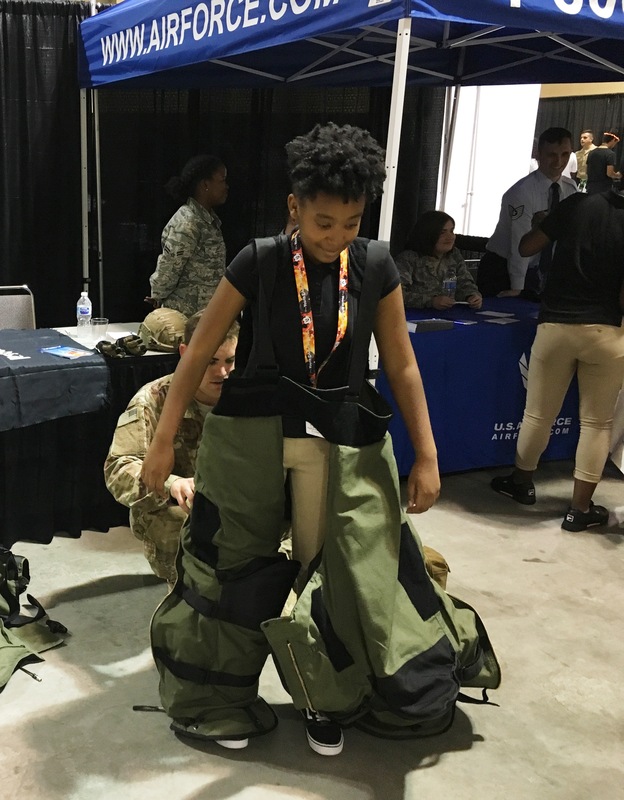 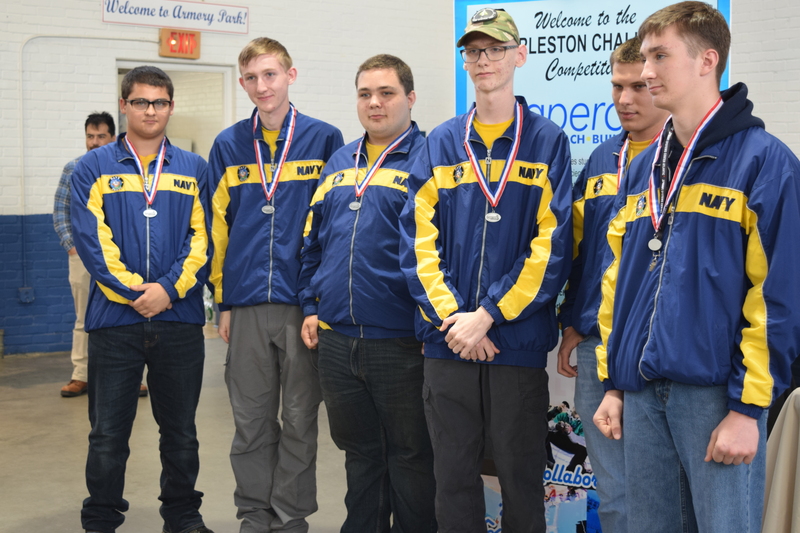 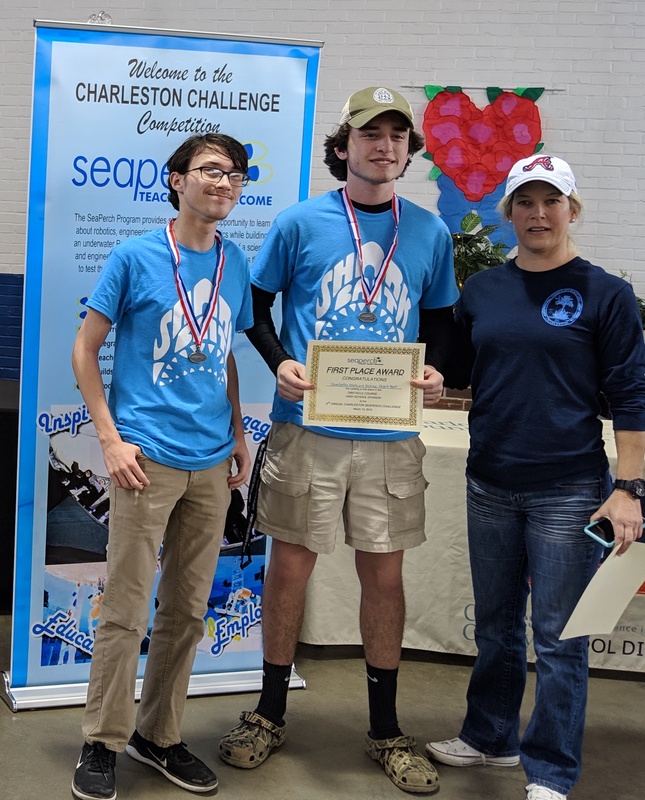 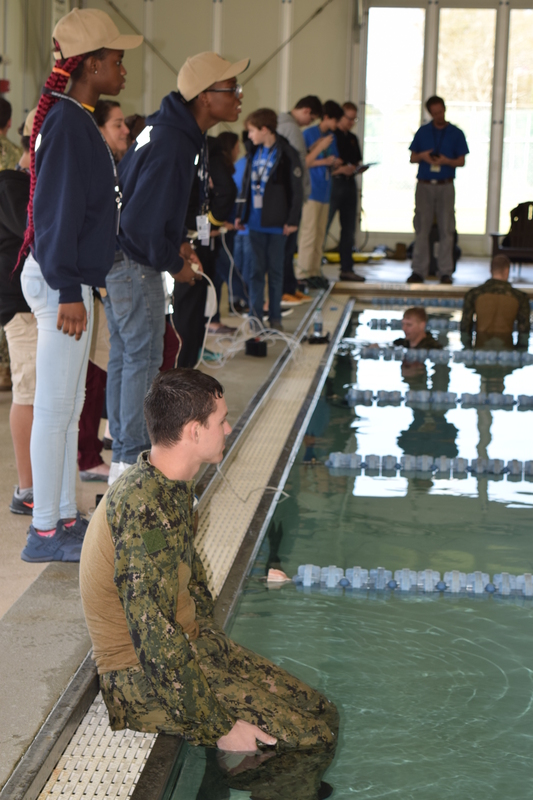 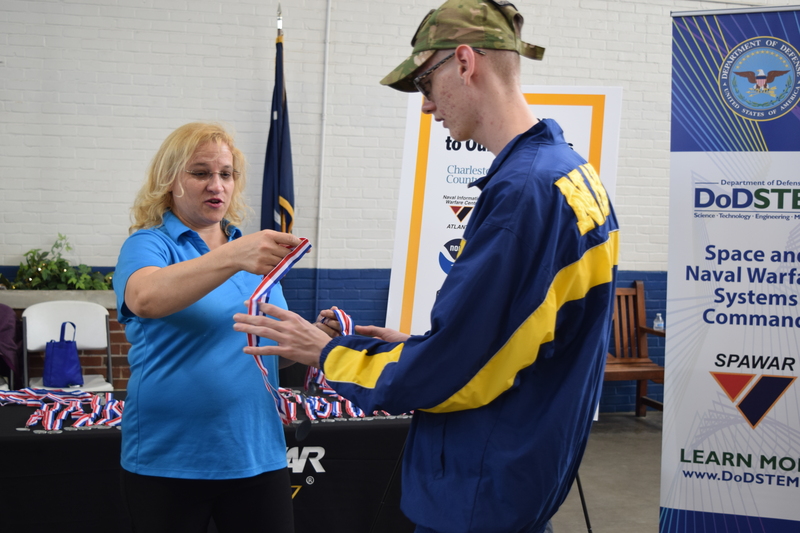 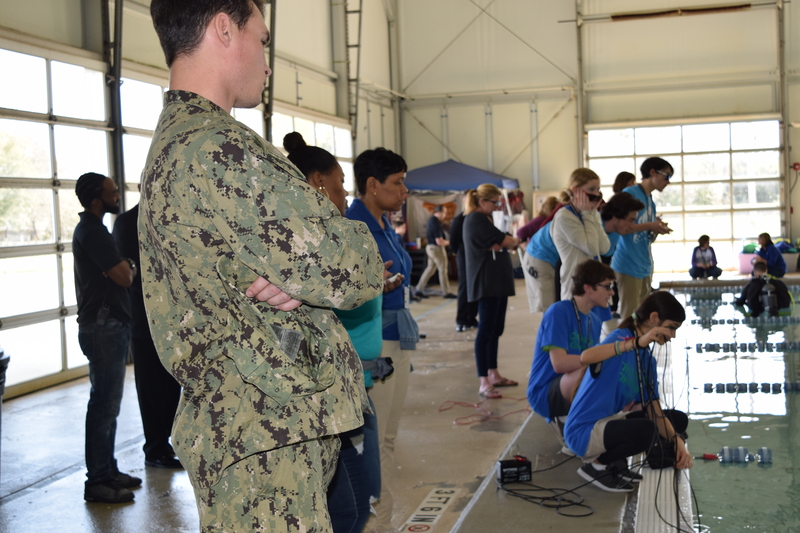 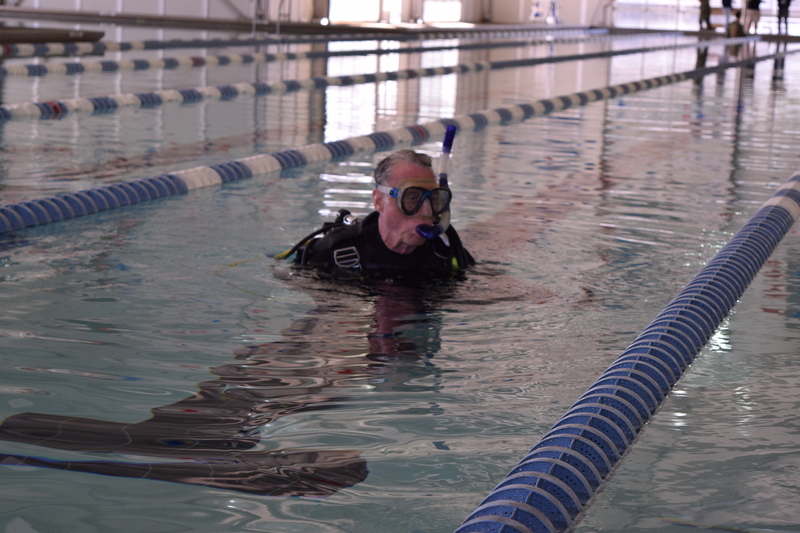 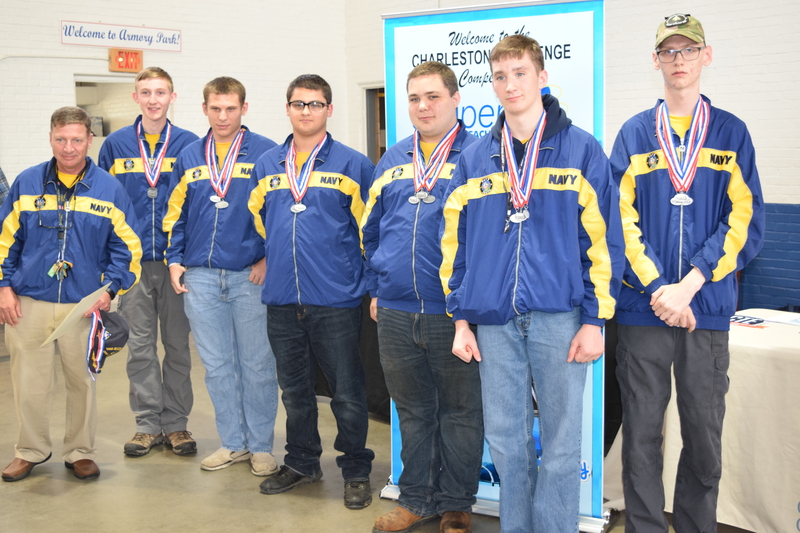 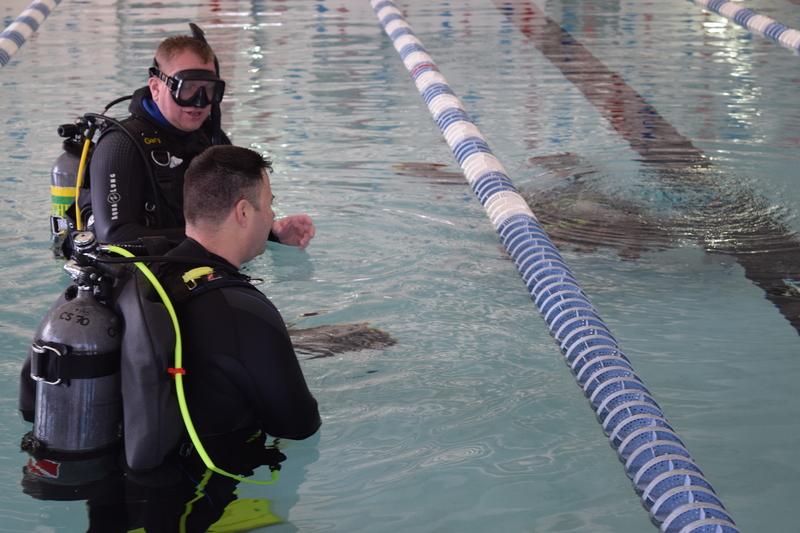 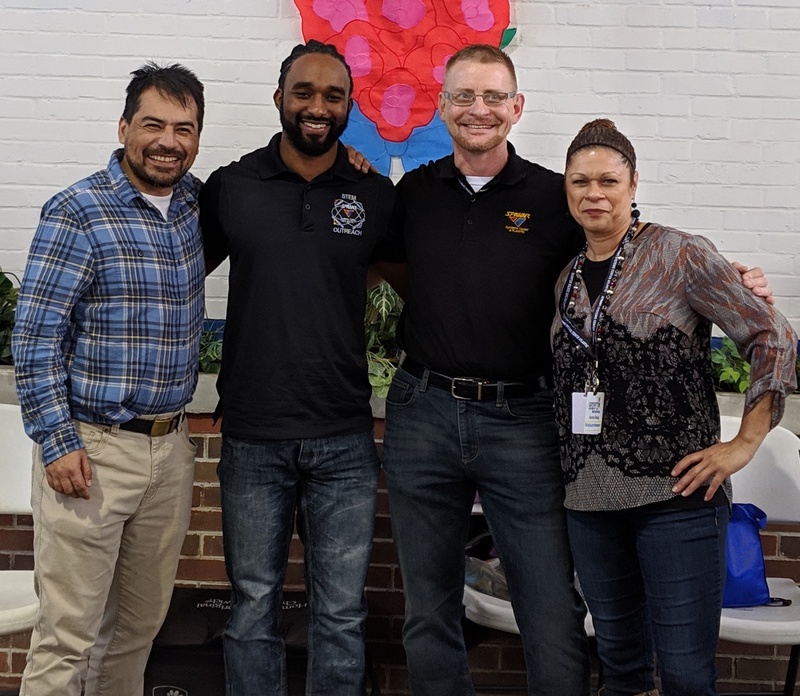 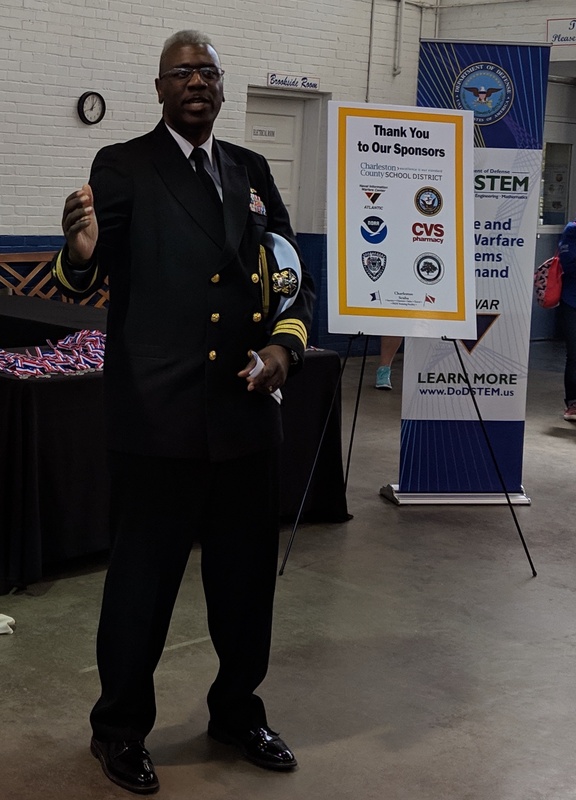 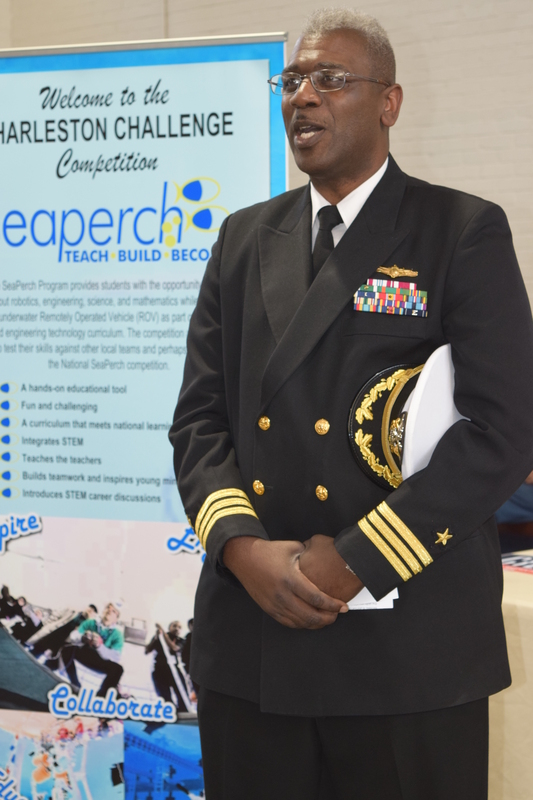 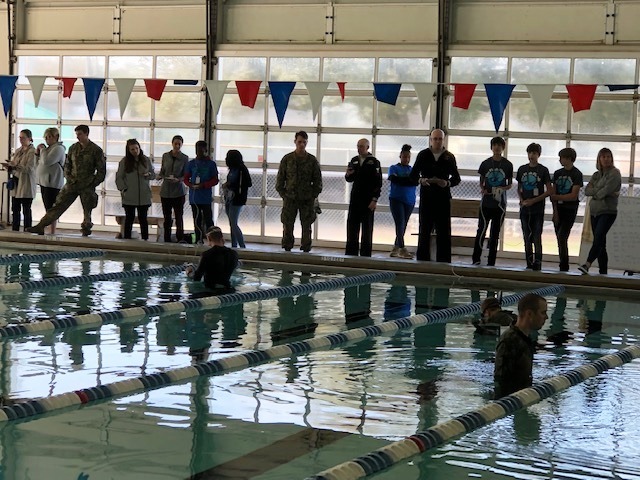 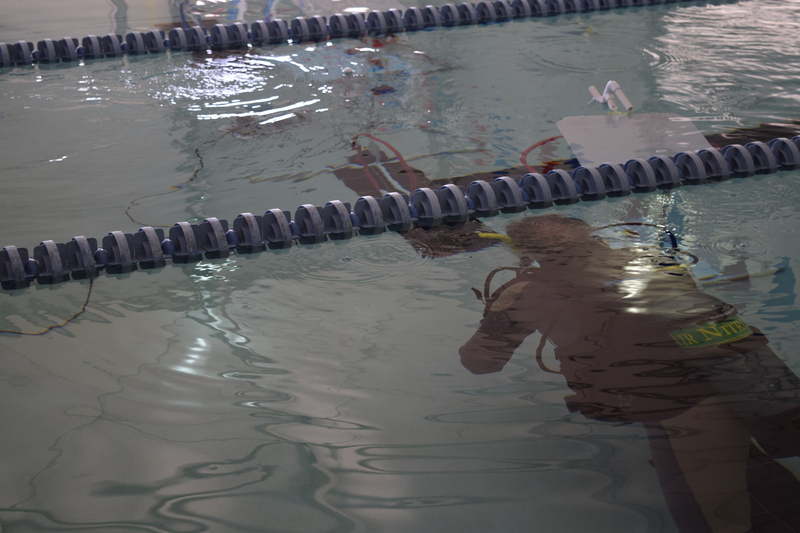 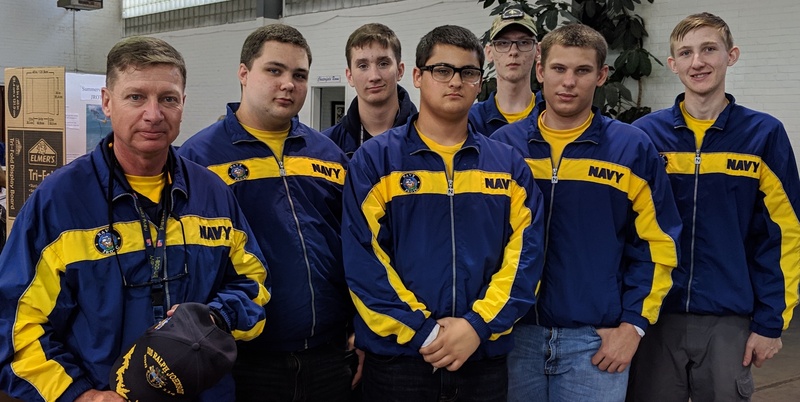 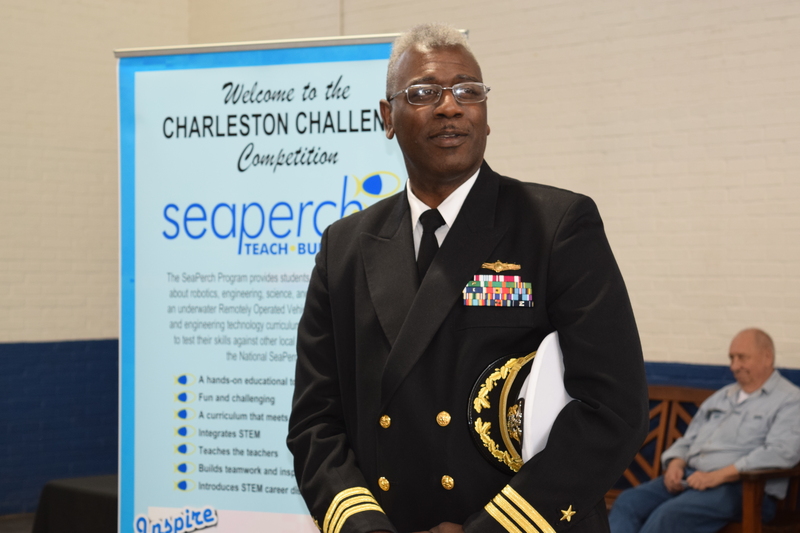 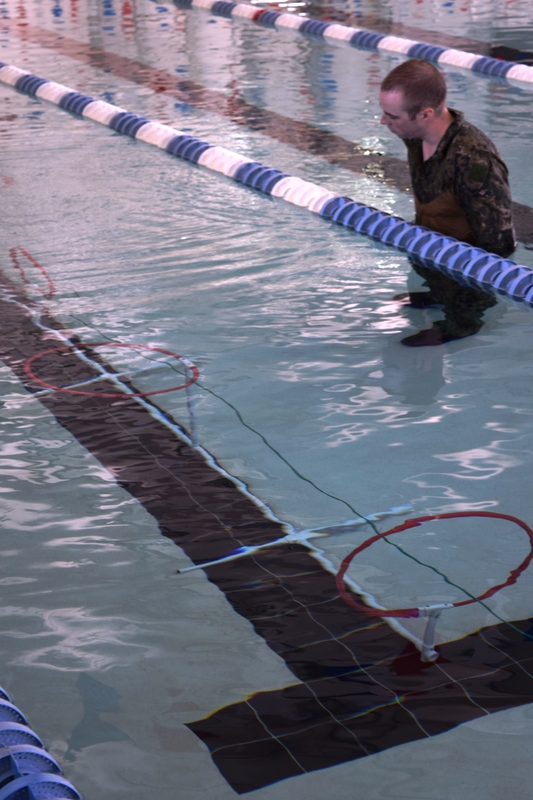 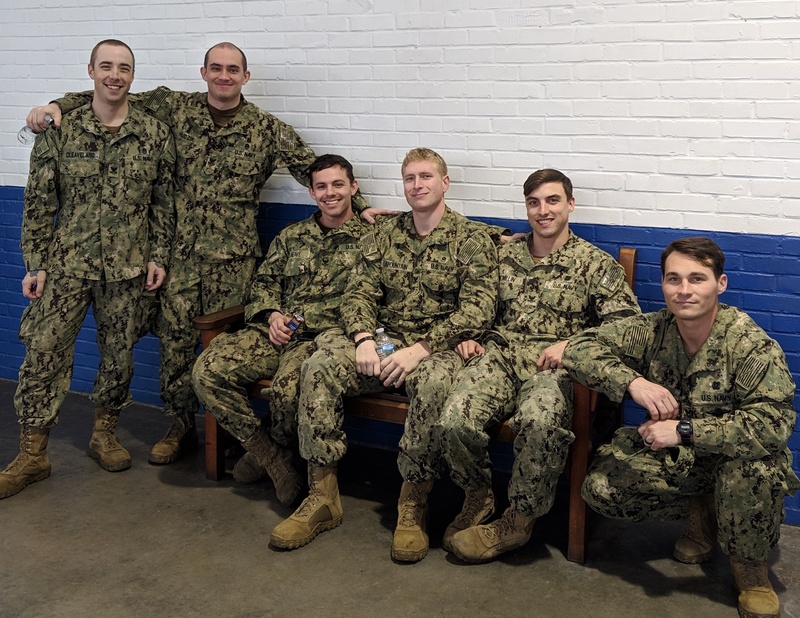 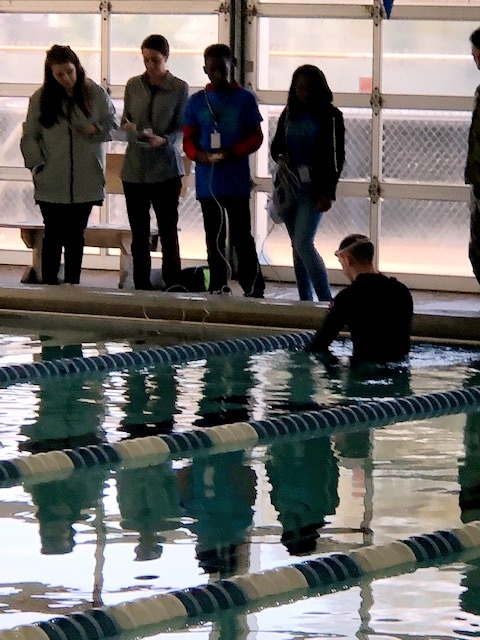 As part of the Charleston Navy Week celebration (March 11-15, 2019), Navy personnel participated in the Charleston SeaPerch Challenge as divers, judges, and team escorts. CCSD would also to thank the many volunteers who gave their time to this competition, and to the City of North Charleston, North Charleston Police Department, CVS Pharmacy, Charleston SCUBA, and NOAA (National Oceanic and Atmospheric Administration) for their sponsorship and support of the Charleston SeaPerch Regional Challenge. 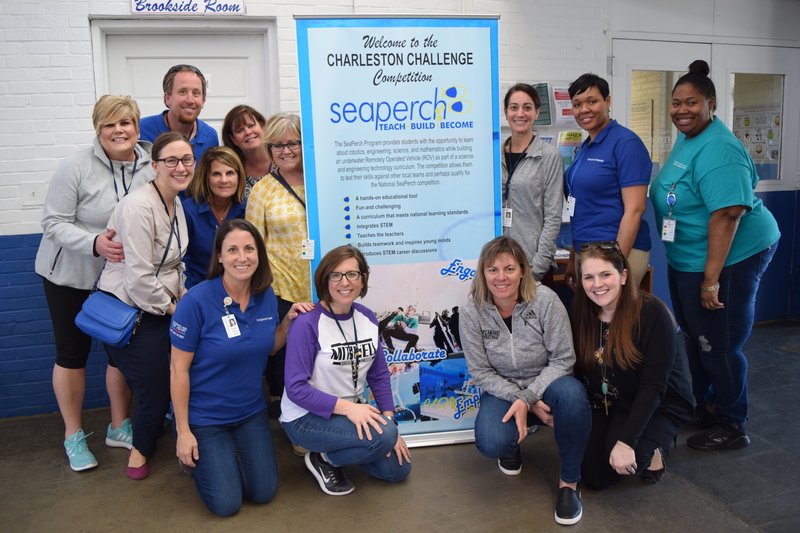 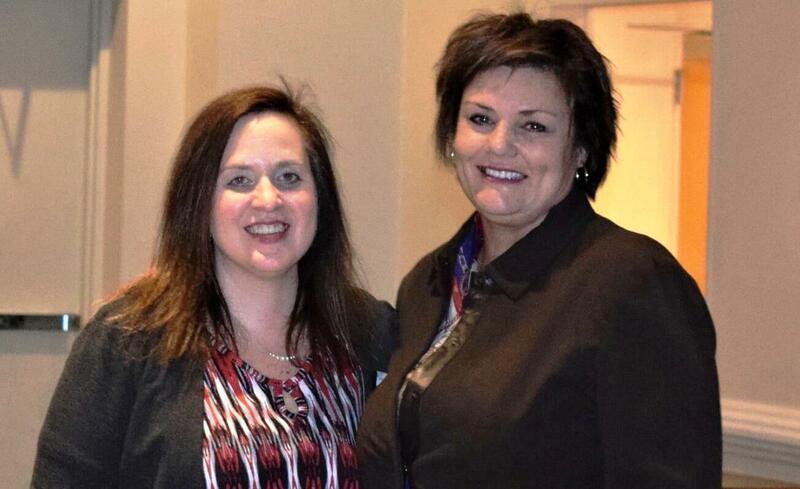 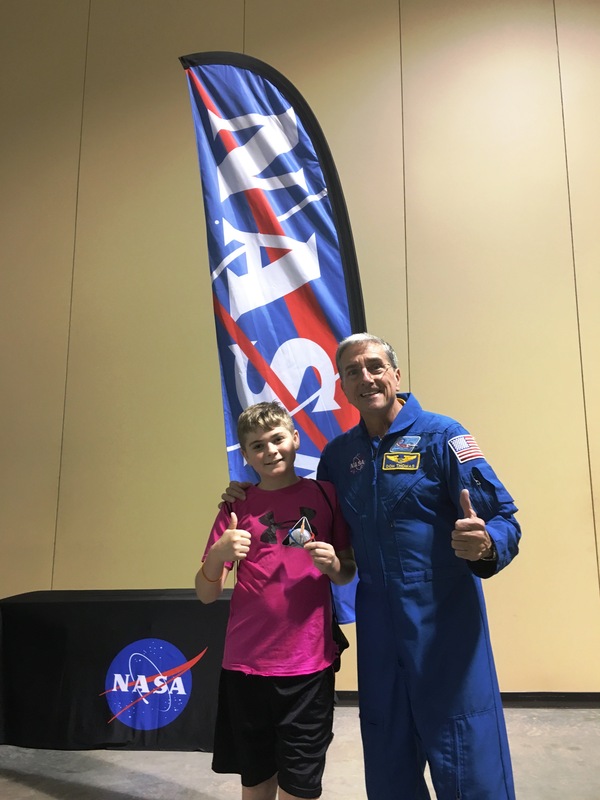 A special thanks to NWIC (SPAWAR) for their continued partnership in hosting the Charleston SeaPerch Challenge! 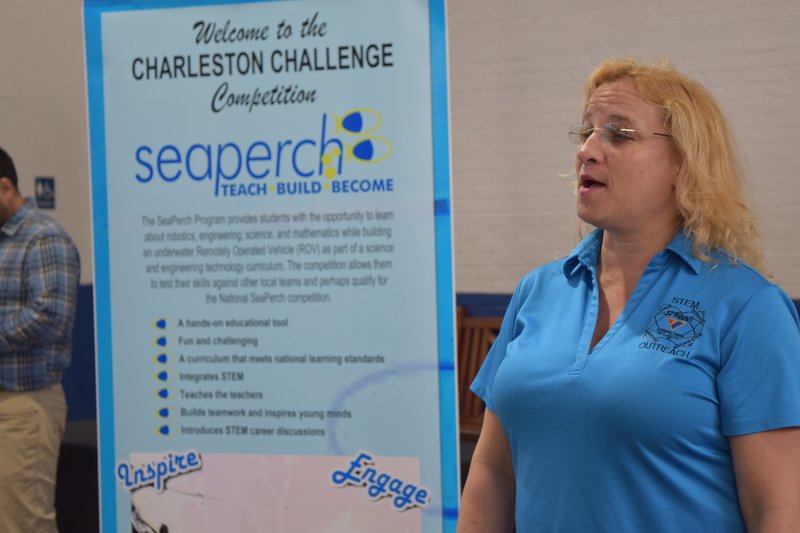 To learn more about SeaPerch, visit http://seaperch.org/. 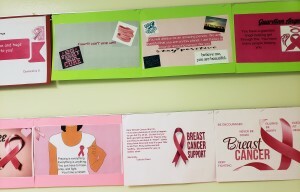 Students at Zucker Middle School learned about Breast Cancer Awareness throughout the month of October. 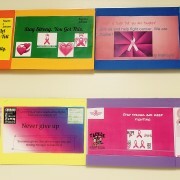 They completed a special display for their classroom door and worked in groups to research and discuss the disease. 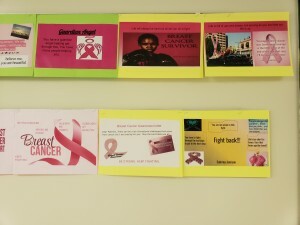 Using Google Slides, each small group shared what they learned from their research. 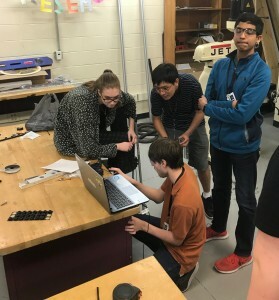 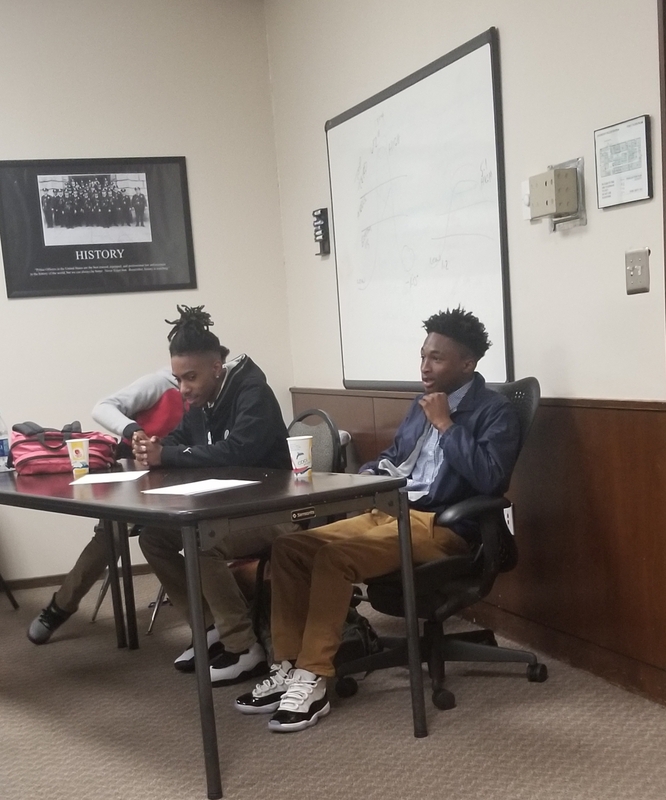 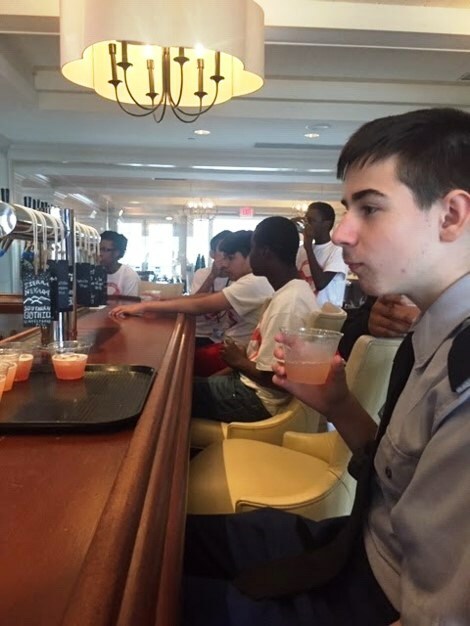 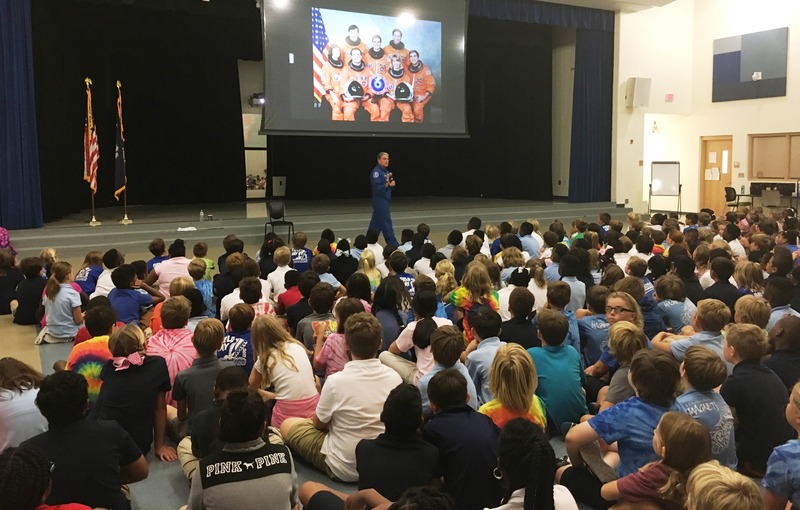 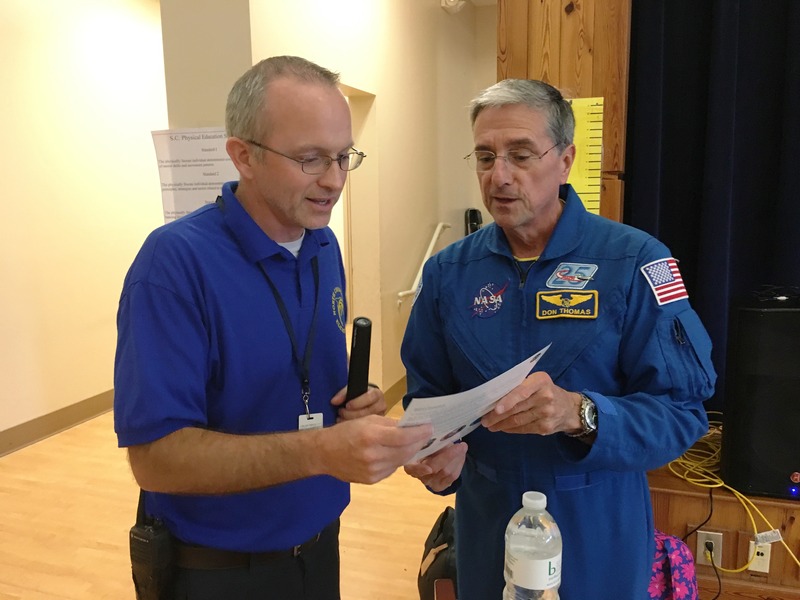 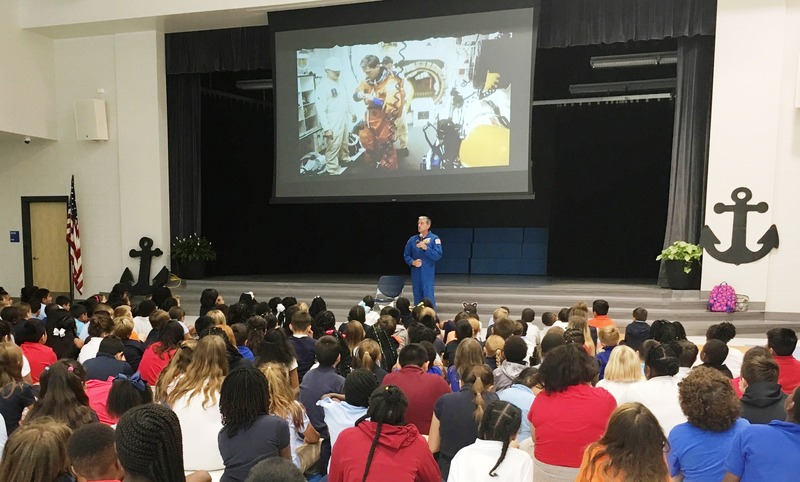 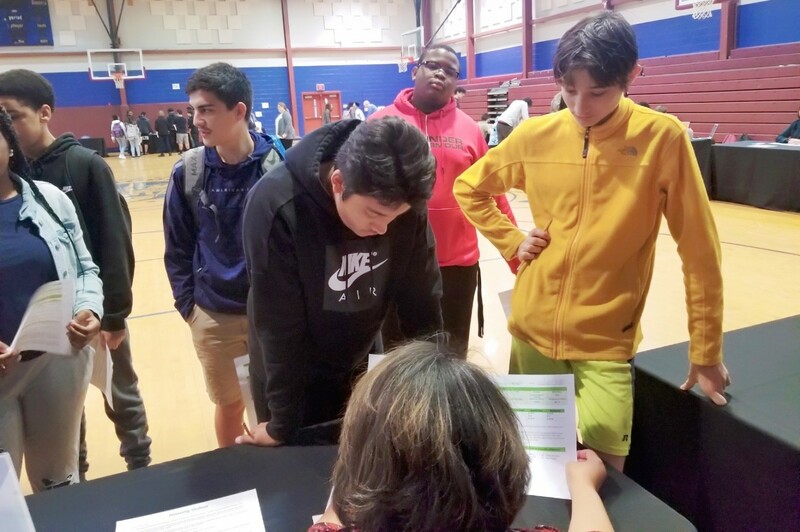 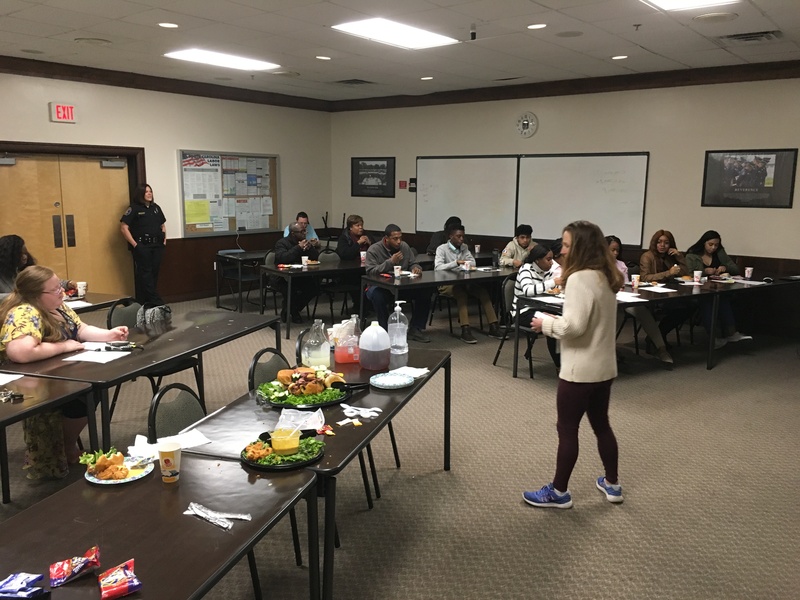 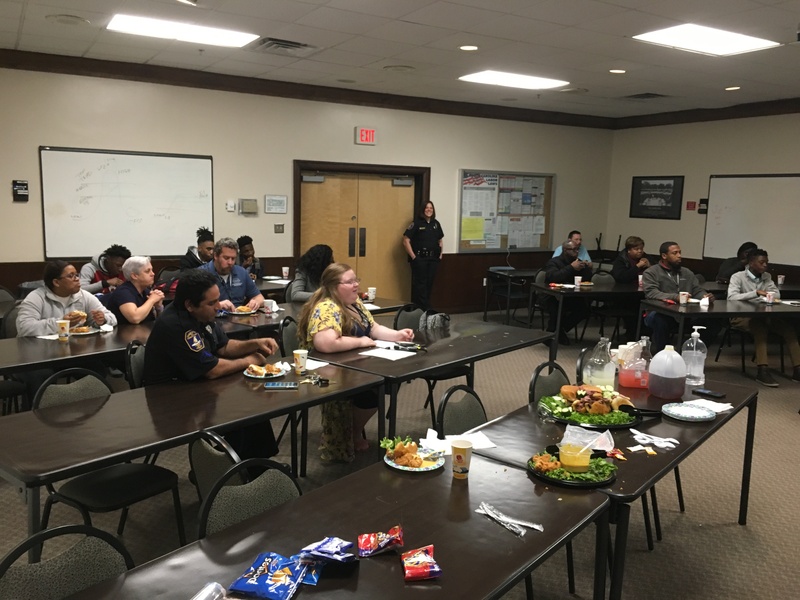 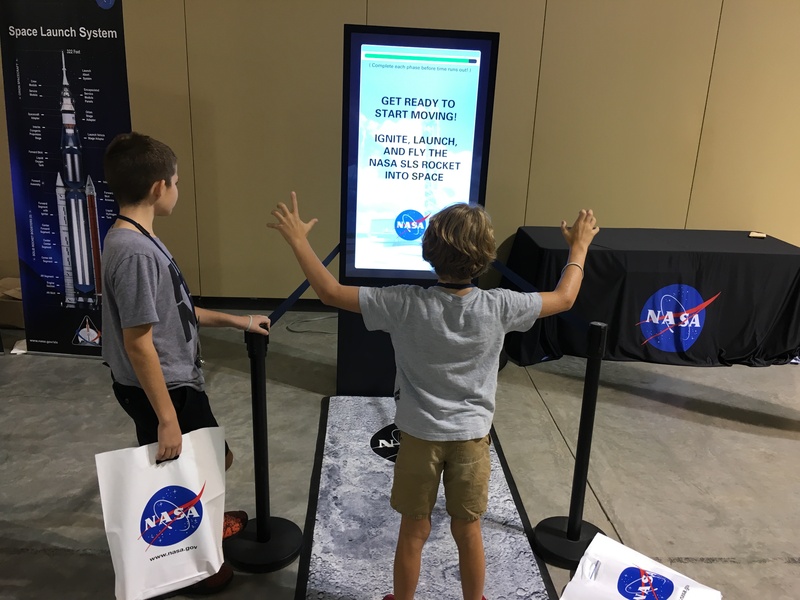 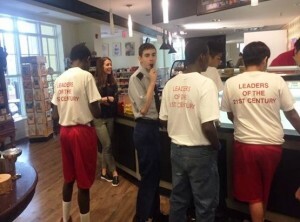 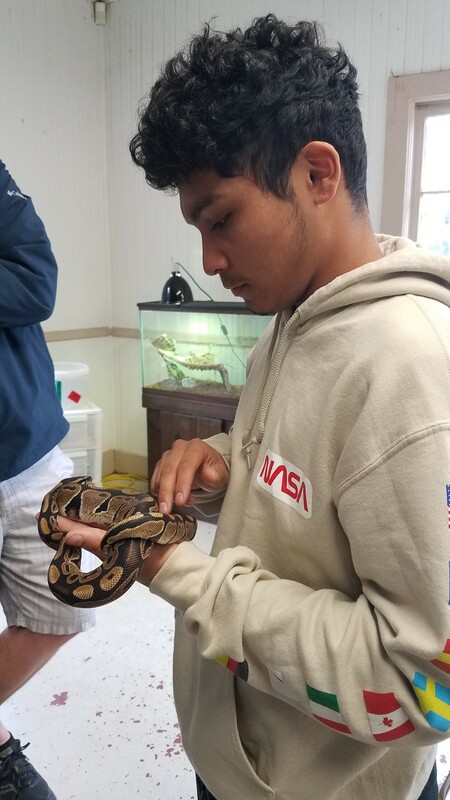 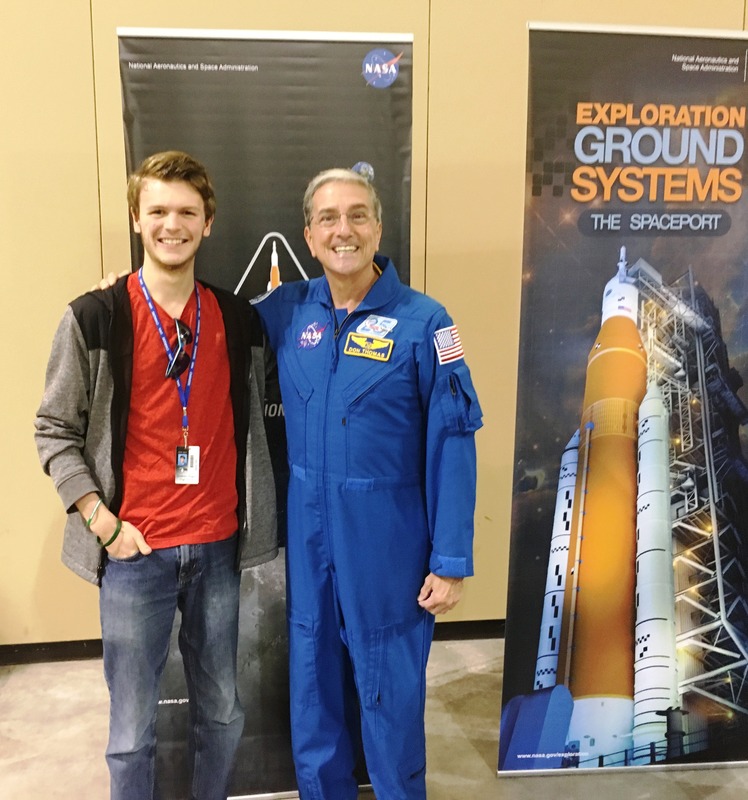 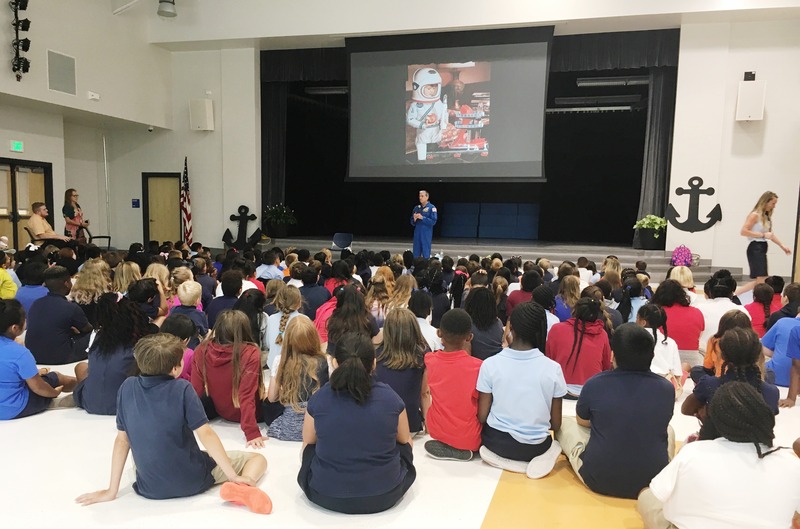 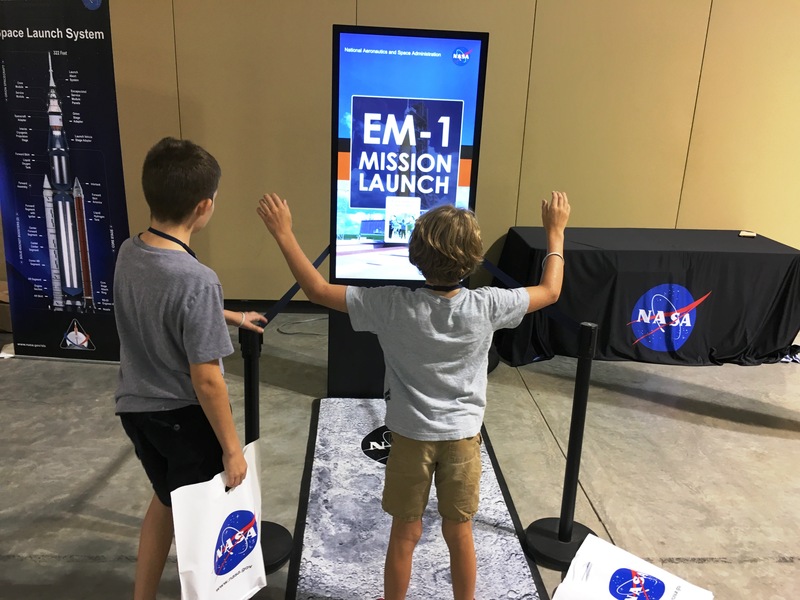 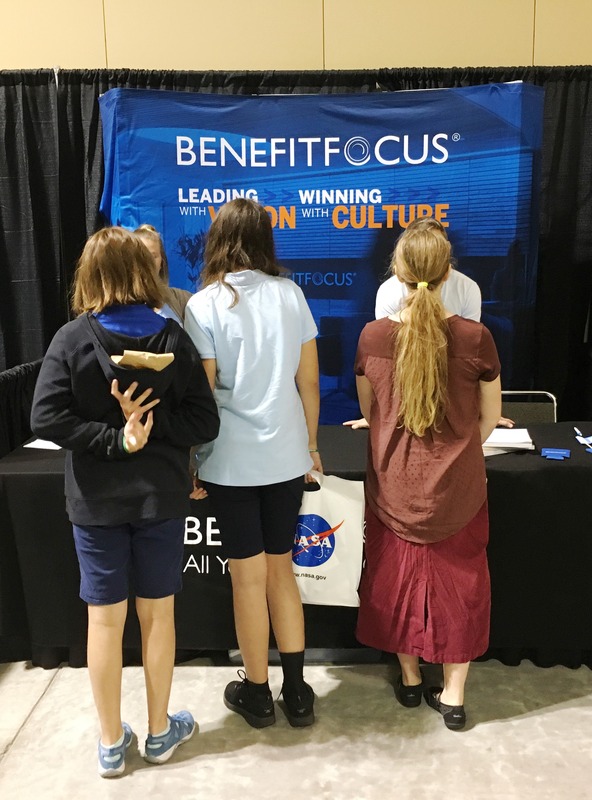 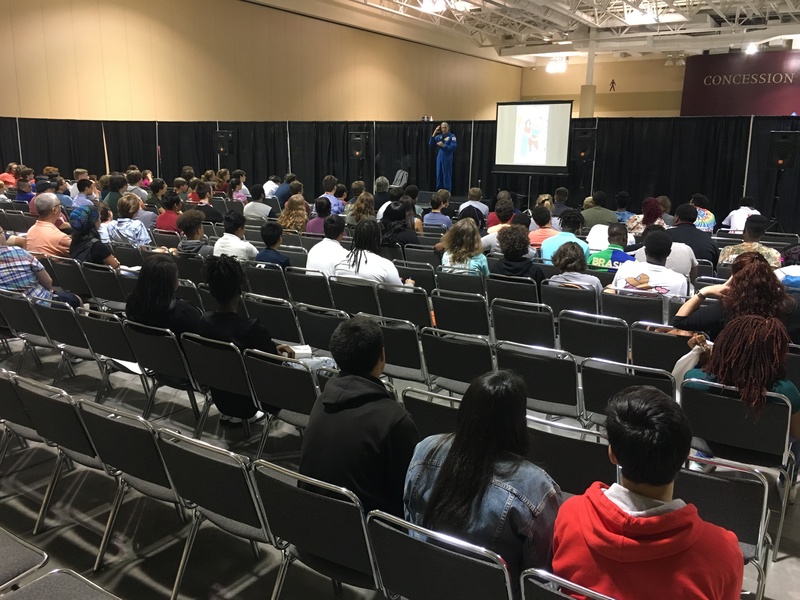 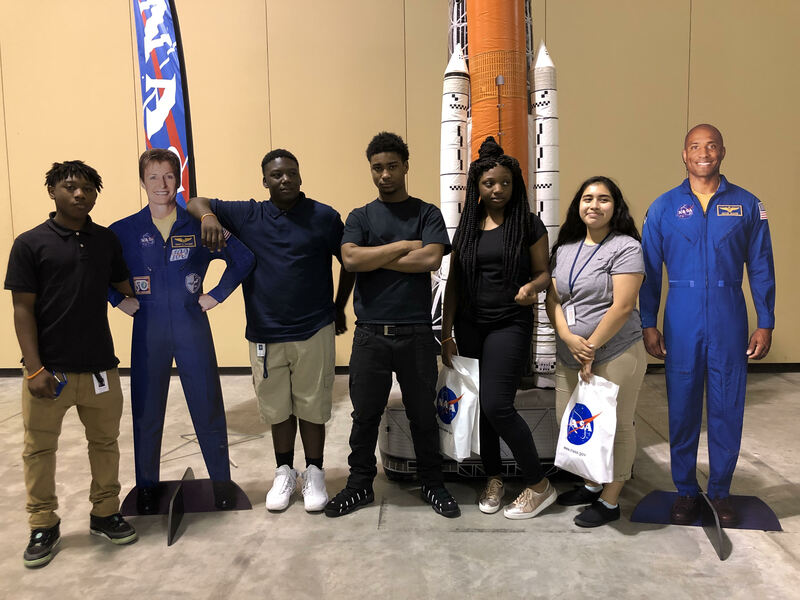 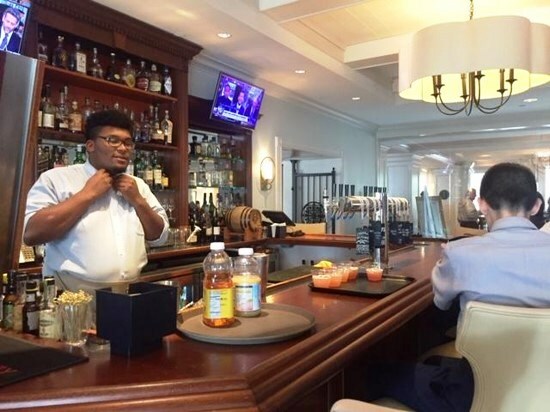 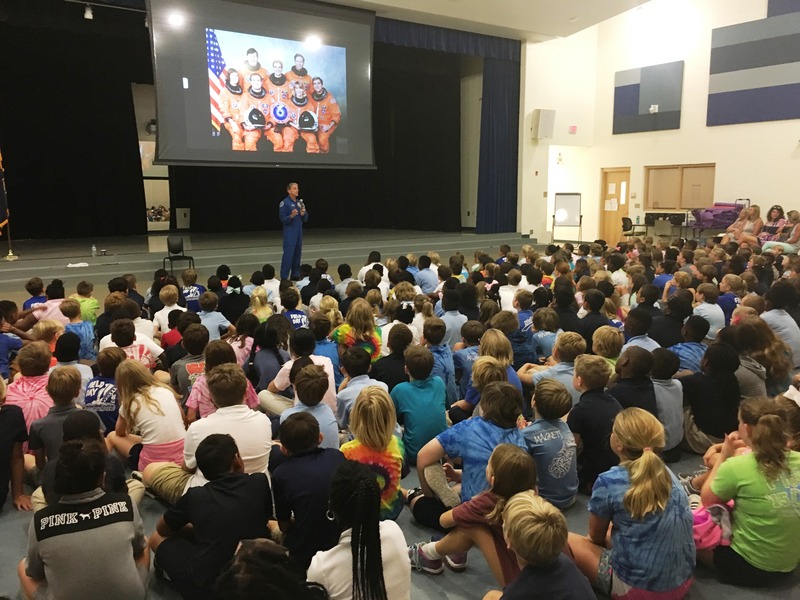 This project-based learning opportunity allowed the students to practice healthy teamwork and communication, and sharpened their presentation skills. To complete the experience, students designed cards with individual messages written to breast cancer patients. 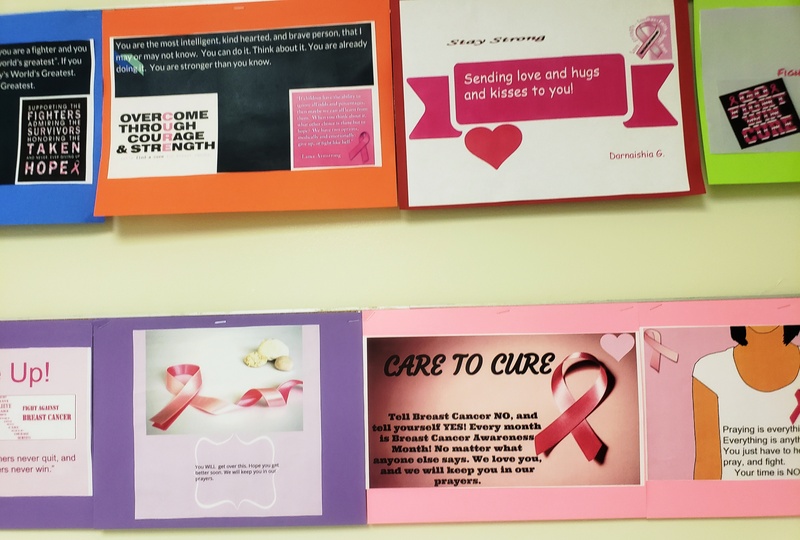 Their teacher, Mrs. Kylene Gerideau-Grant delivered all the cards to Roper St. Francis’ Charleston Hematology & Oncology Associates offices in West Ashley. 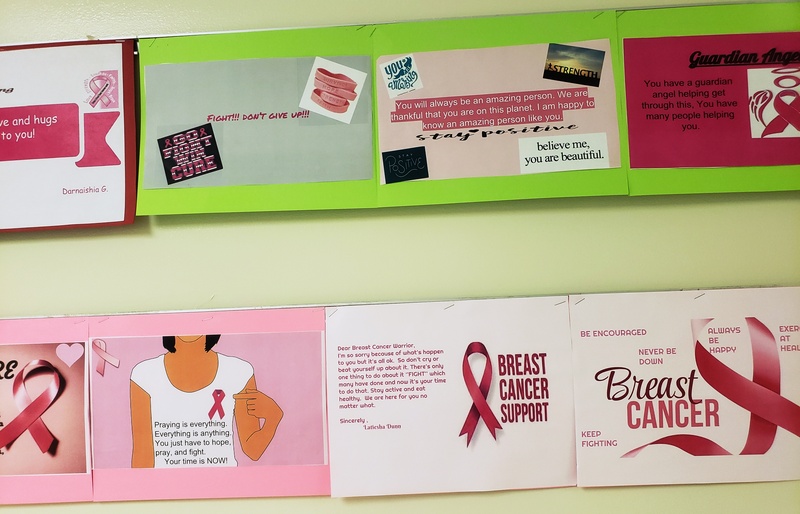 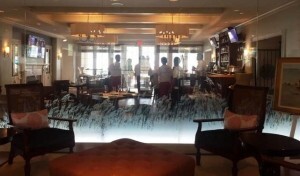 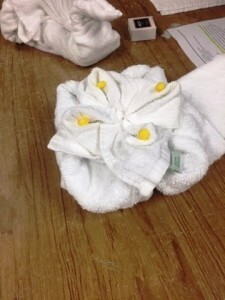 The head nurse was touched by the kind gesture and the messages from the students. 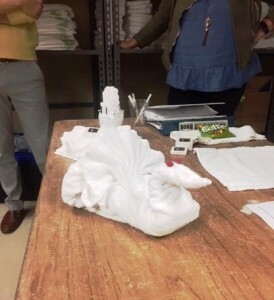 She also remarked on the students’ design abilities. 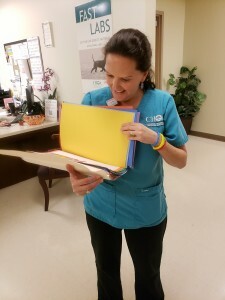 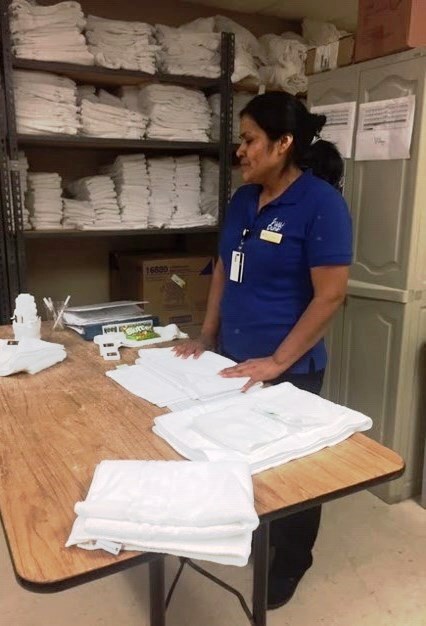 She promised to ensure their patients will receive the cards to aid in lifting their spirits. 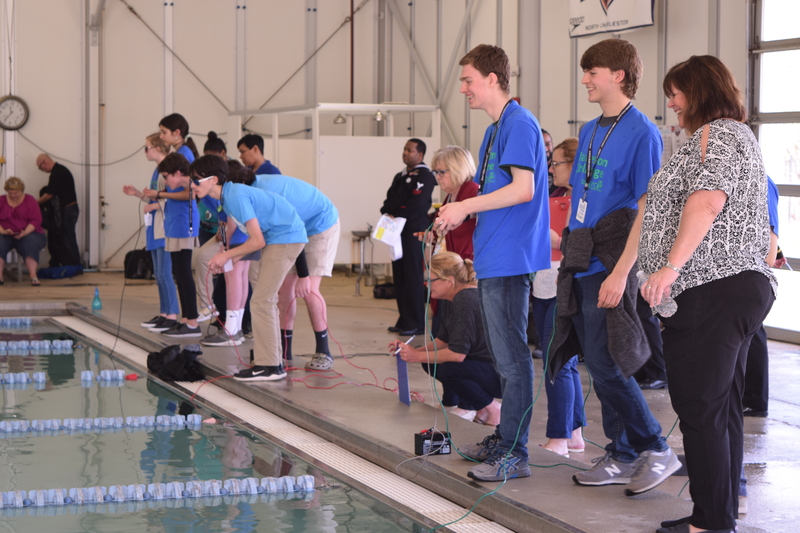 Thanks to everyone that helped make this rich experience possible for our students! 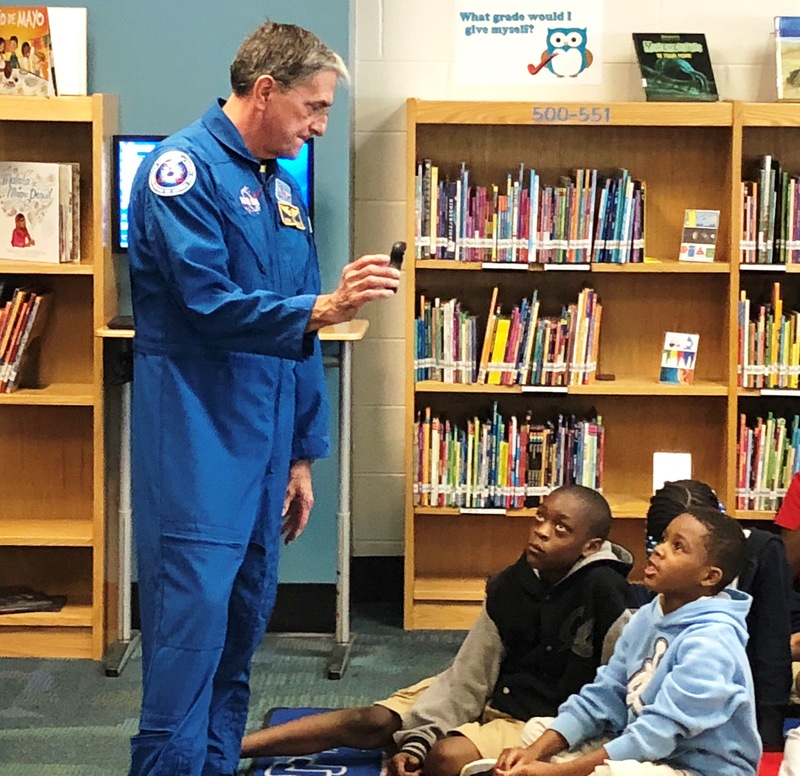 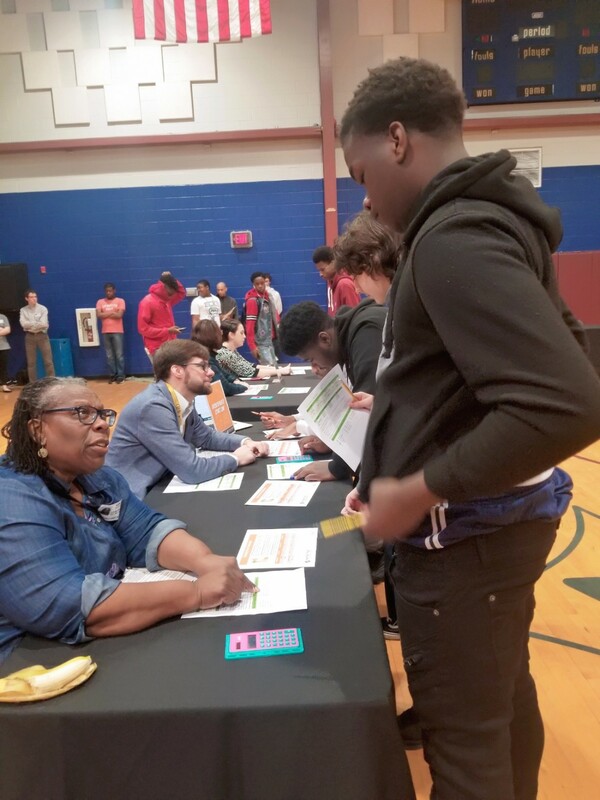 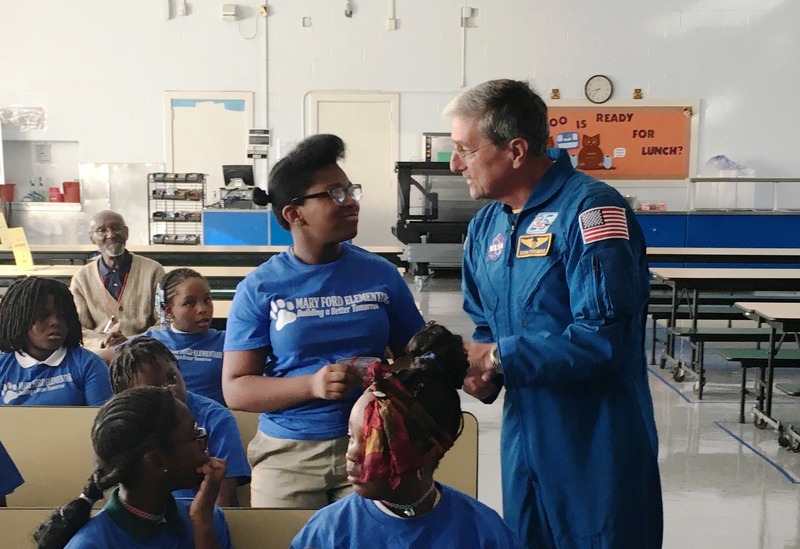 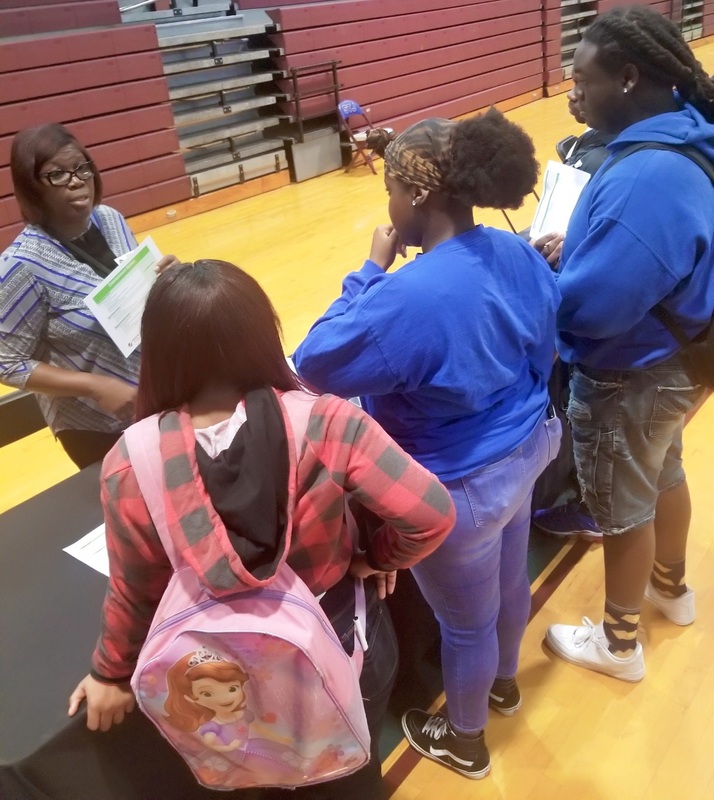 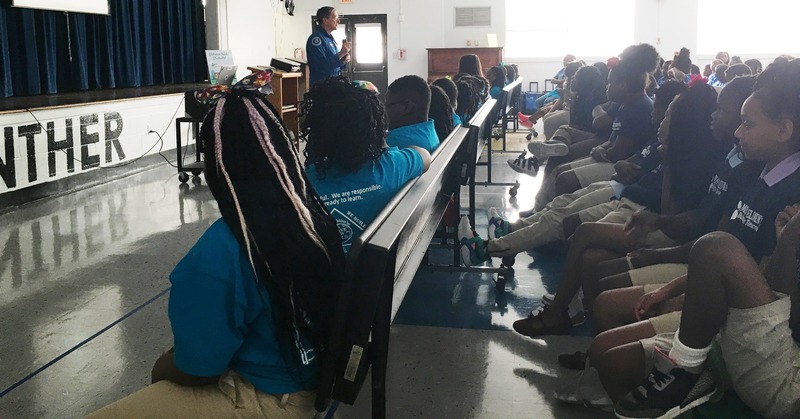 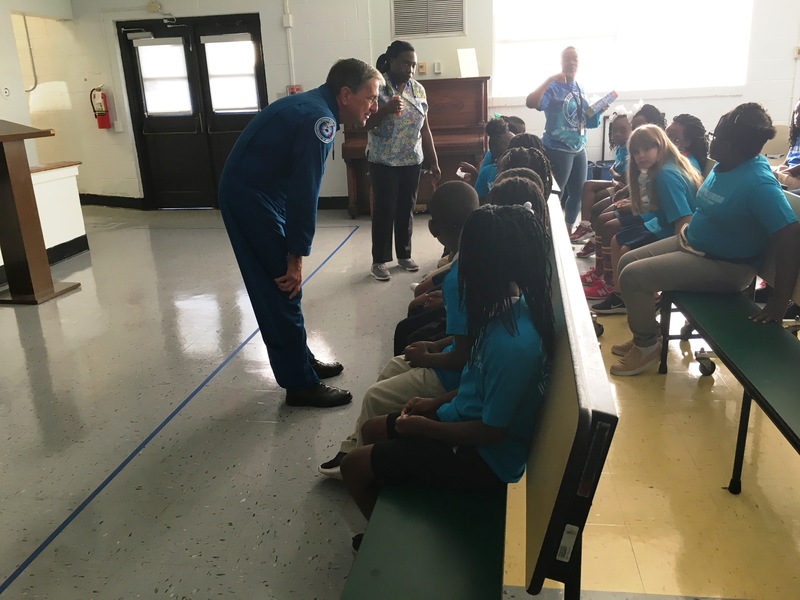 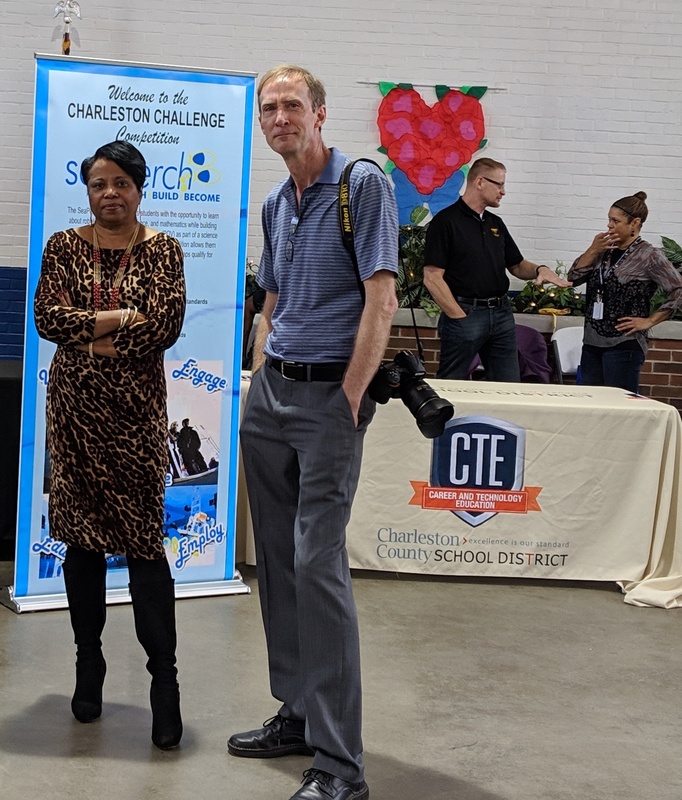 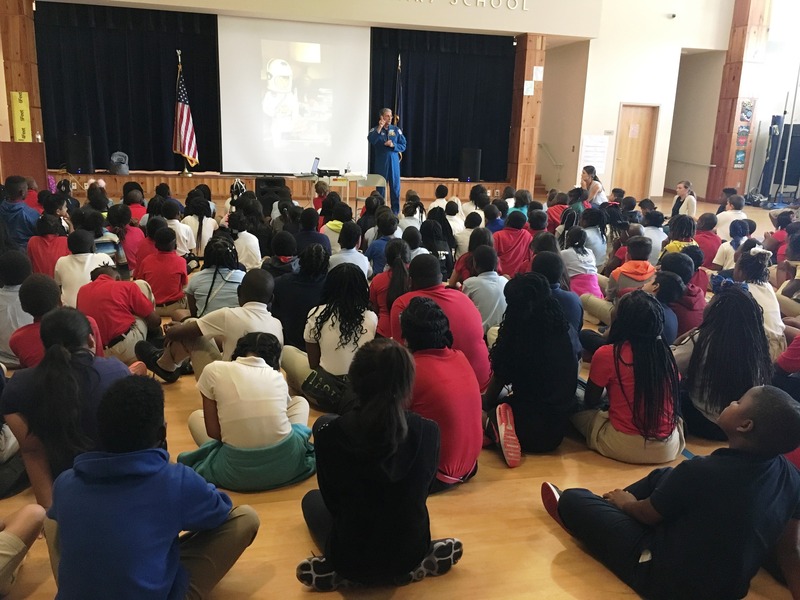 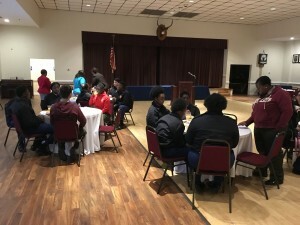 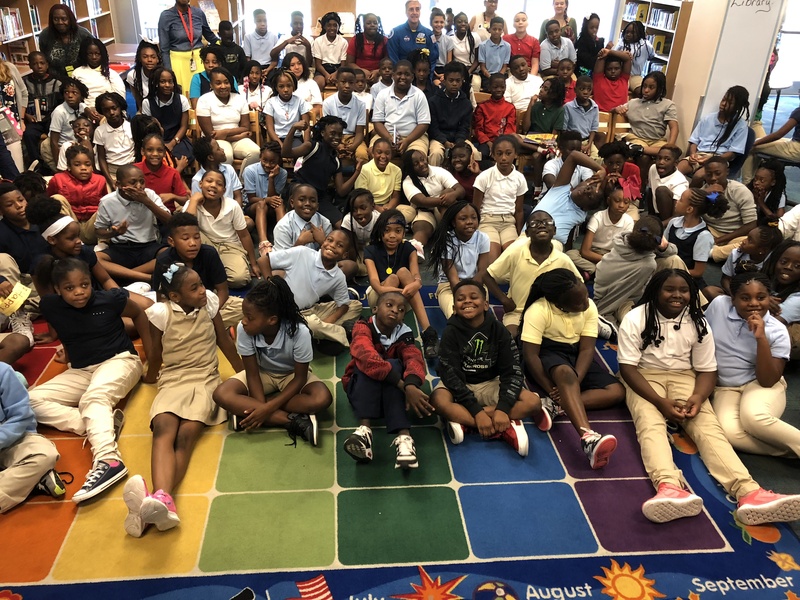 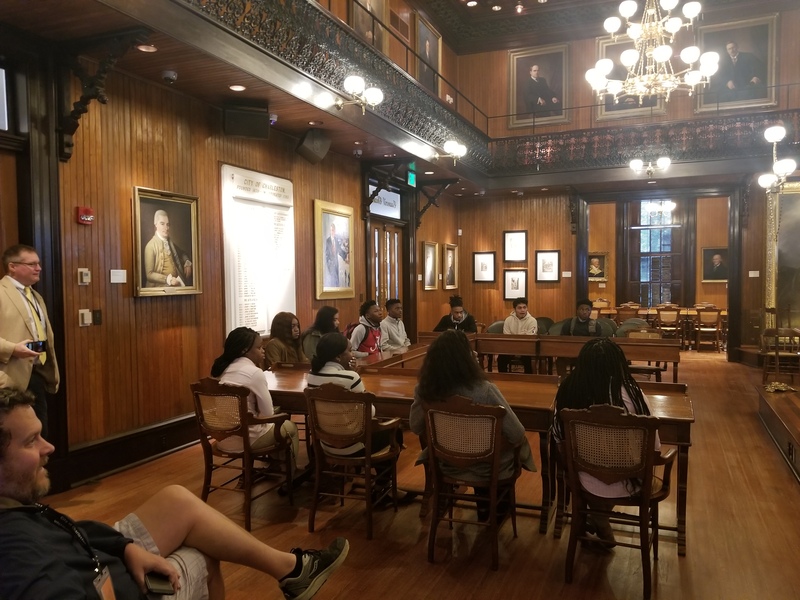 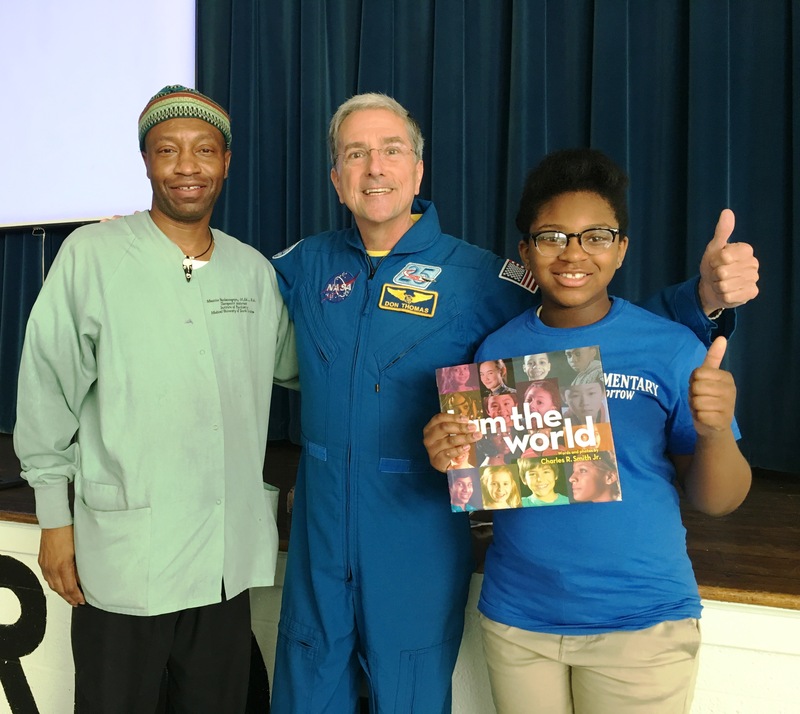 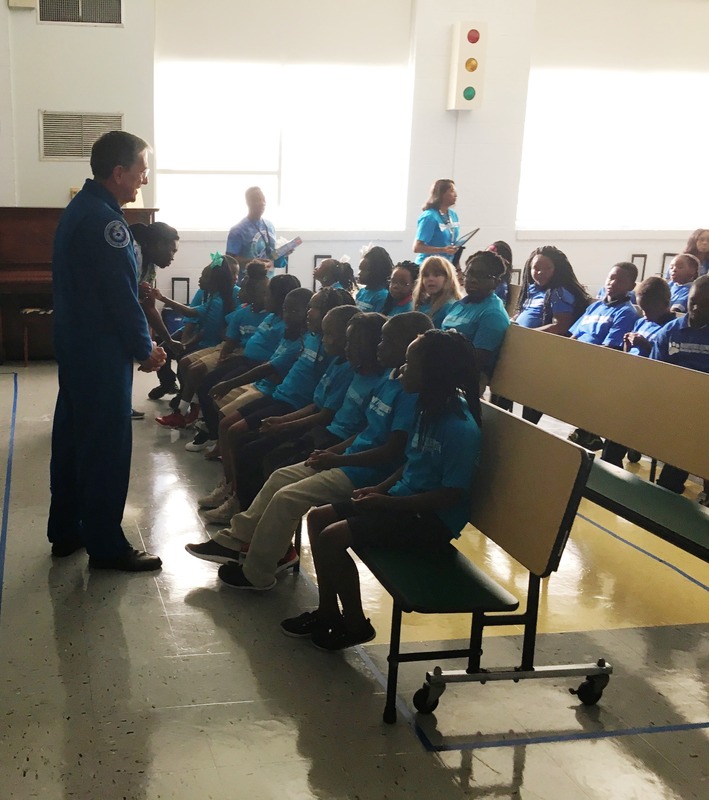 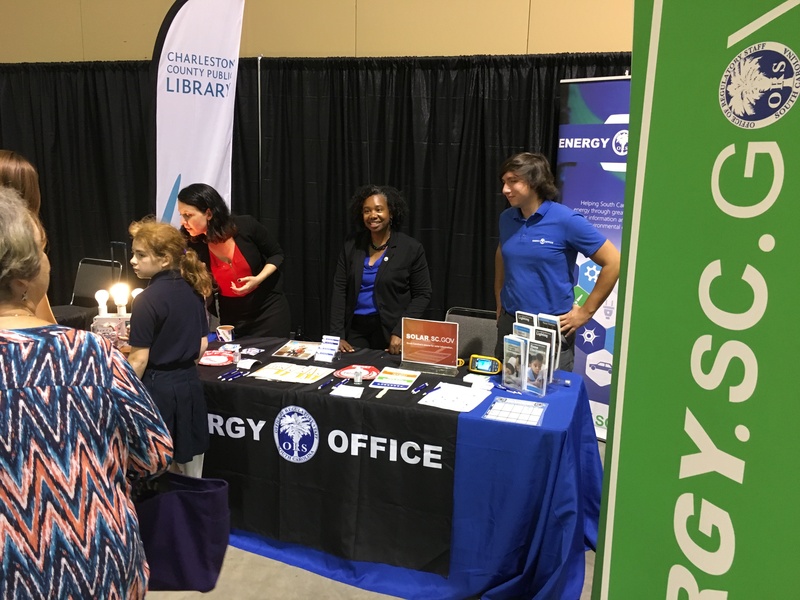 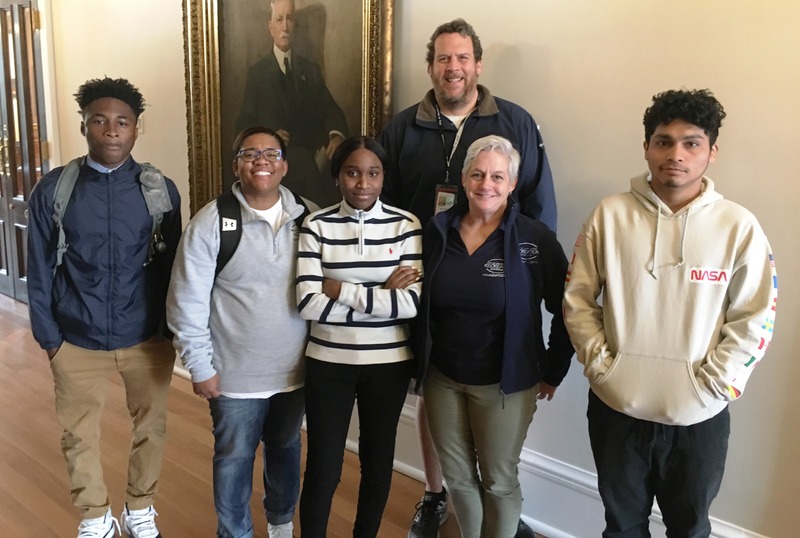 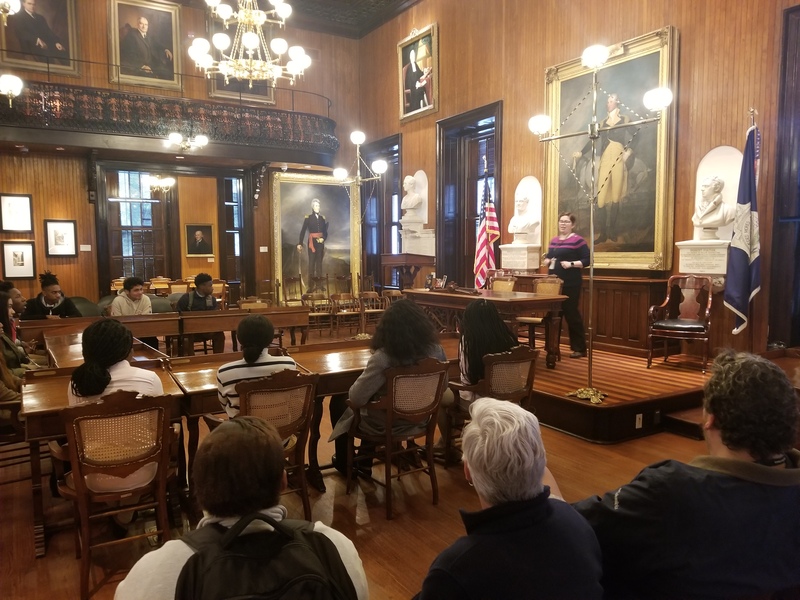 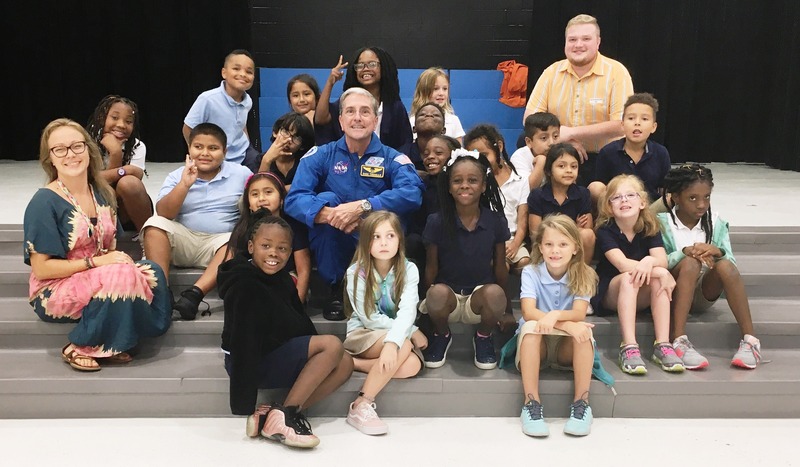 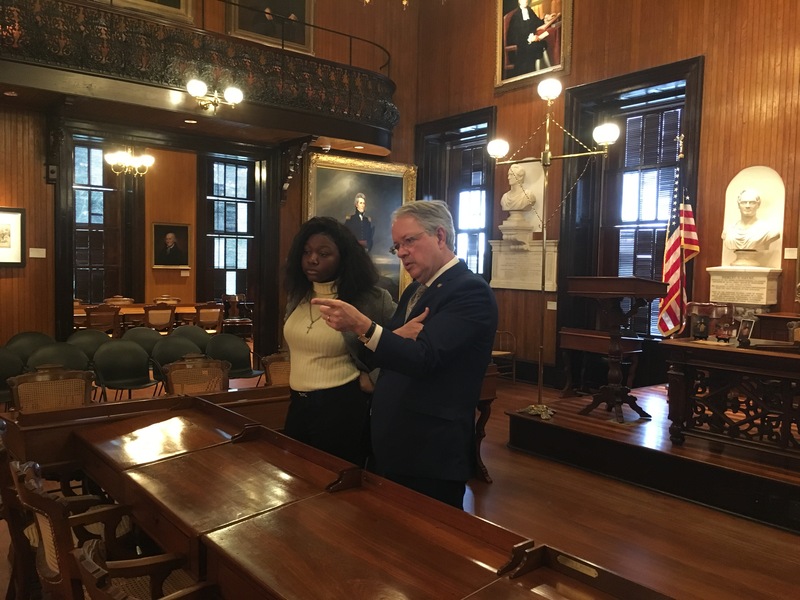 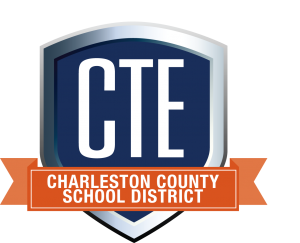 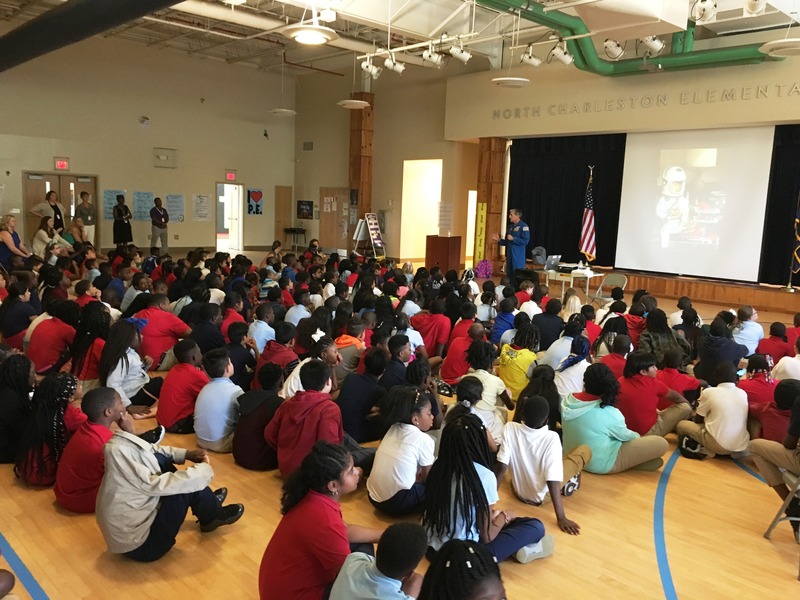 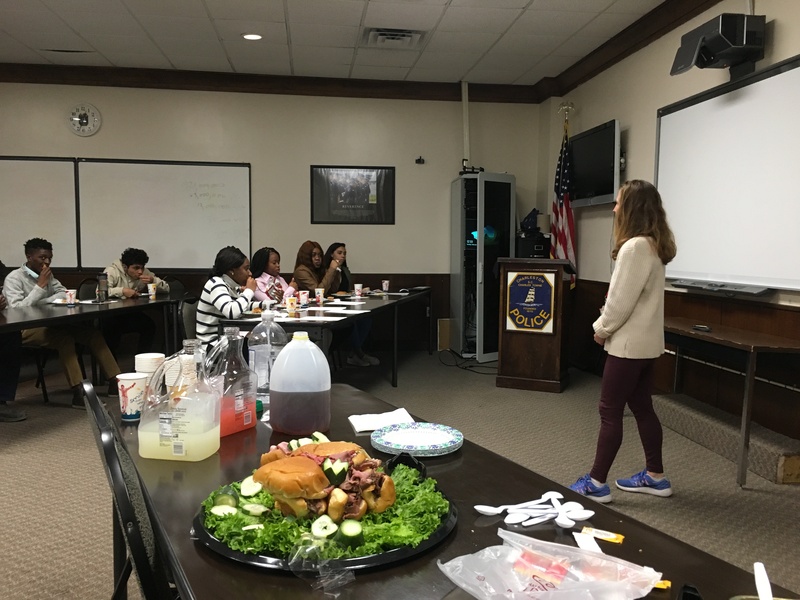 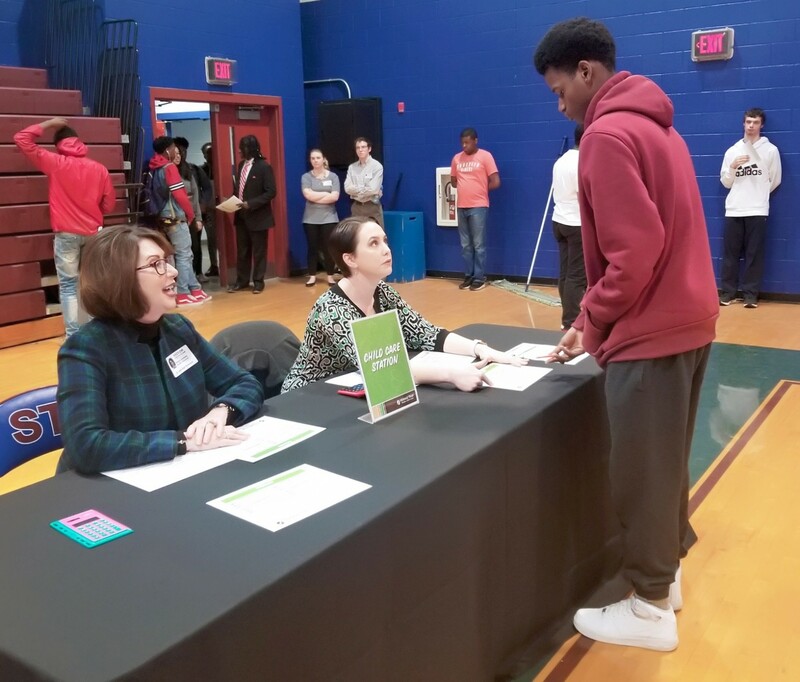 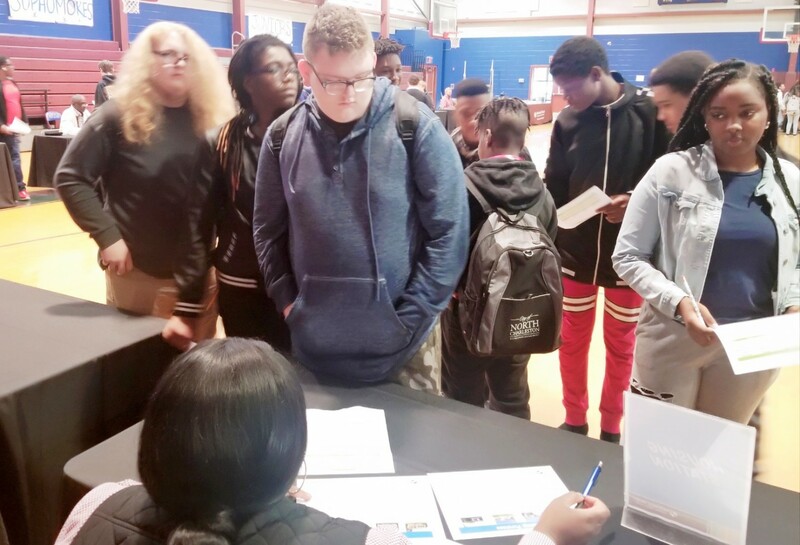 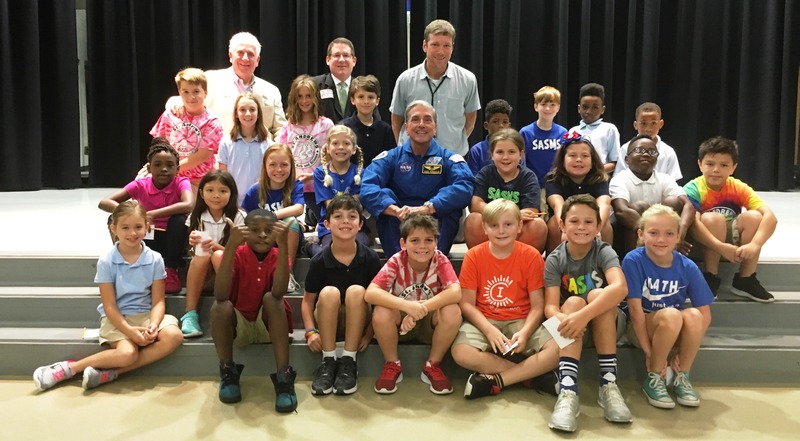 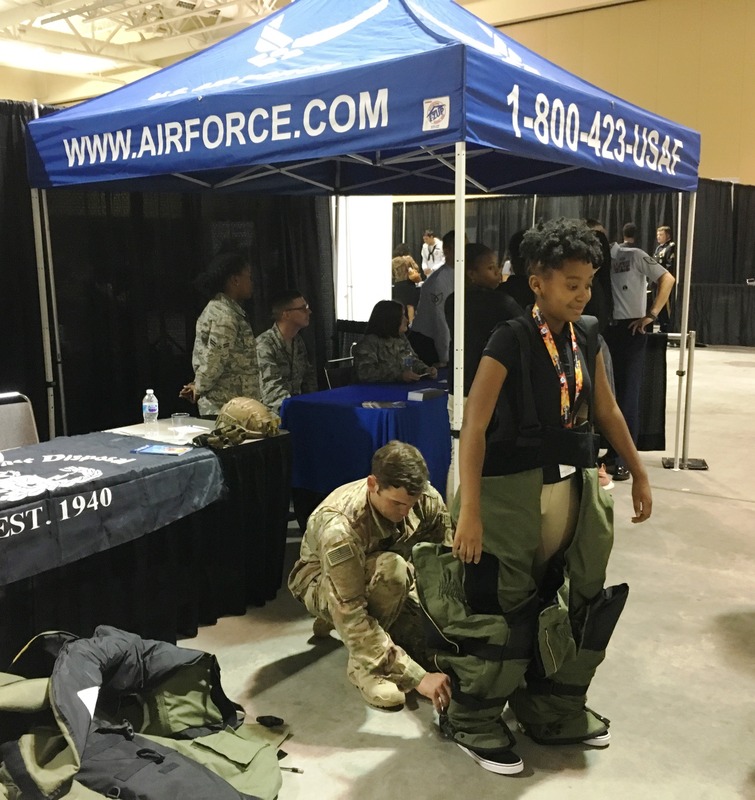 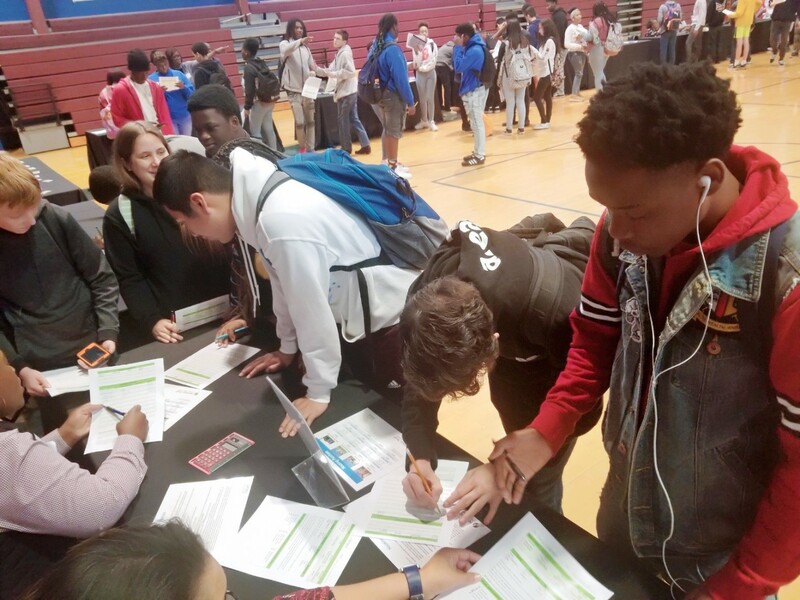 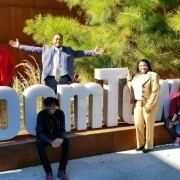 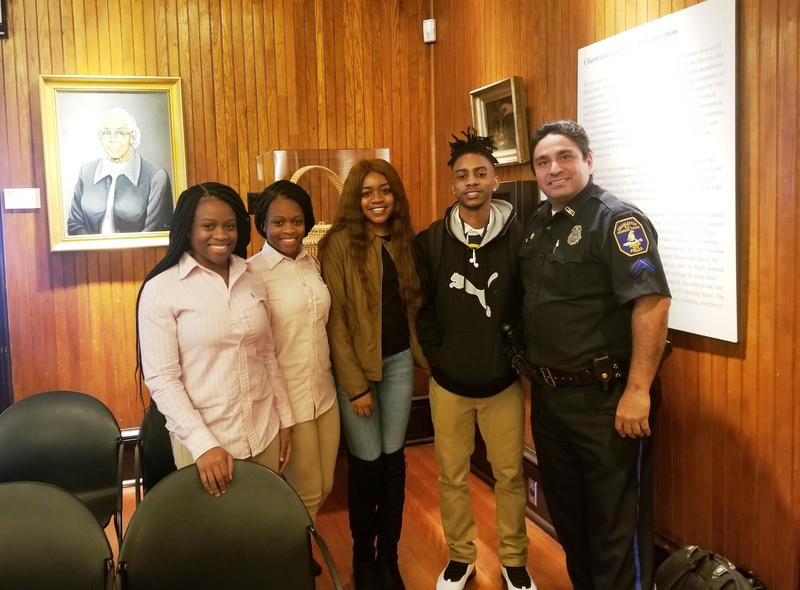 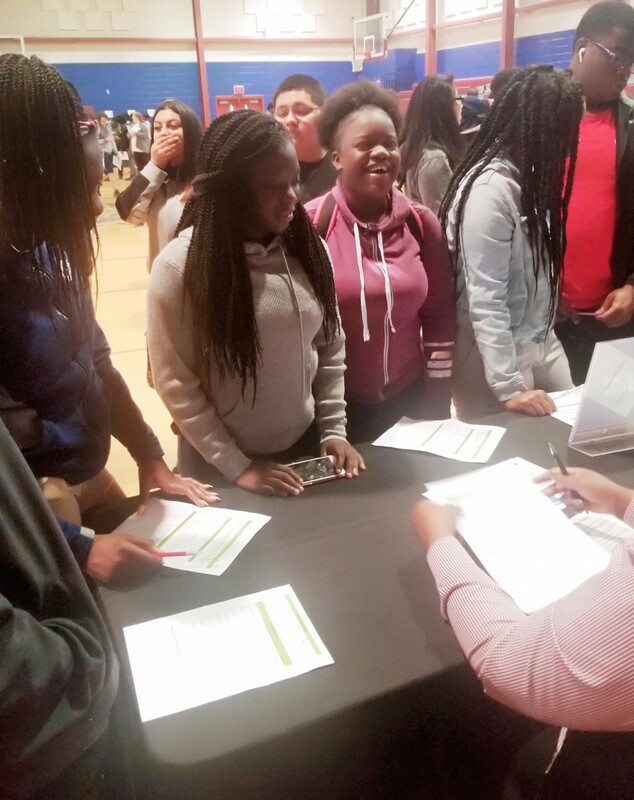 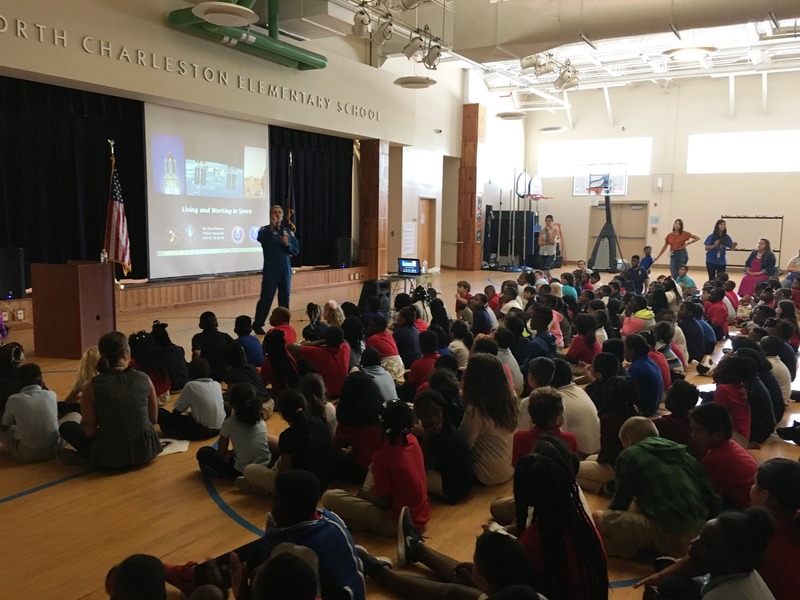 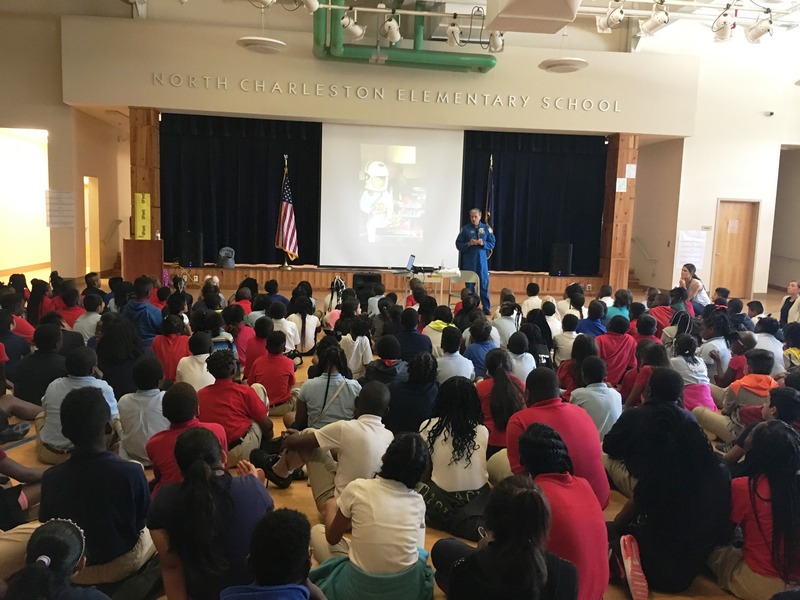 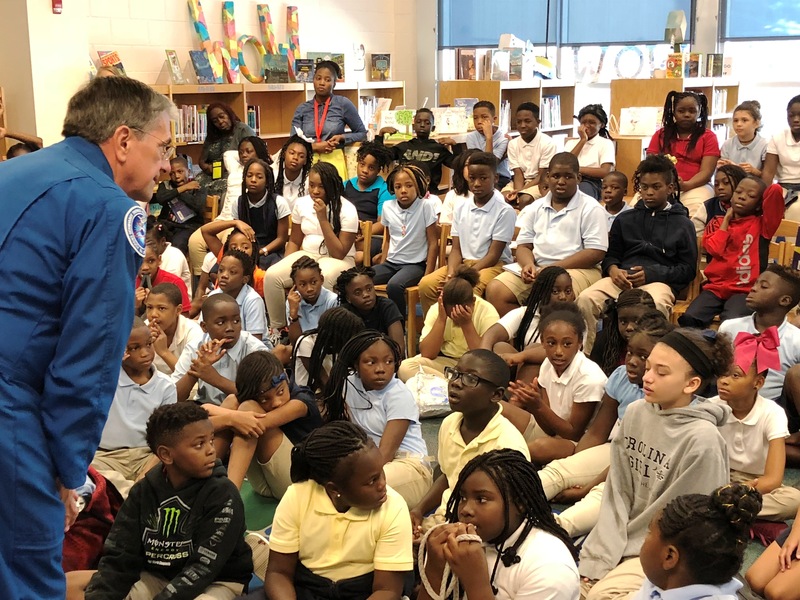 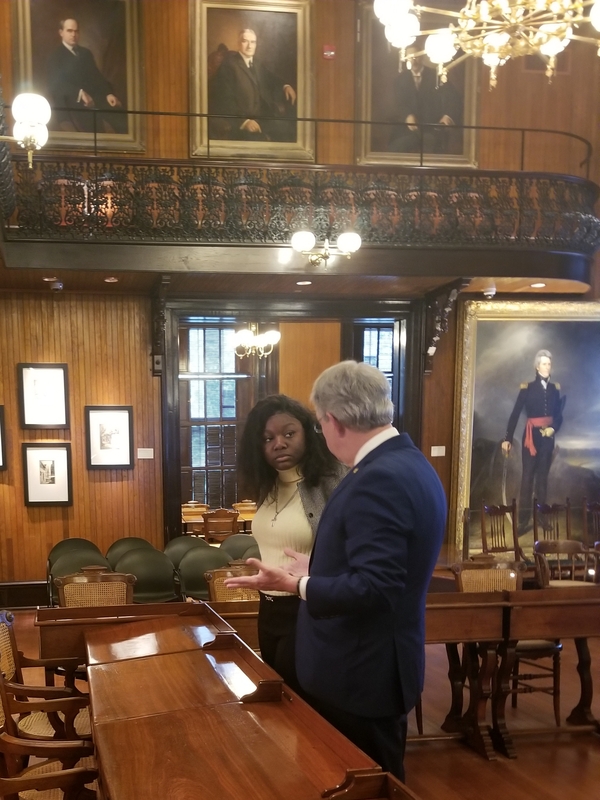 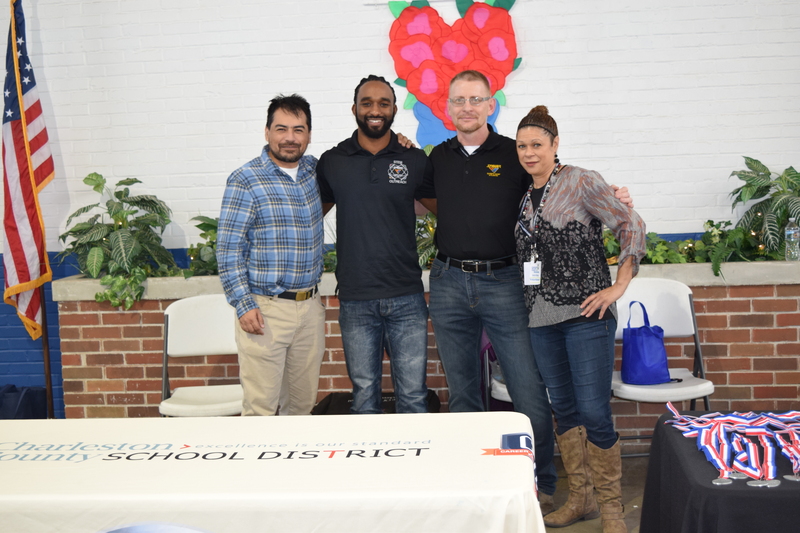 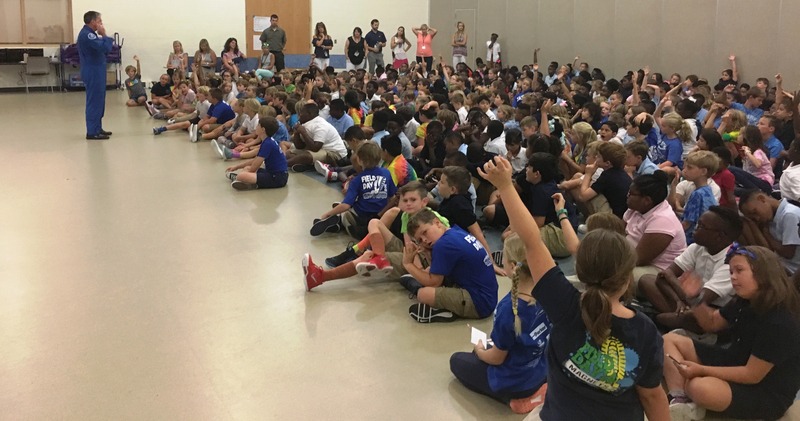 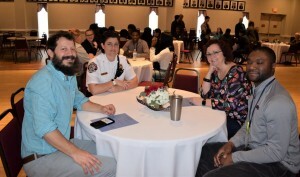 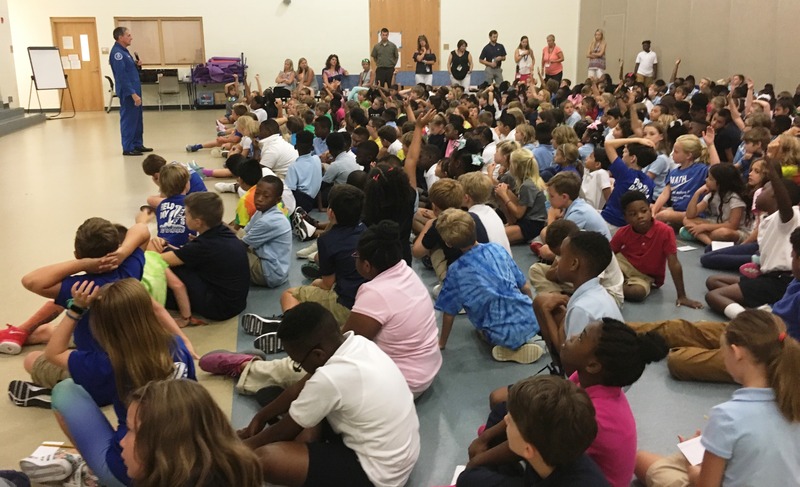 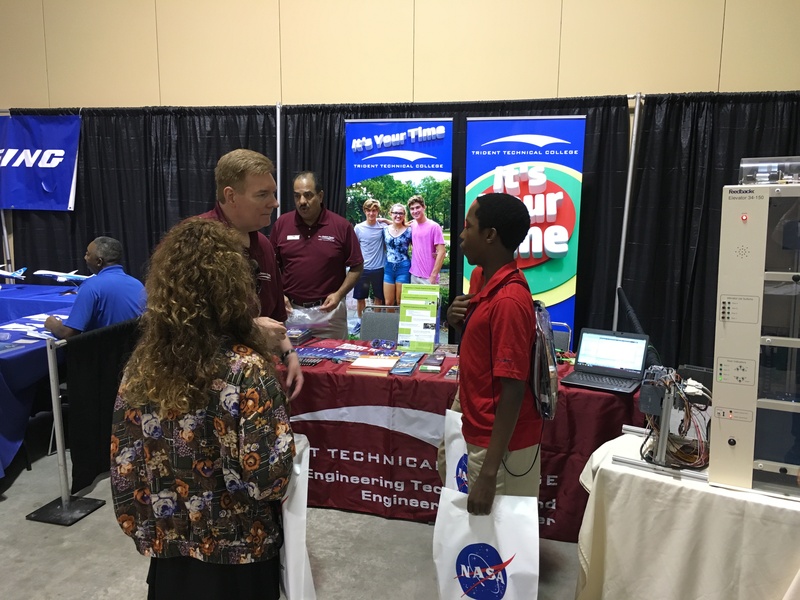 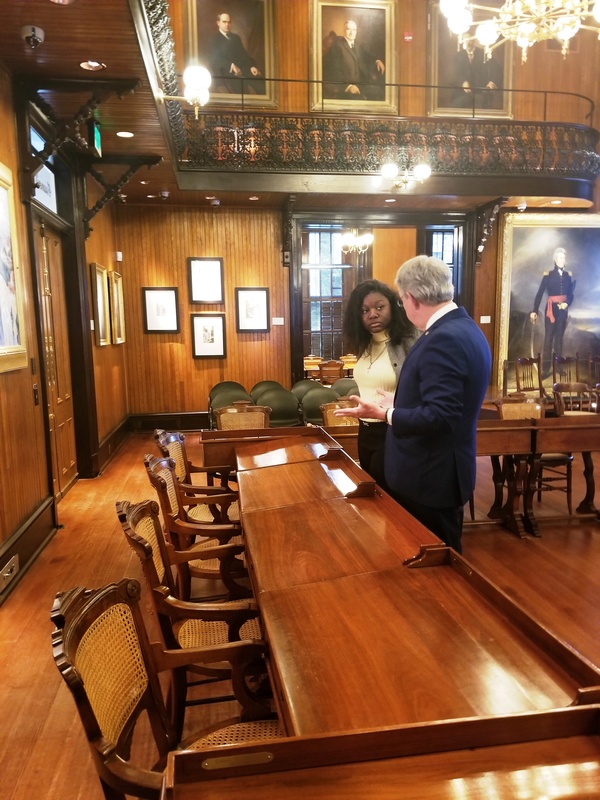 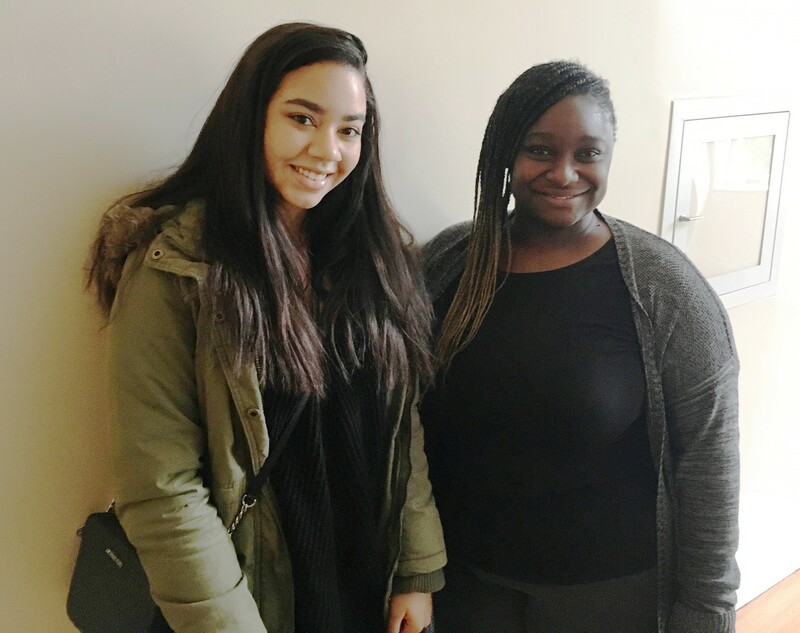 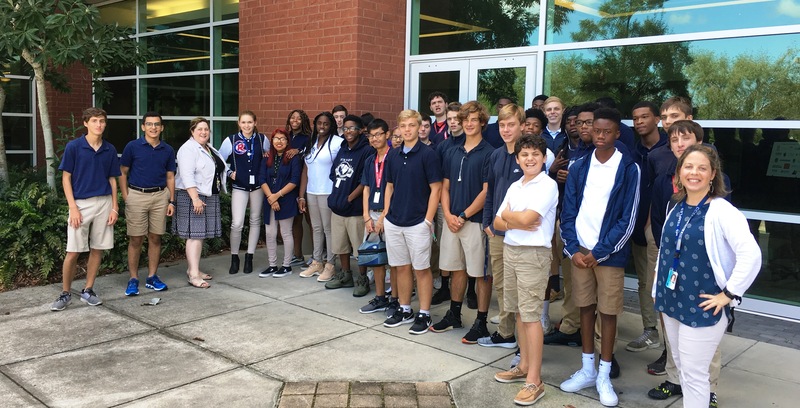 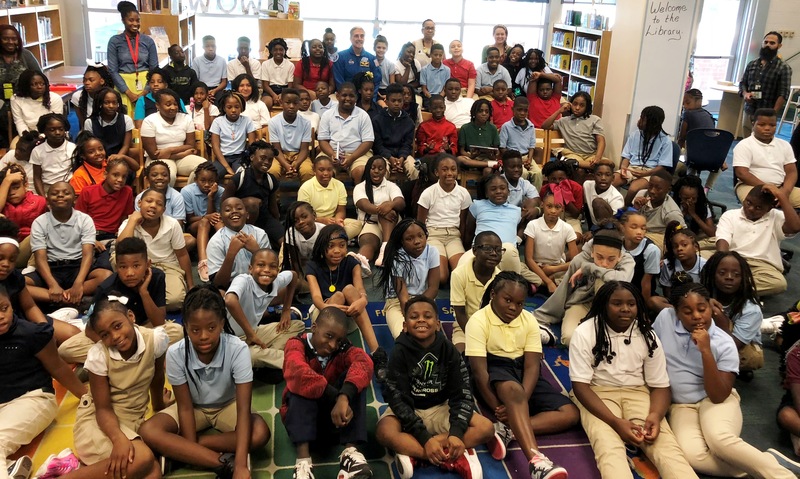 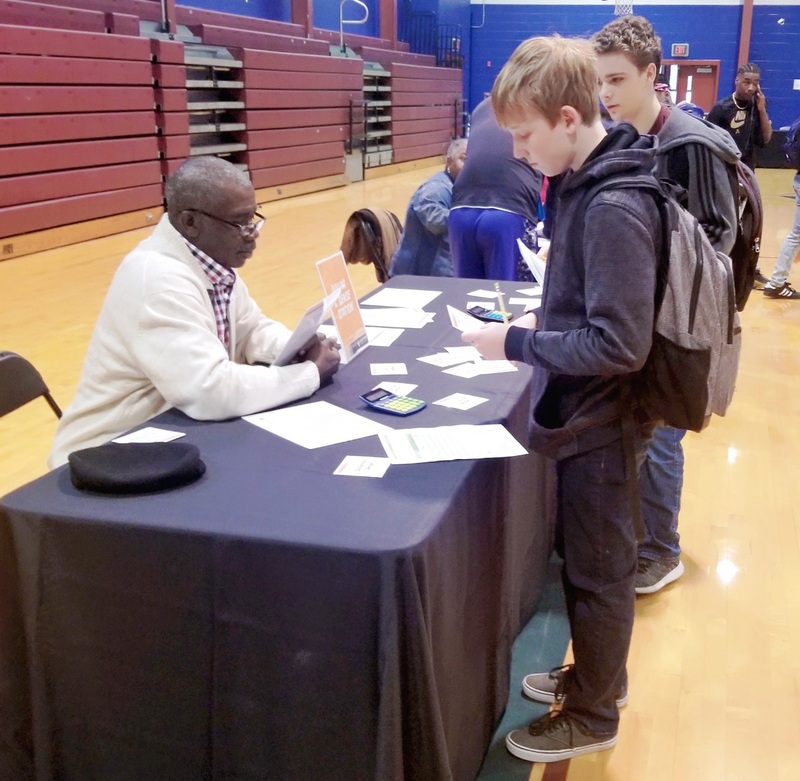 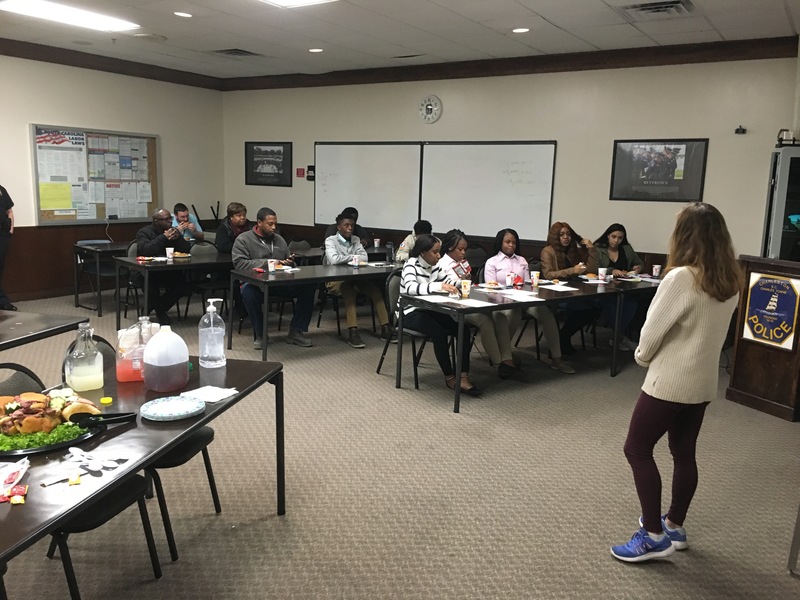 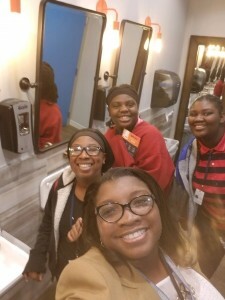 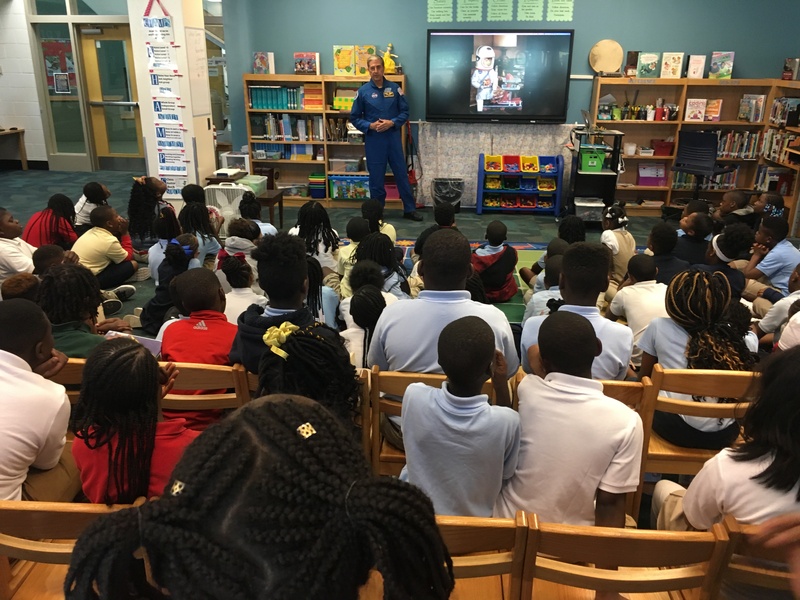 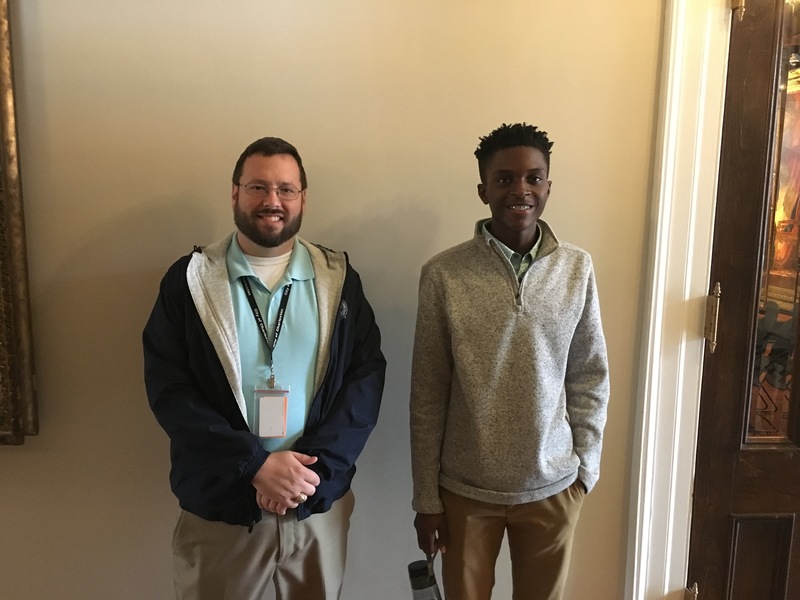 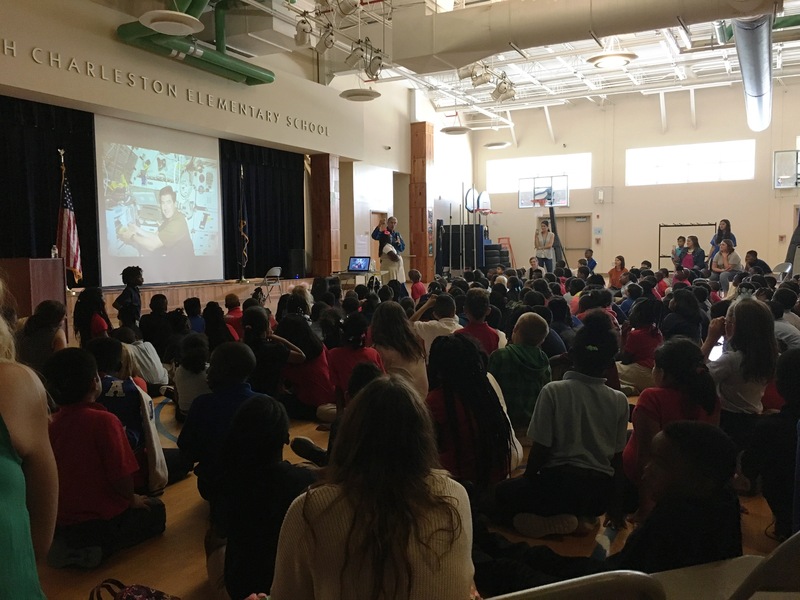 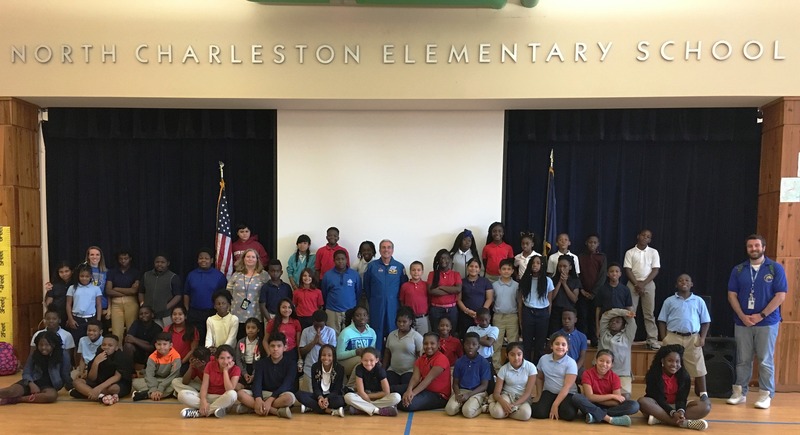 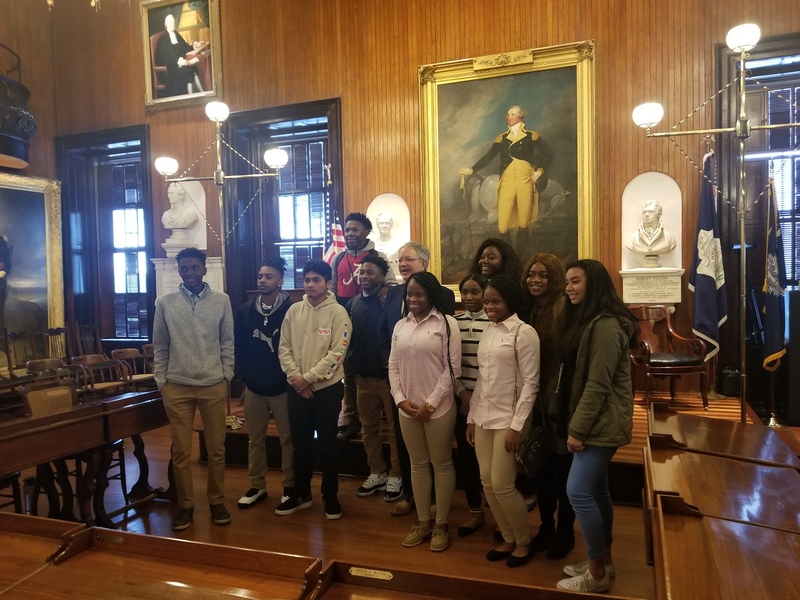 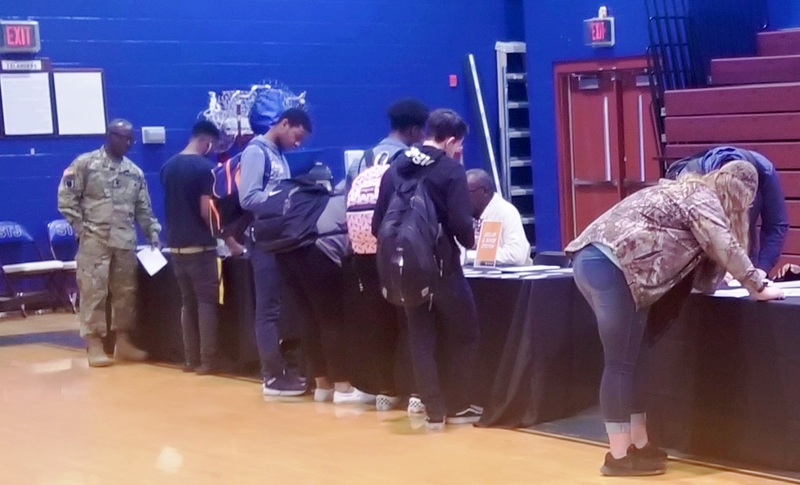 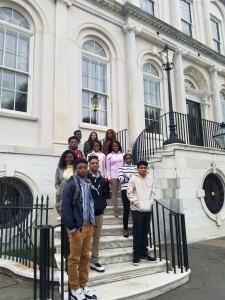 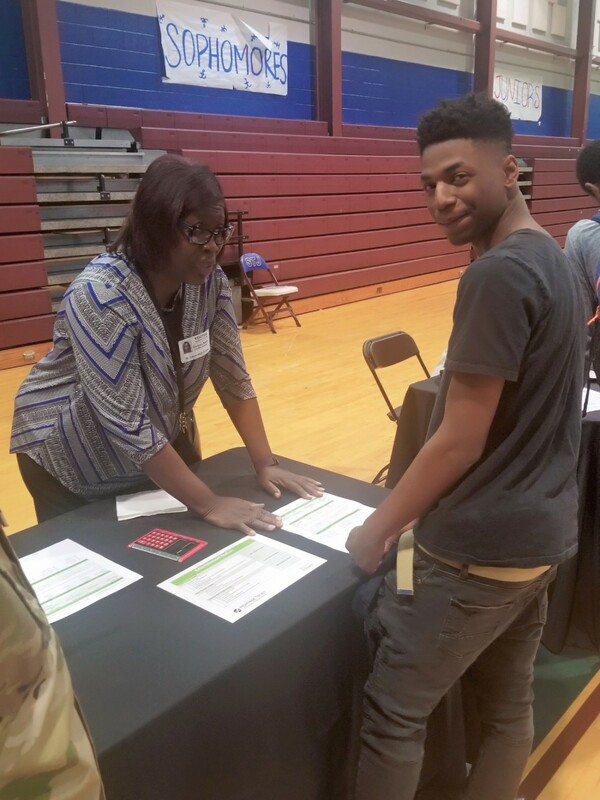 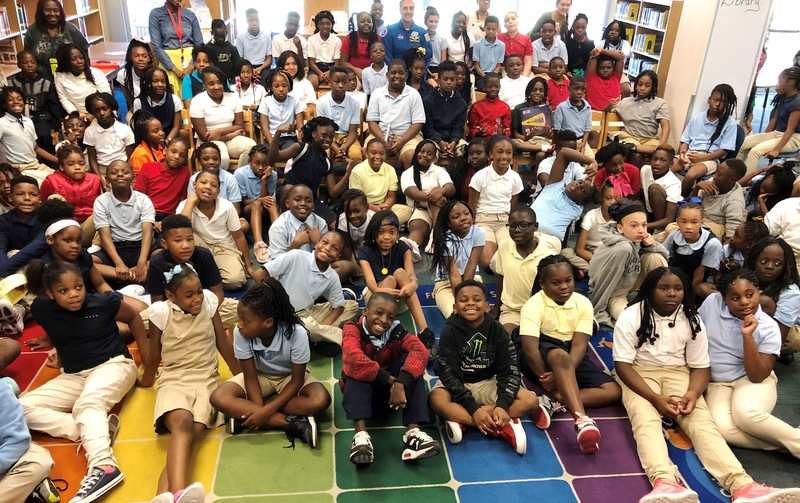 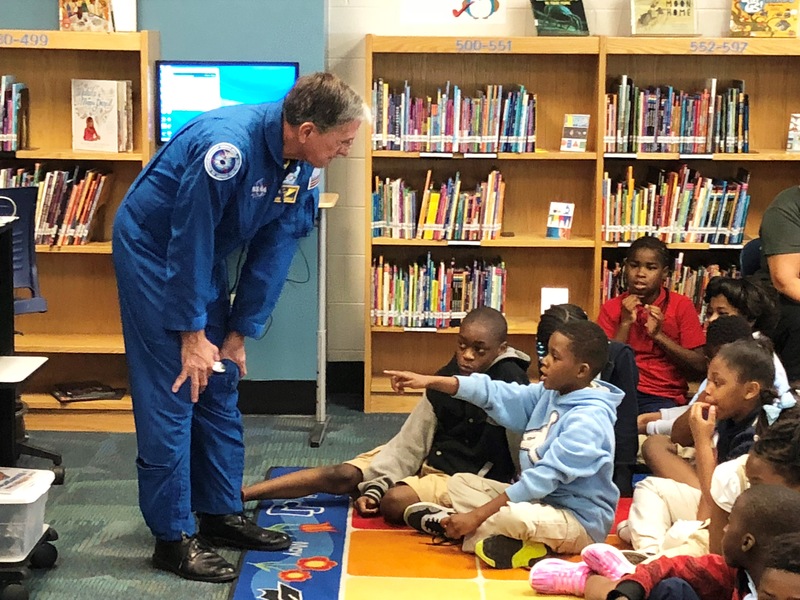 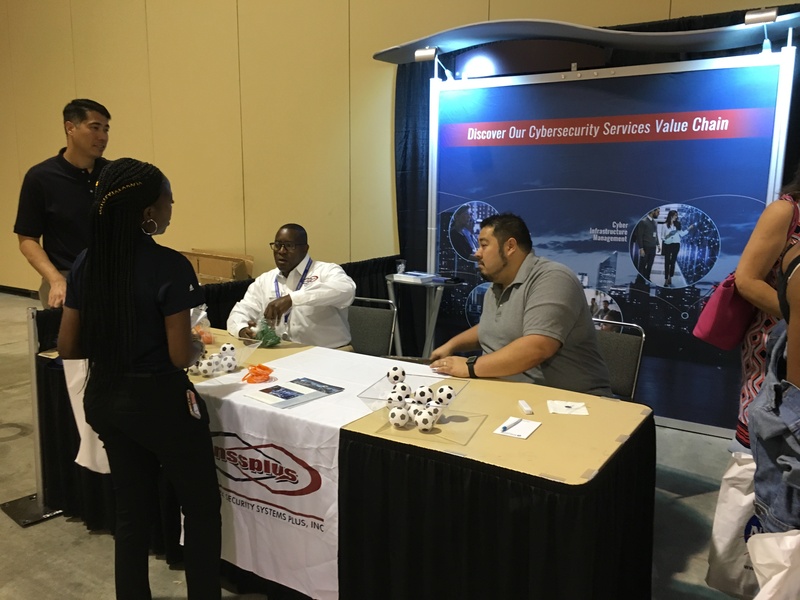 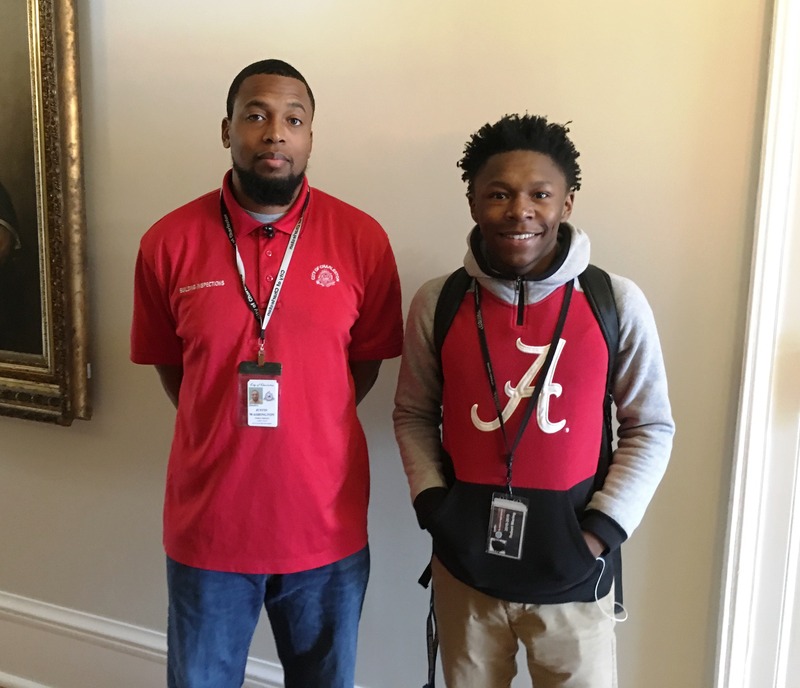 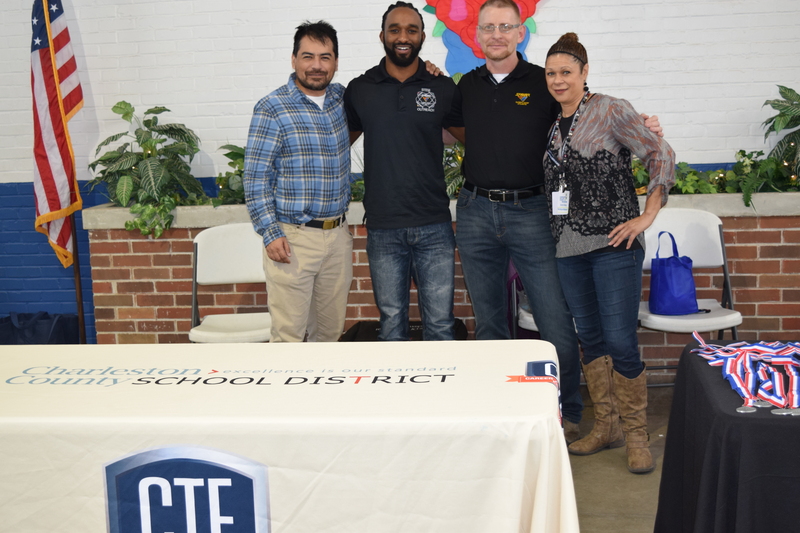 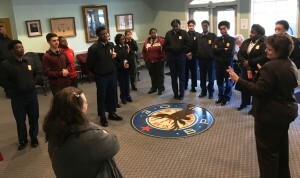 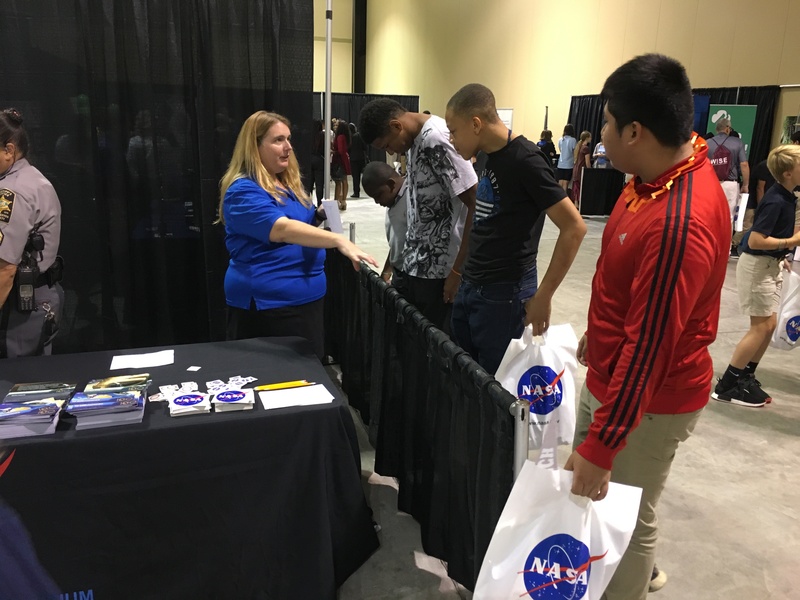 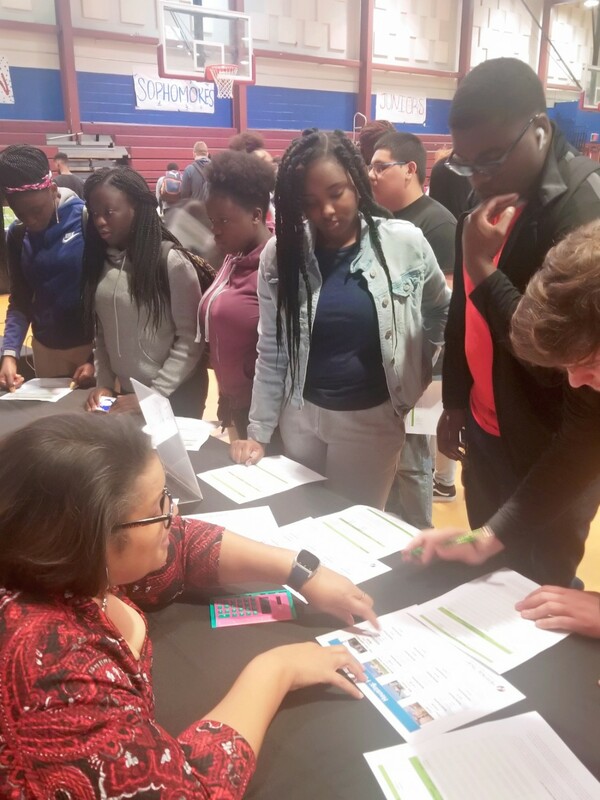 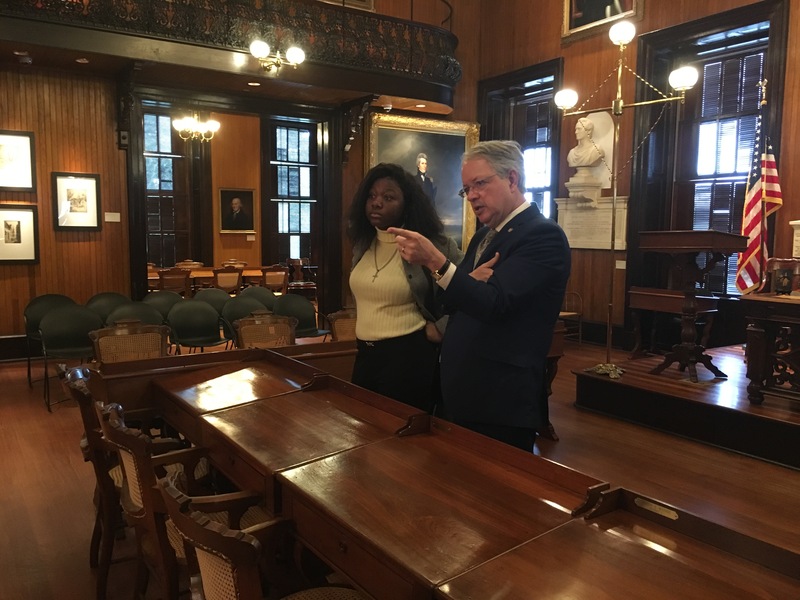 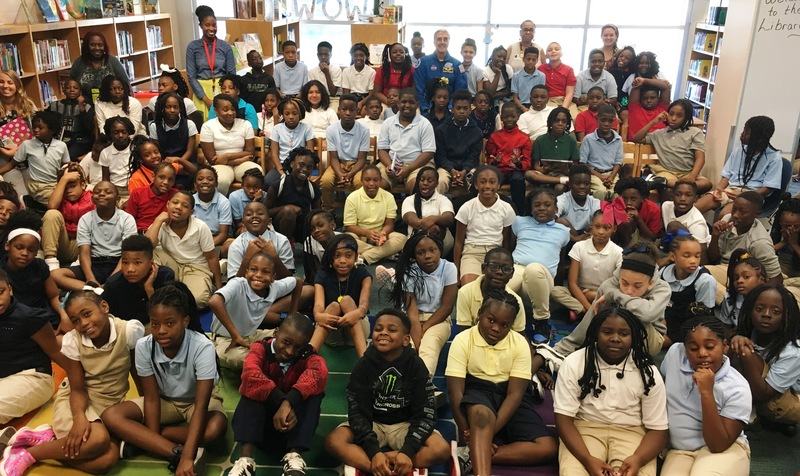 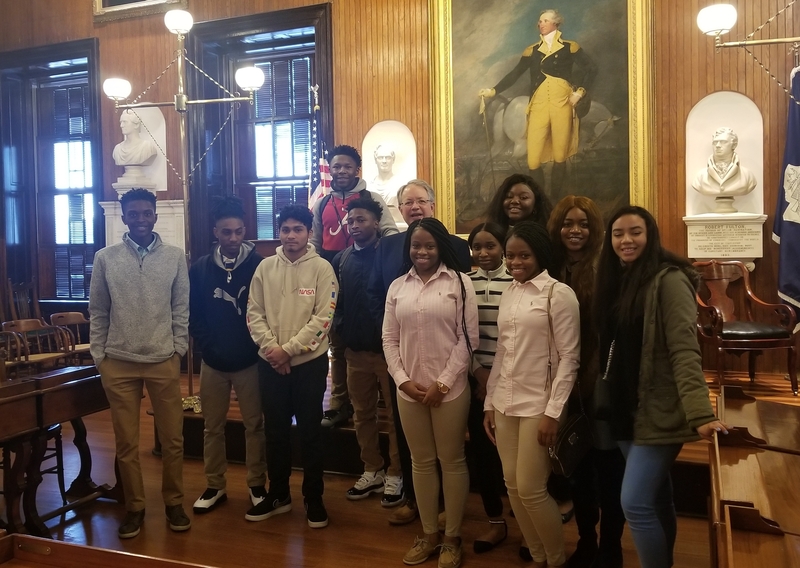 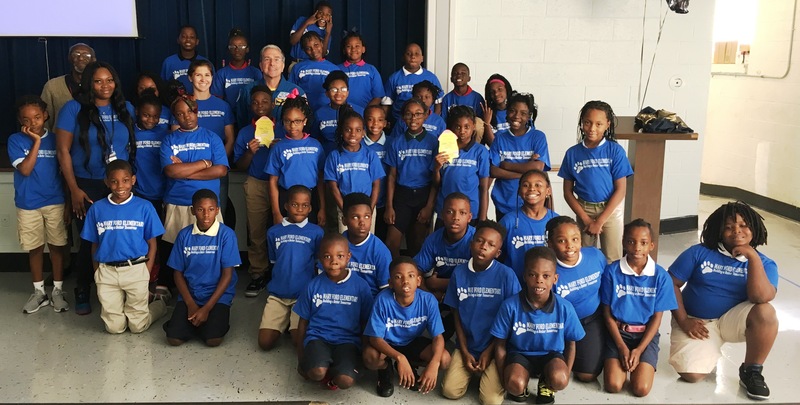 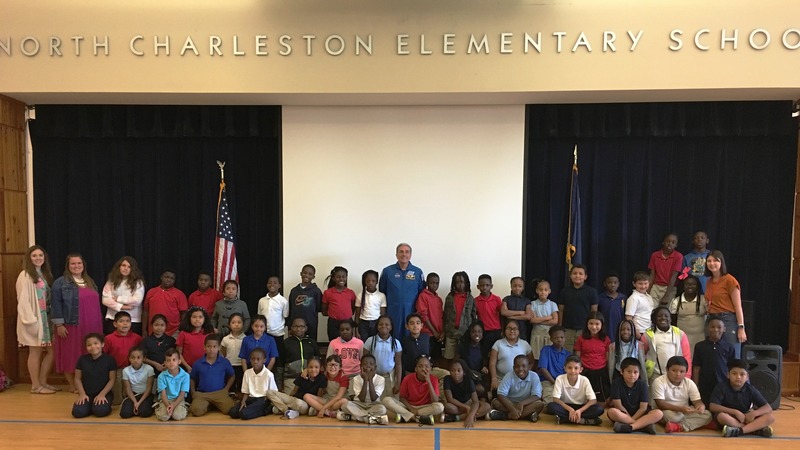 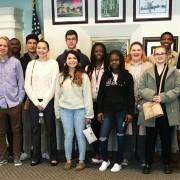 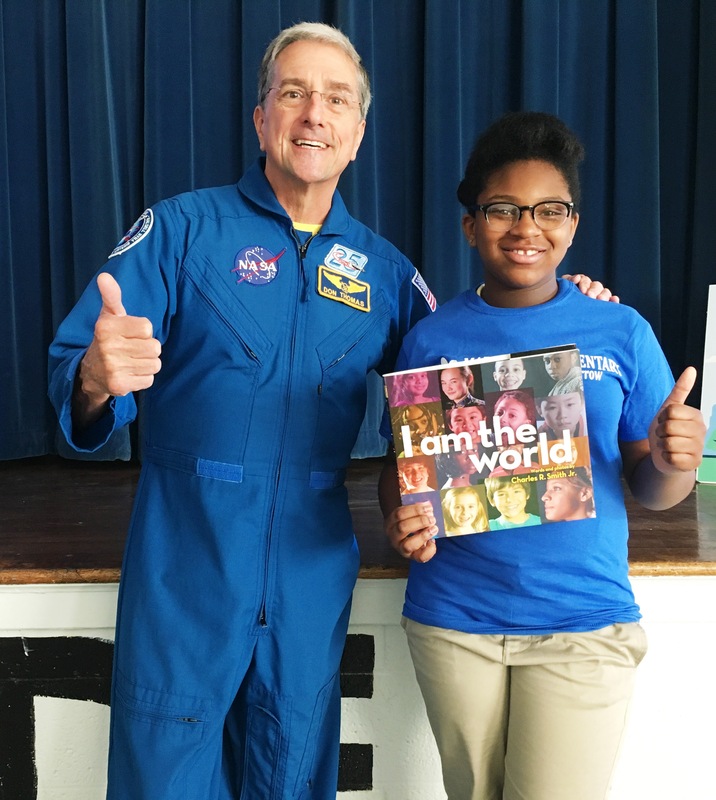 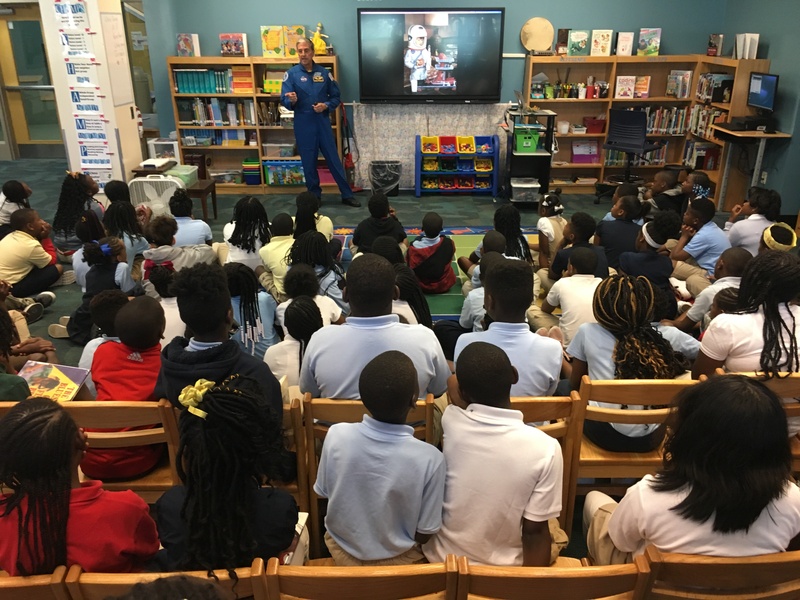 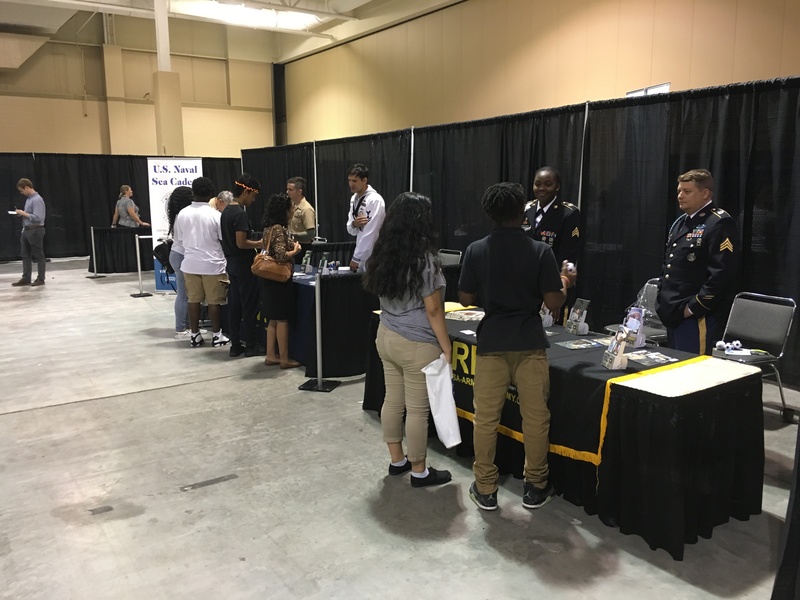 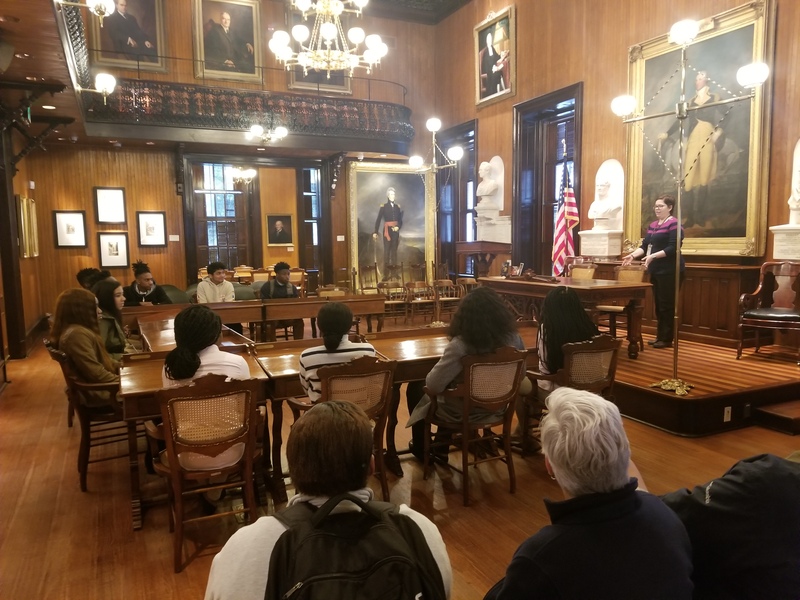 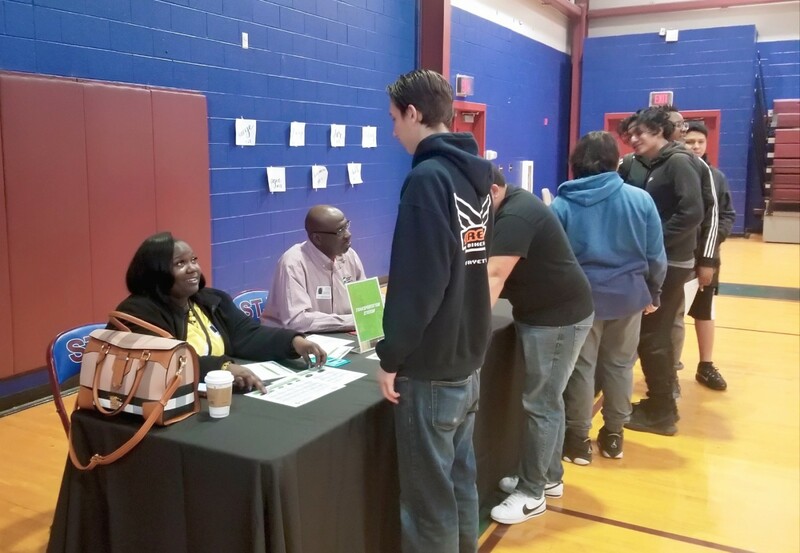 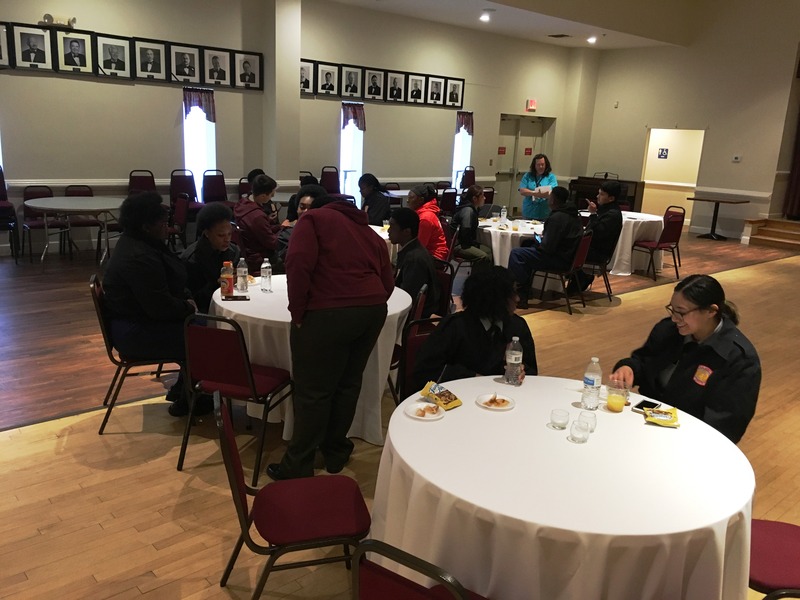 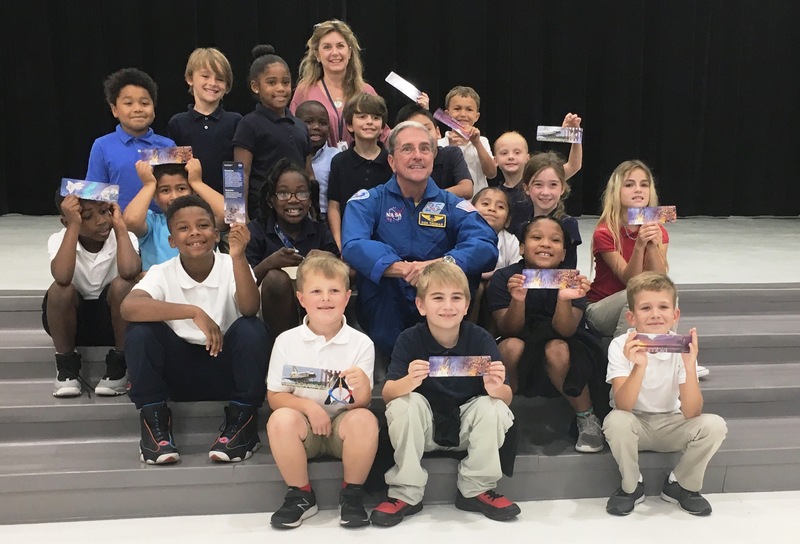 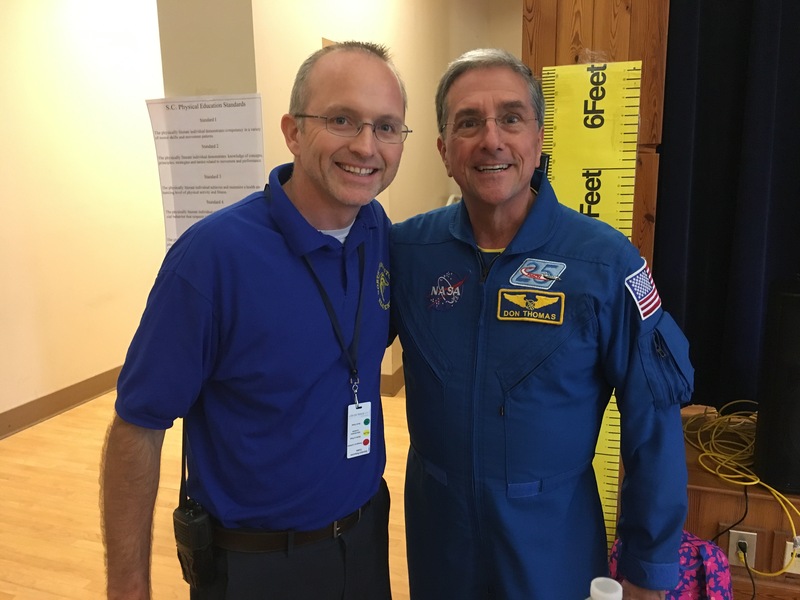 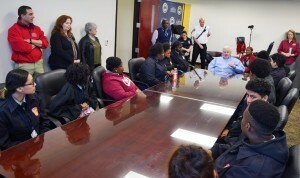 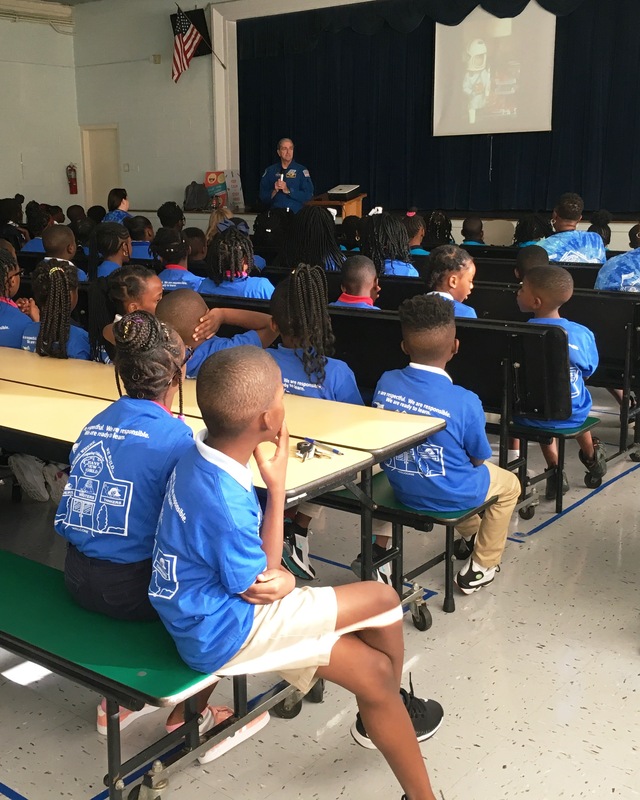 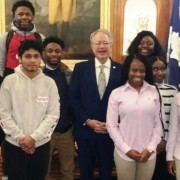 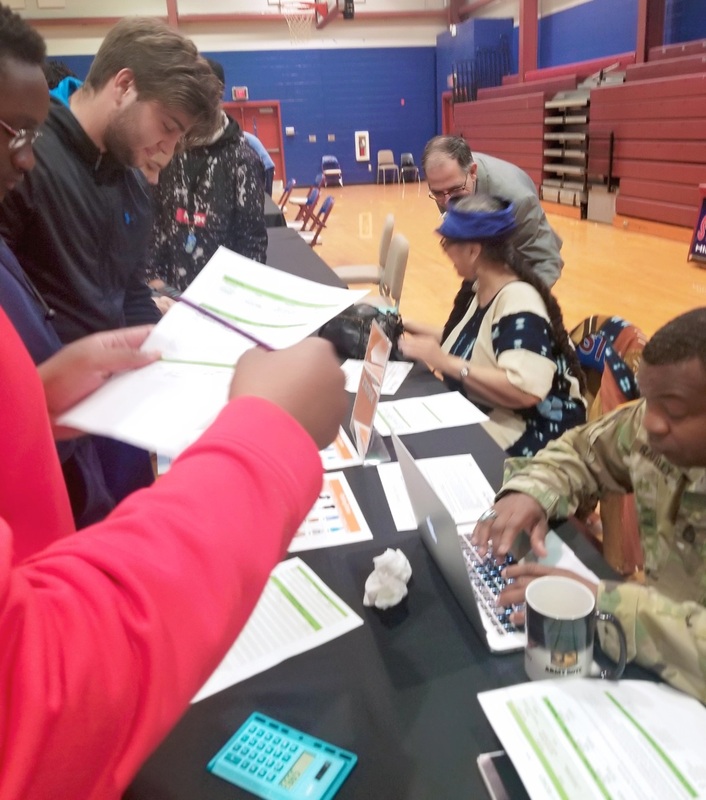 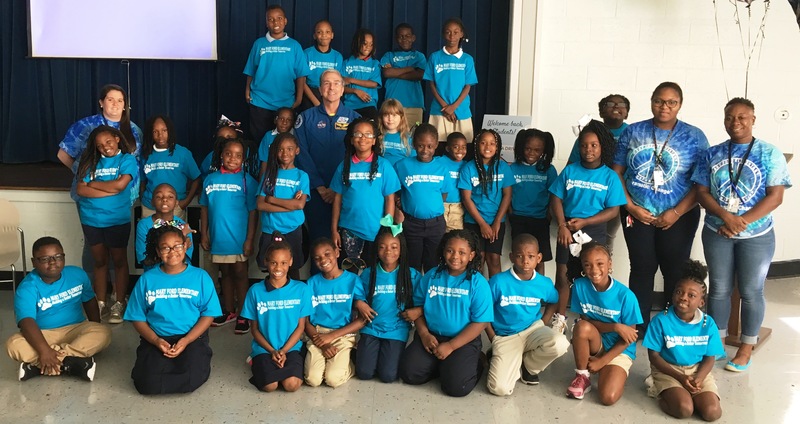 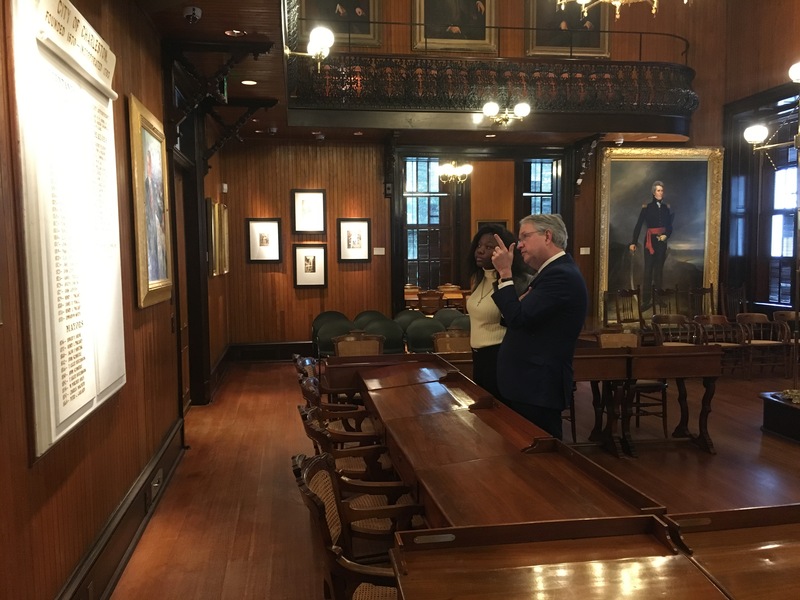 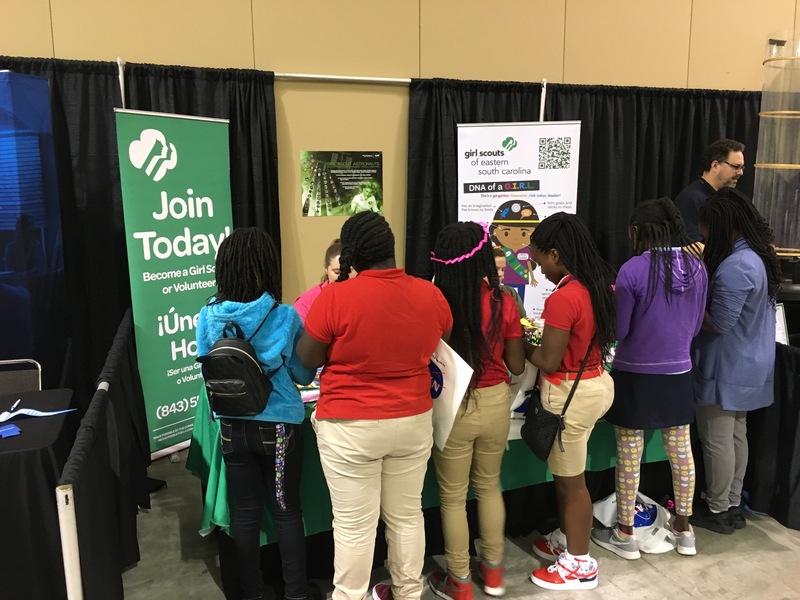 The City of Charleston Mayor’s Office for Children, Youth and Families sponsored a community service project for students in the Charleston County School District. 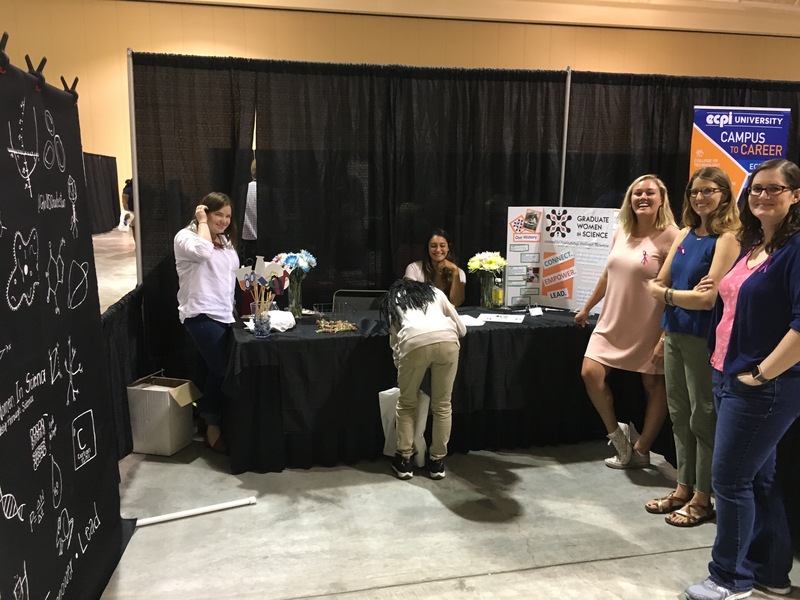 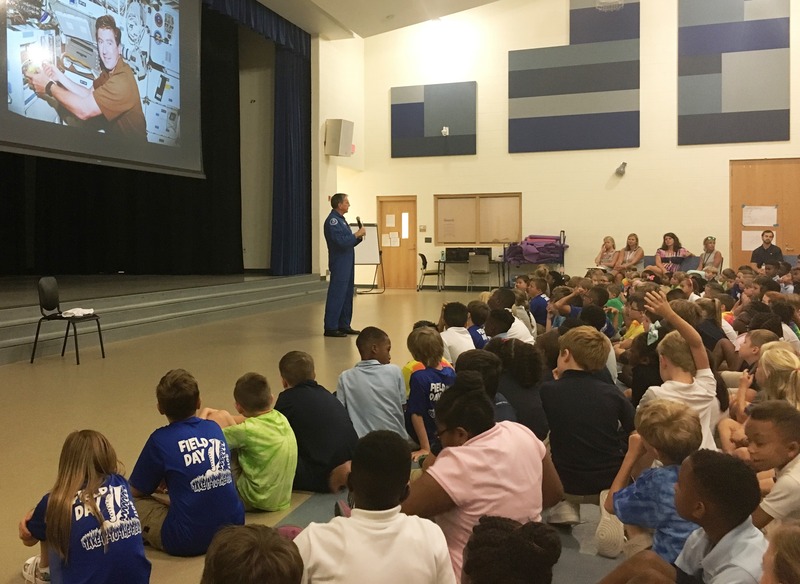 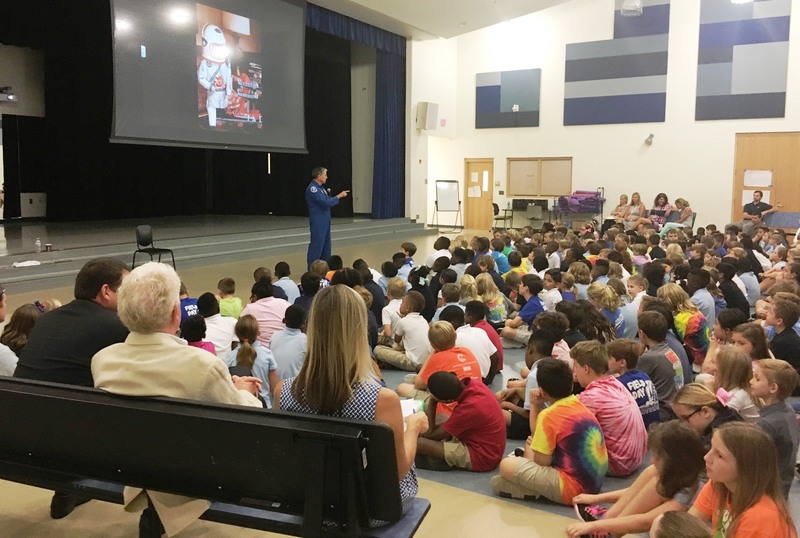 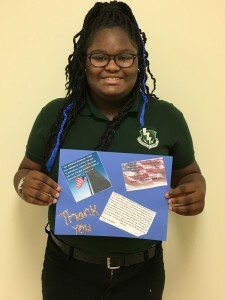 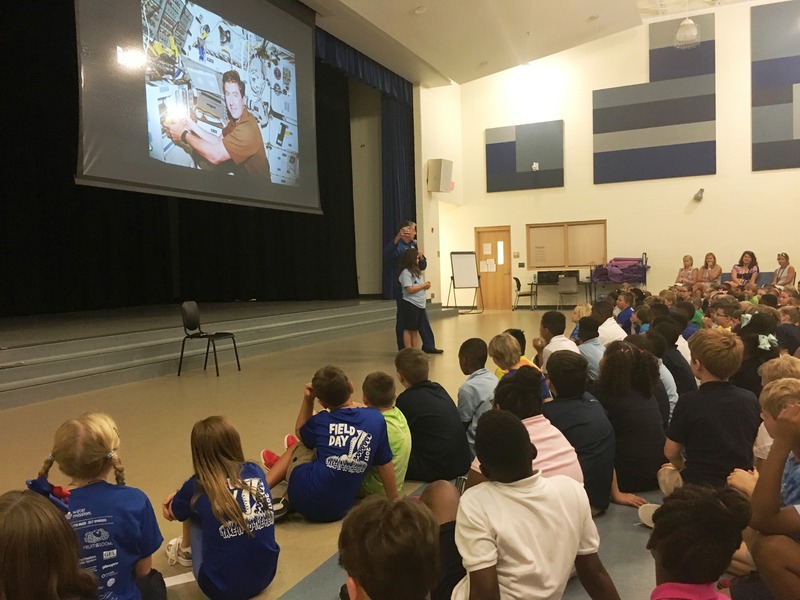 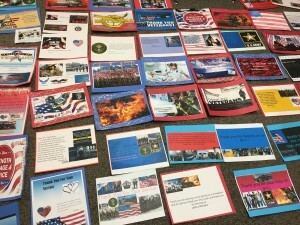 The local project was called the “Cards for the Courageous Campaign” in which youth, ages 5-25, were asked to make cards for first-responders, military members, and veterans in honor of the September 11 Day of Service. 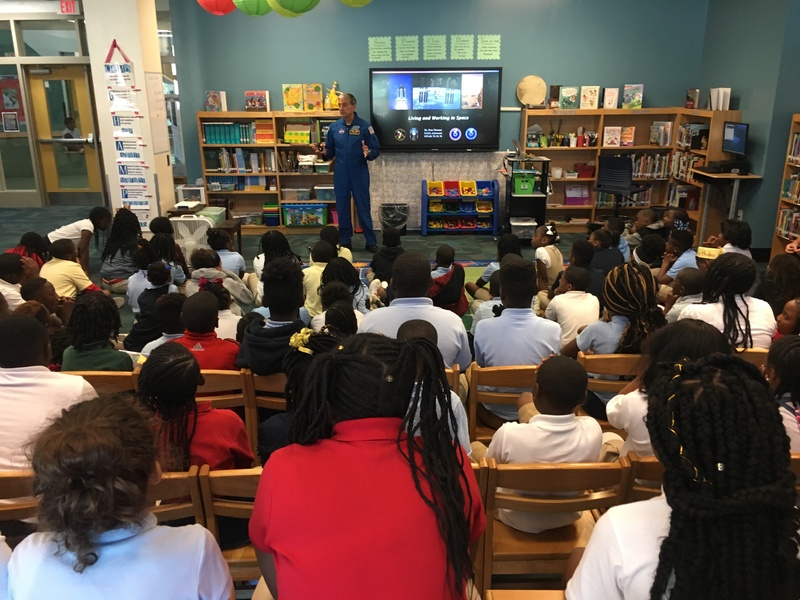 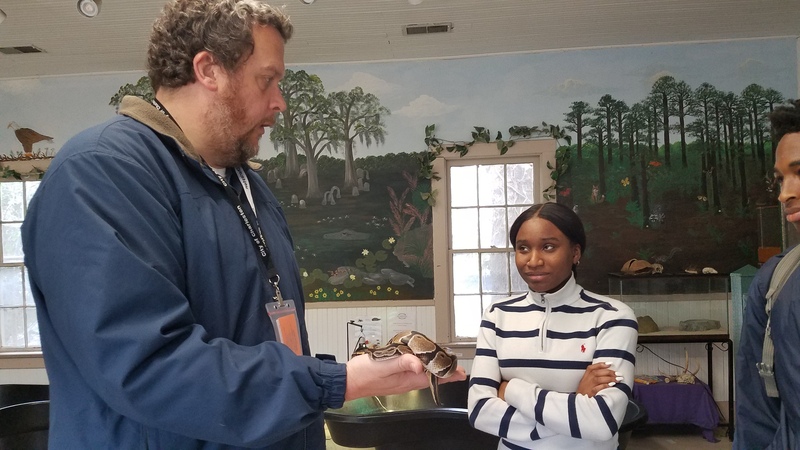 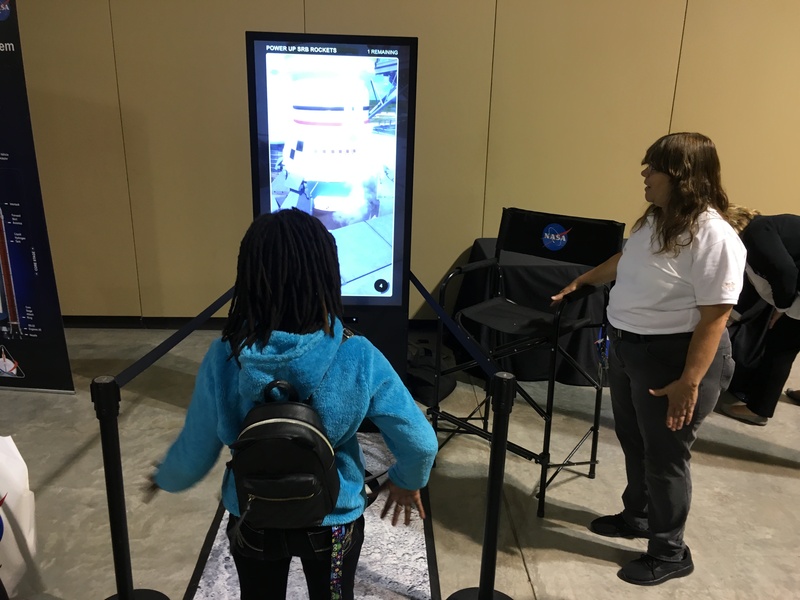 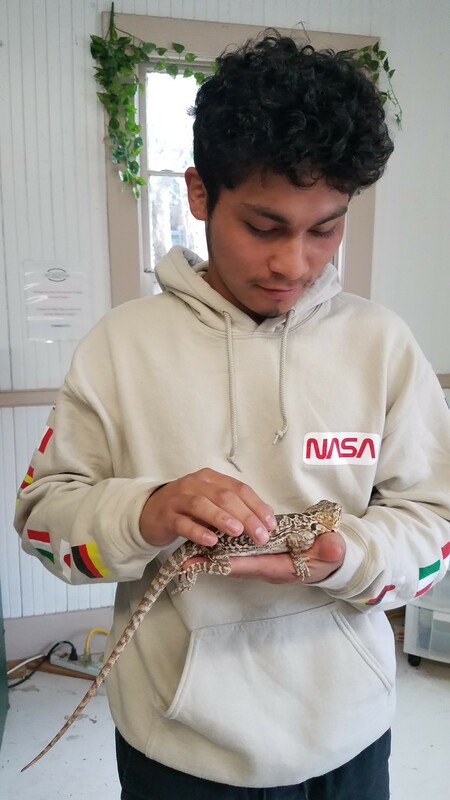 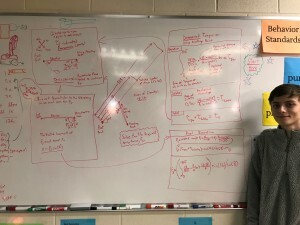 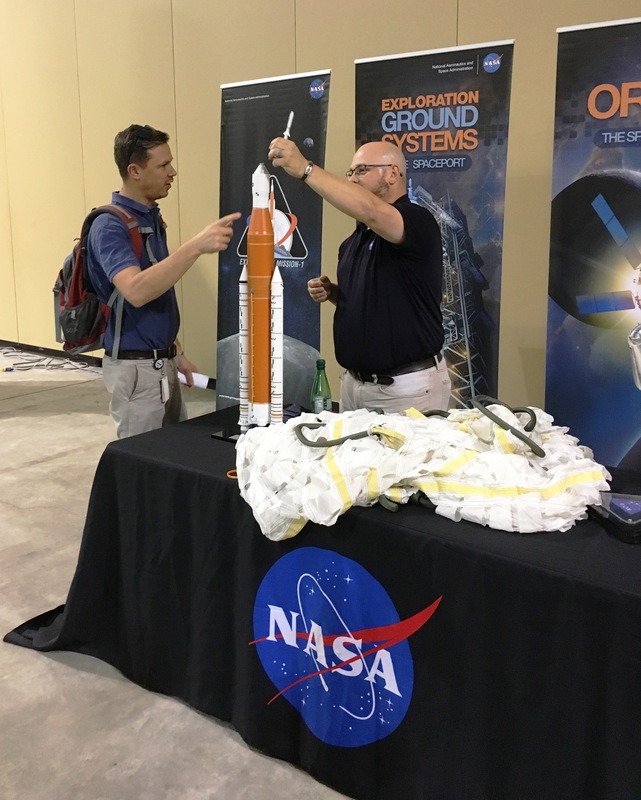 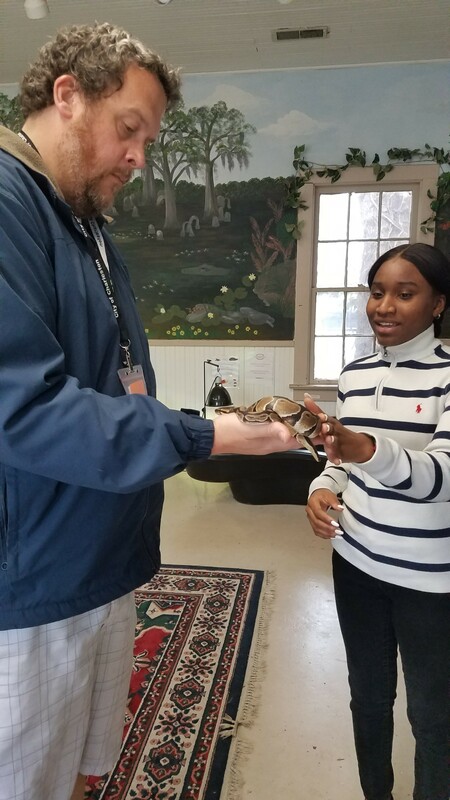 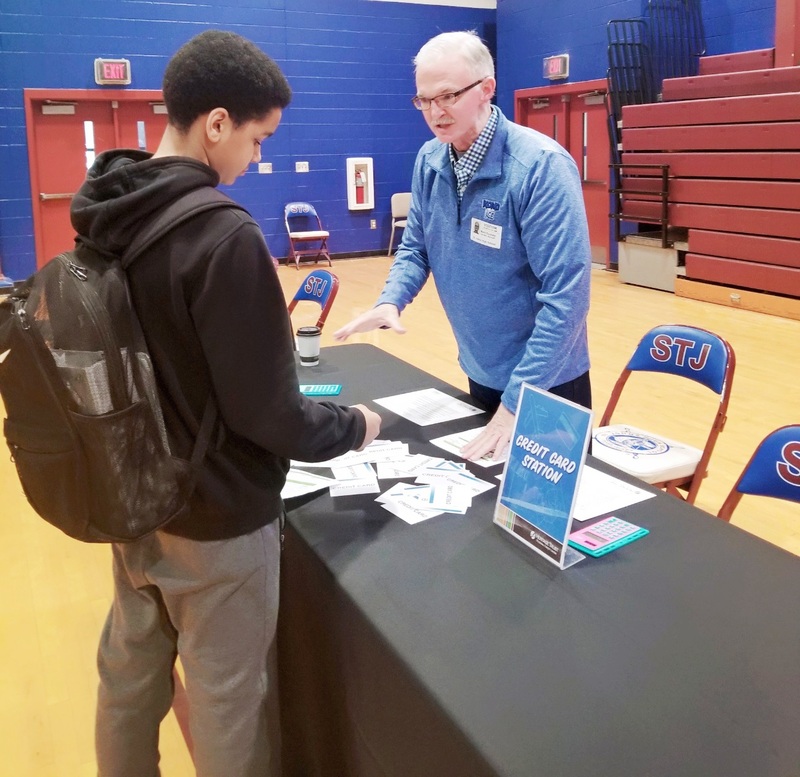 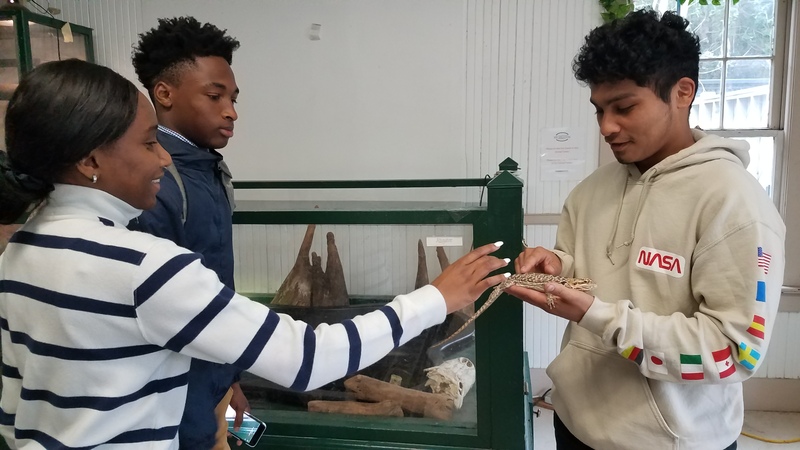 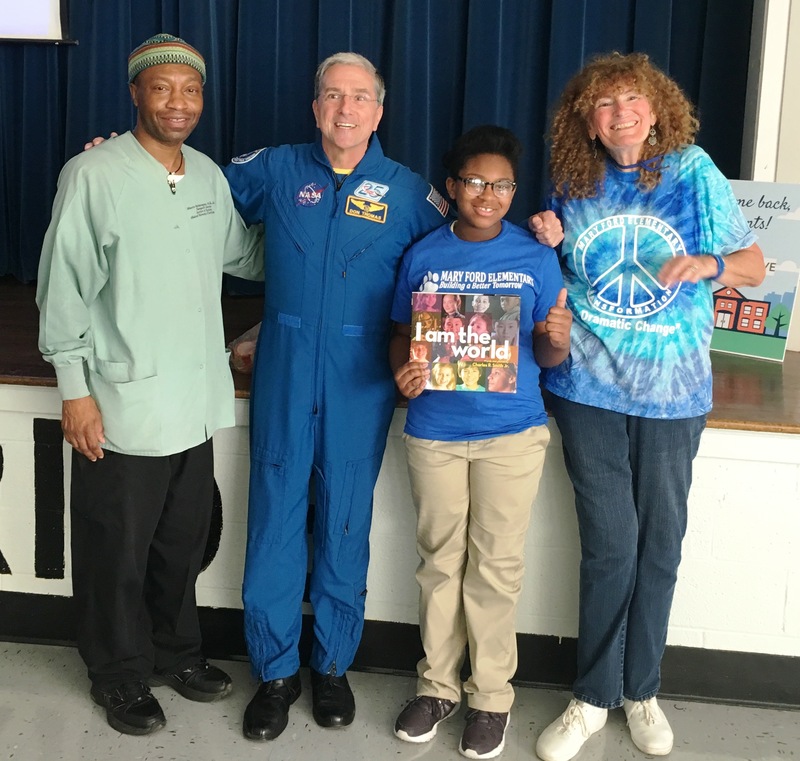 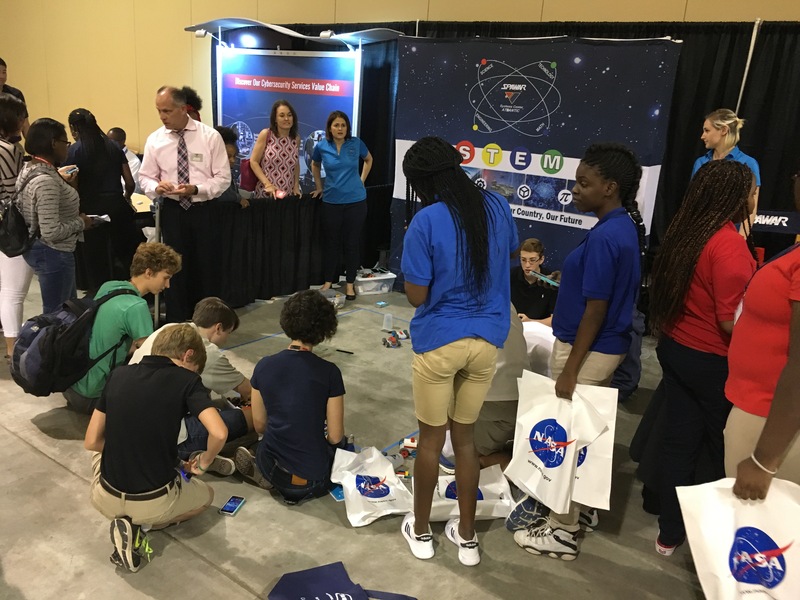 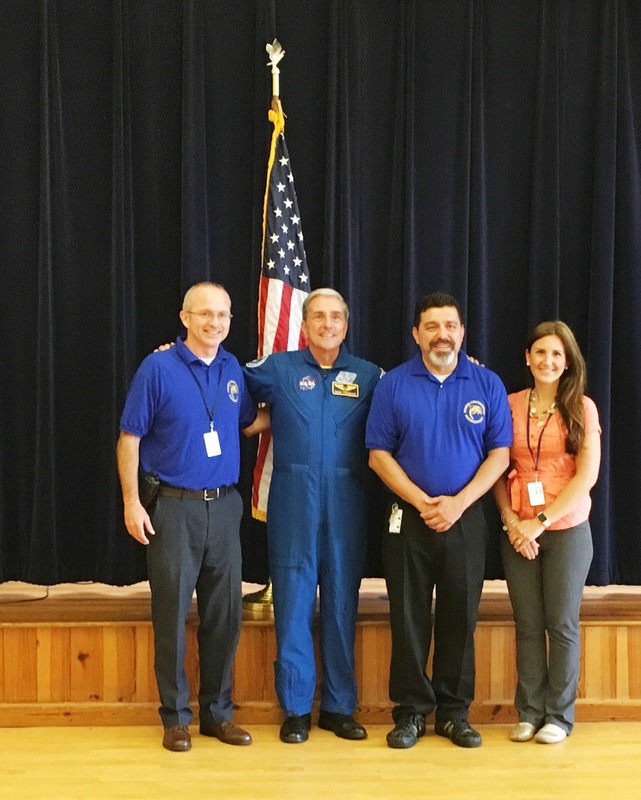 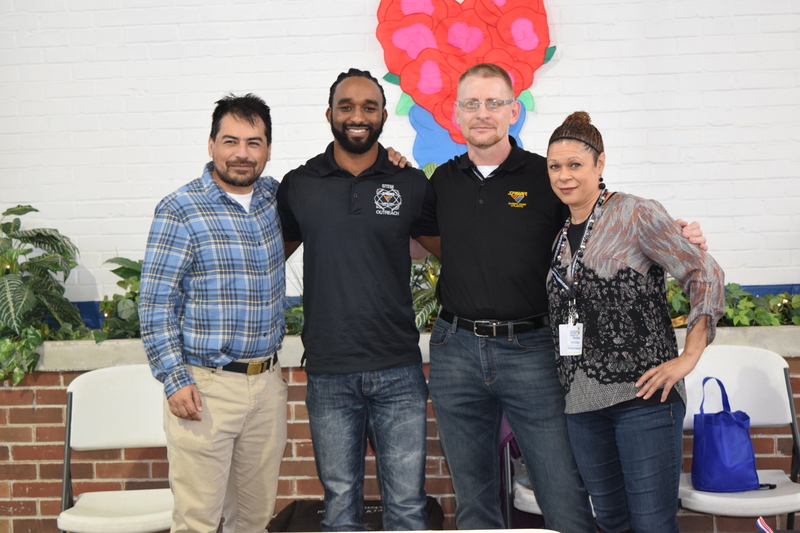 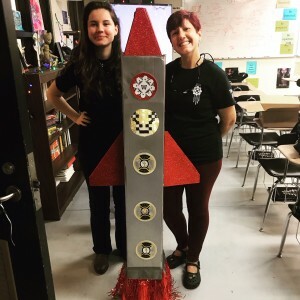 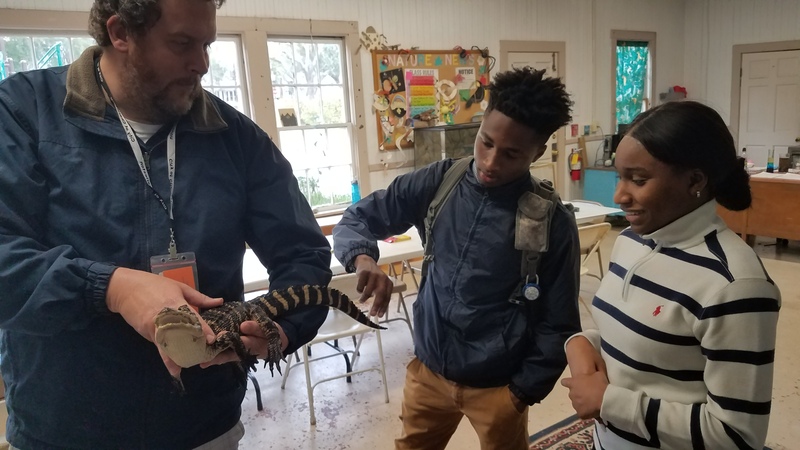 Three teachers at Jerry Zucker Middle School of Science, Ms. Michaels, Mr. Fast, and Ms. Gerideau-Grant, decided to collaborate on the project. 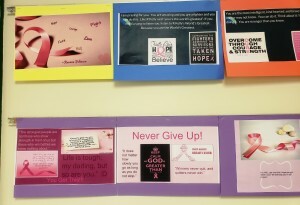 The middle school students in the Art, PLTW Pre-Engineering, and Computer Applications classes created original cards. 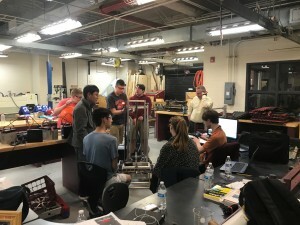 Thanks to everyone that made this project possible!